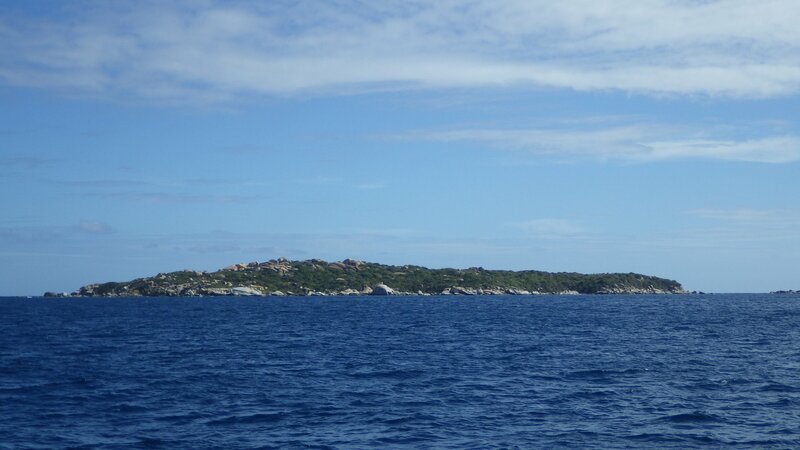 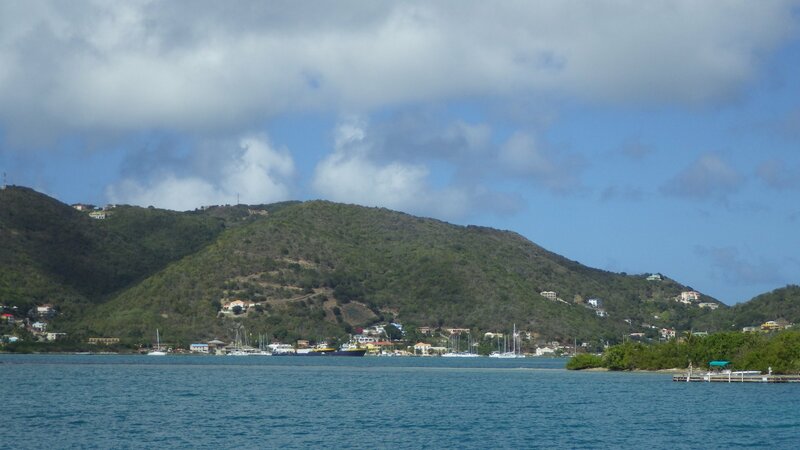 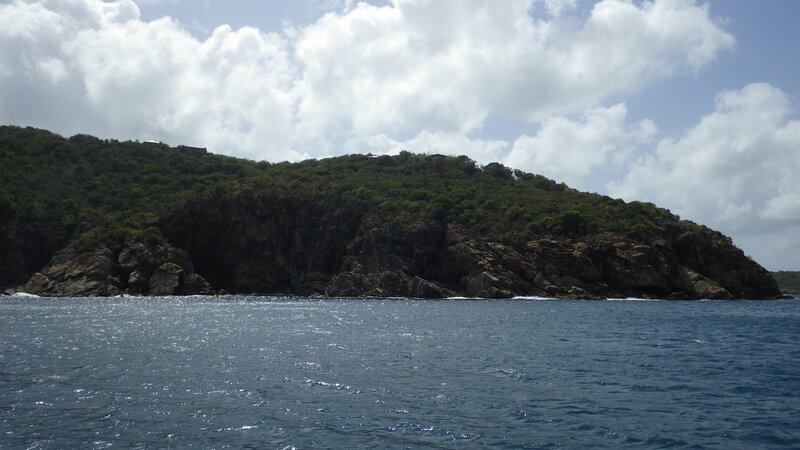 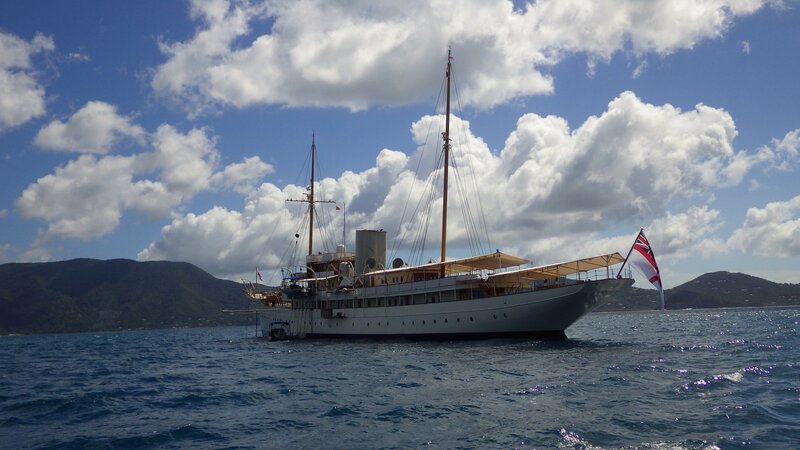 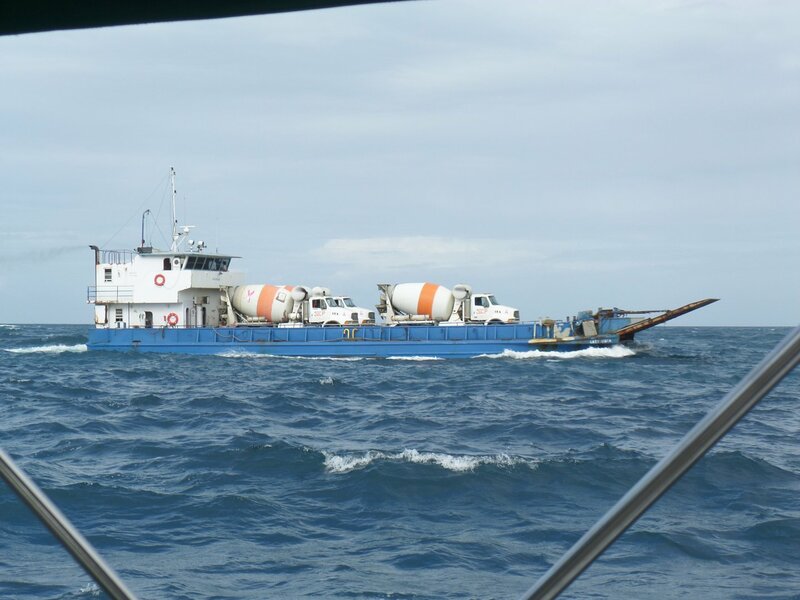 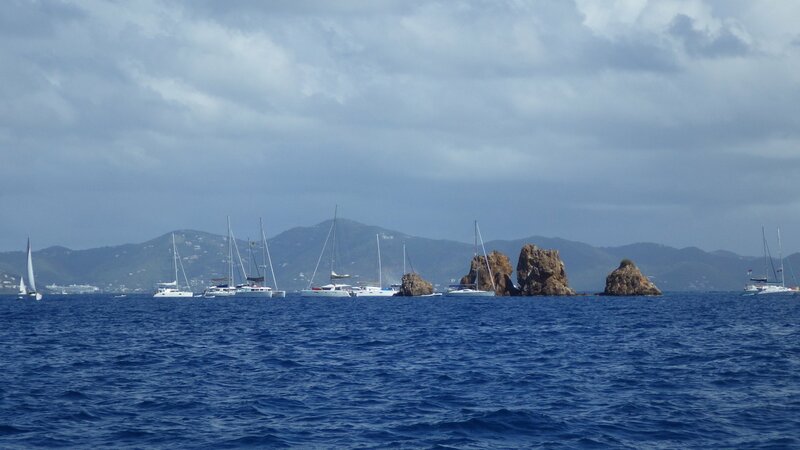 We first arrived at Sopers Hole / West End to clear into British Virgin Islands. 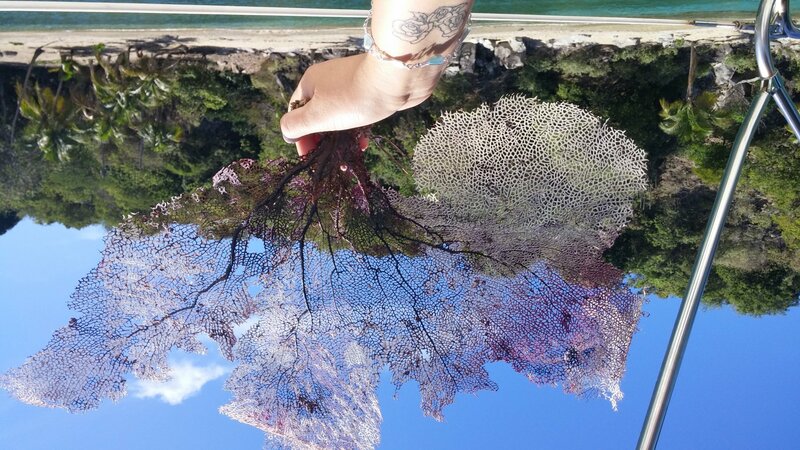 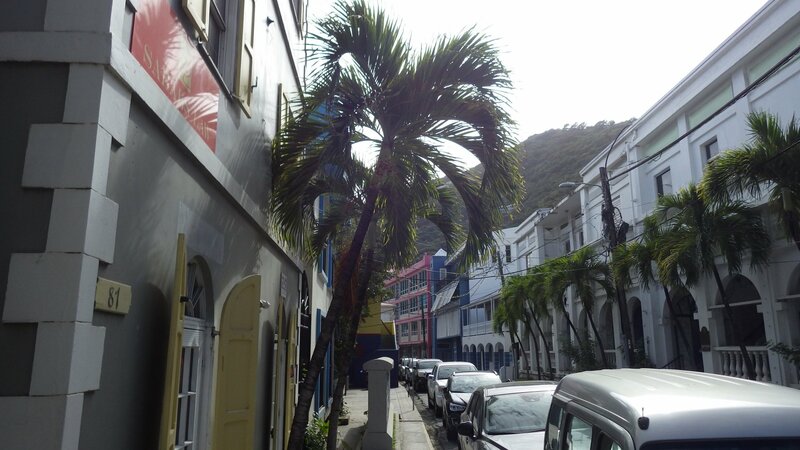 That day we had a stroll around the bay, visiting local souvenir shops and grocery store. 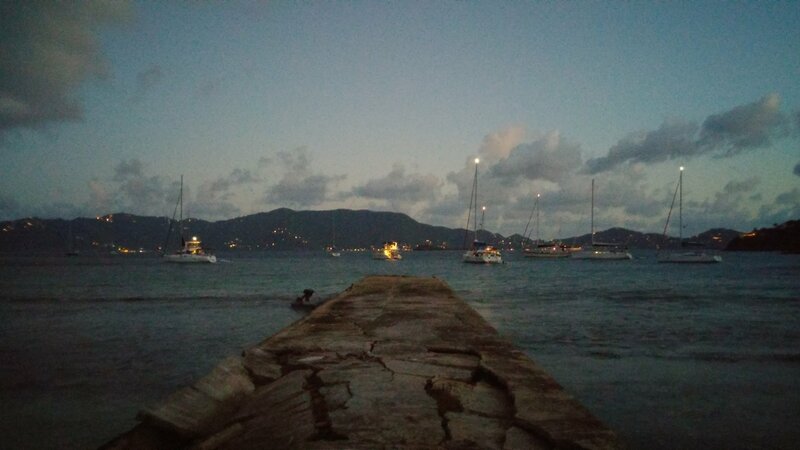 There was an electricity outage in town so we couldn't get any wi-fi connection. 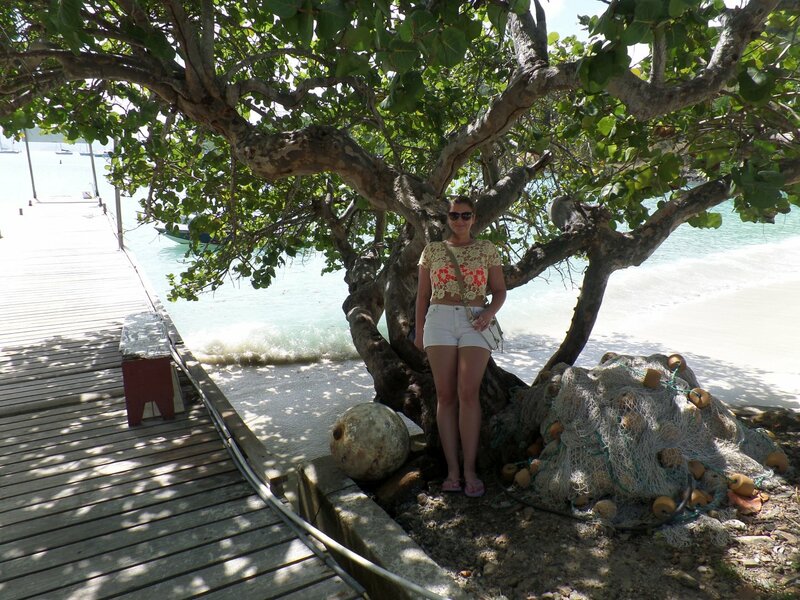 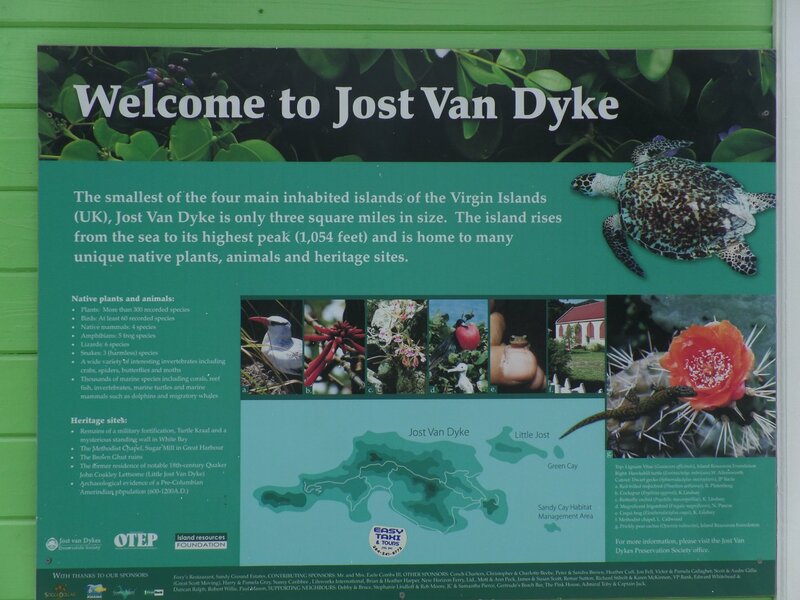 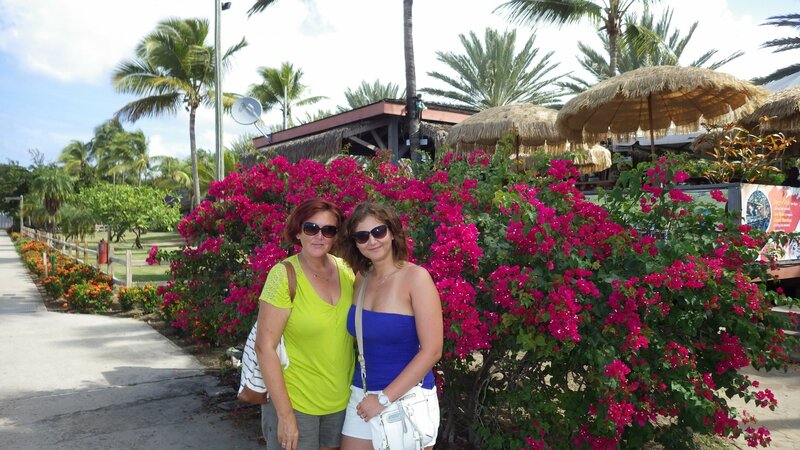 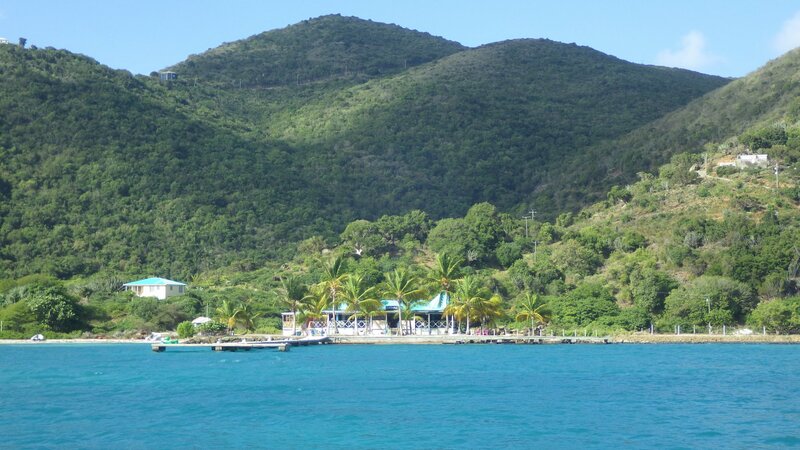 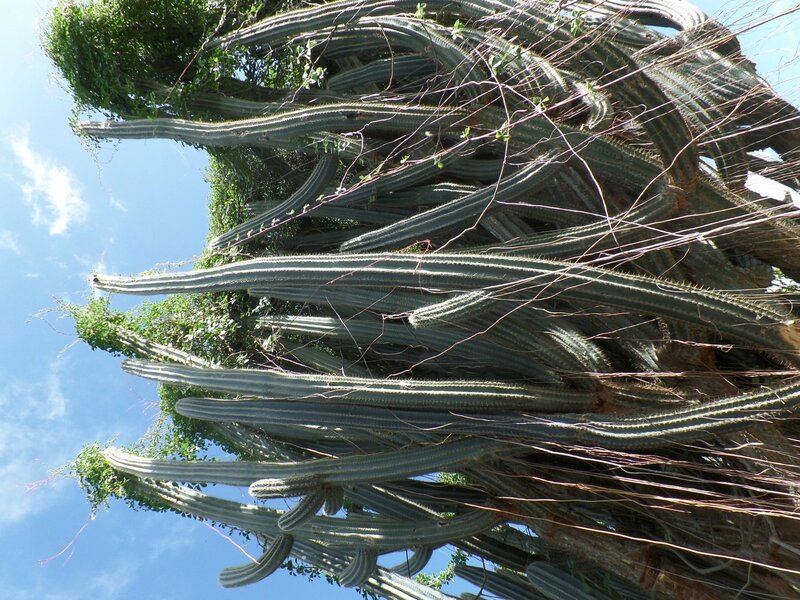 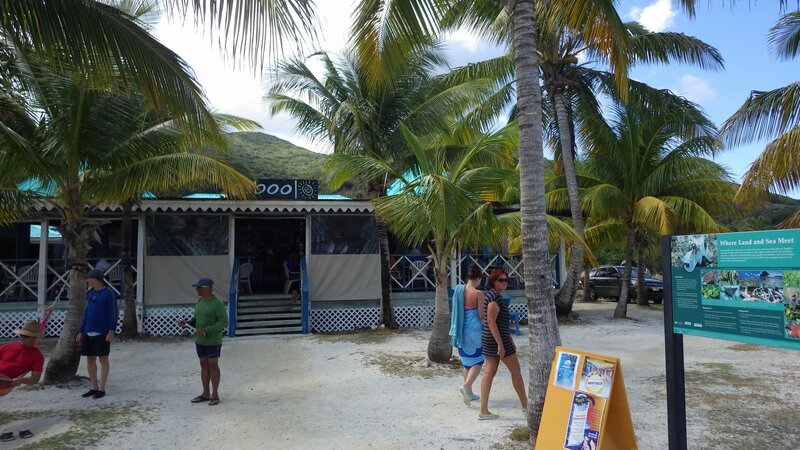 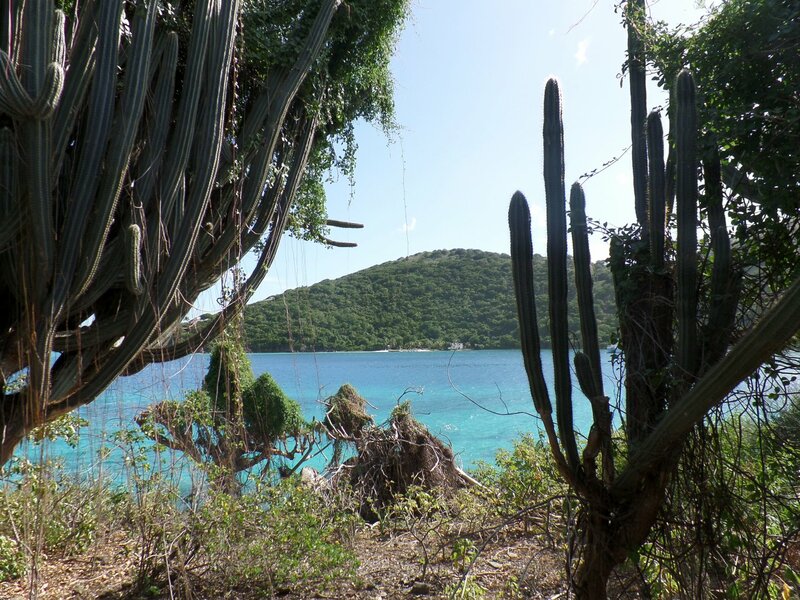 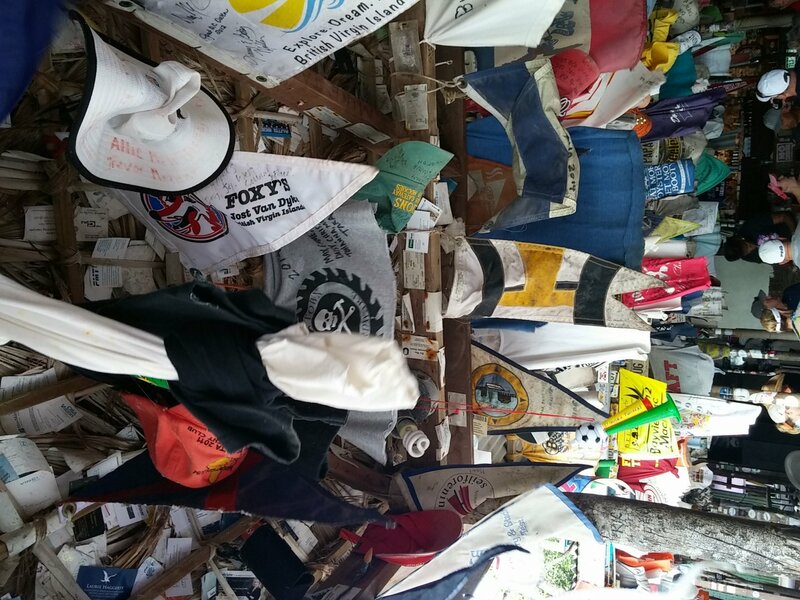 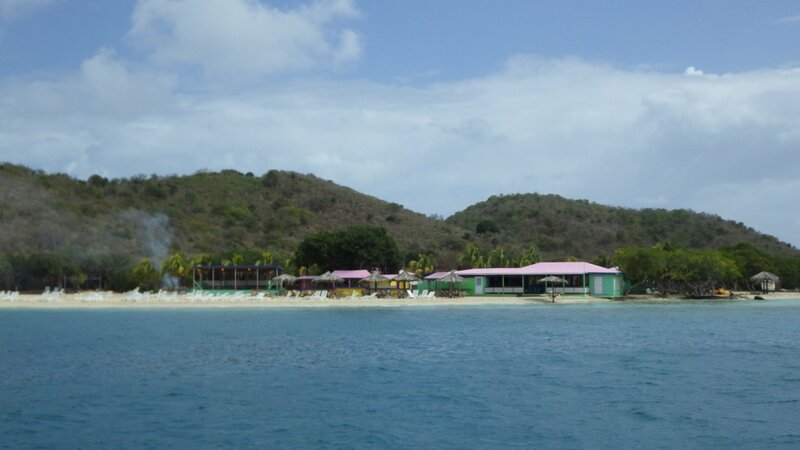 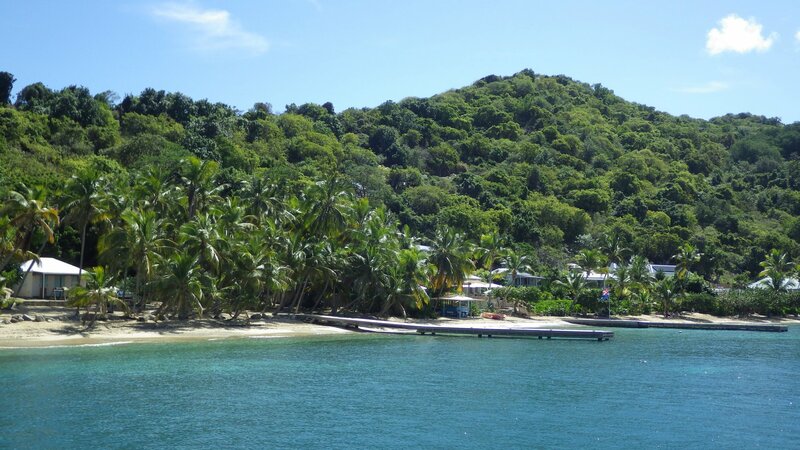 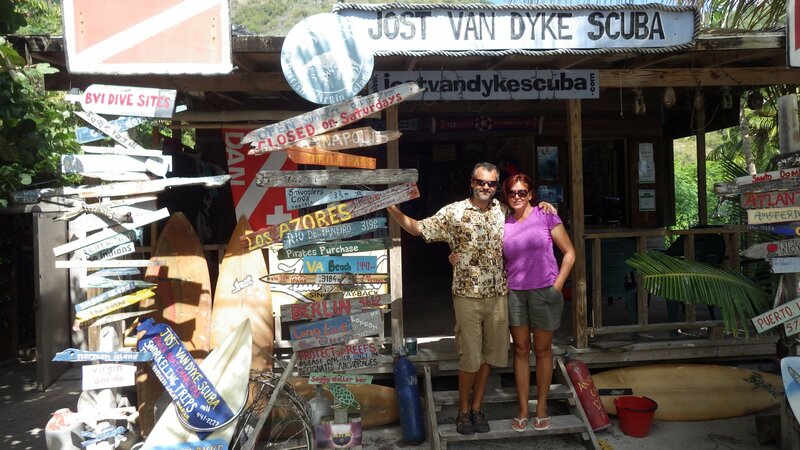 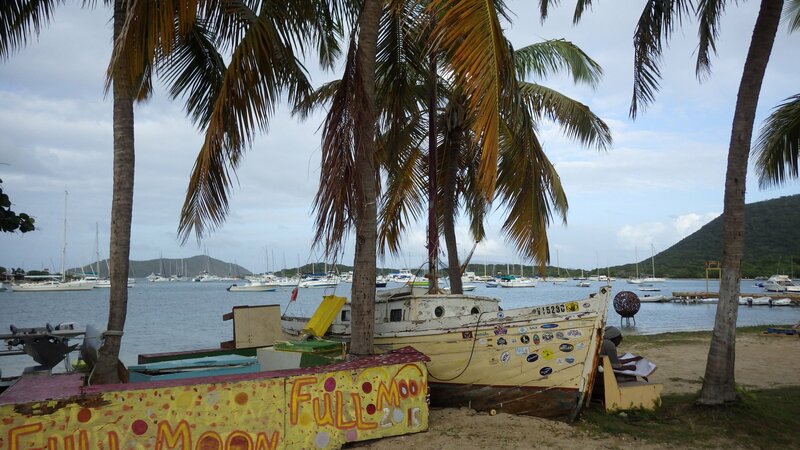 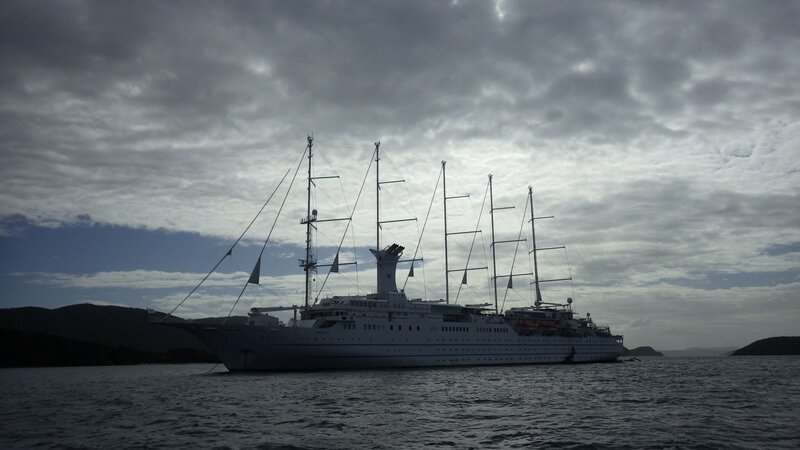 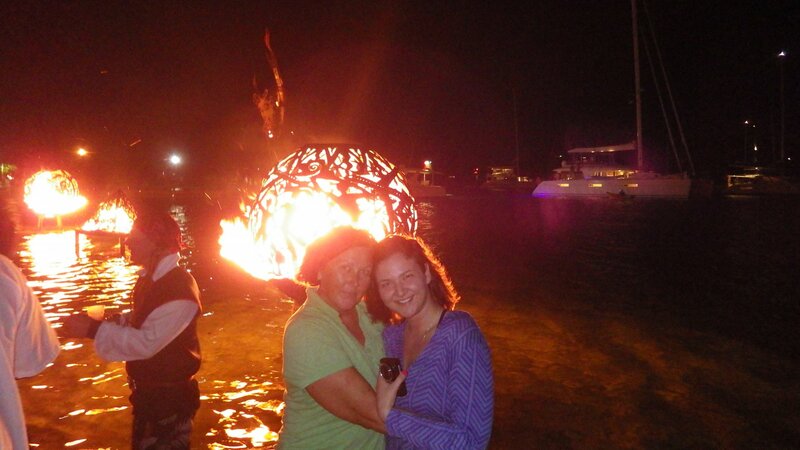 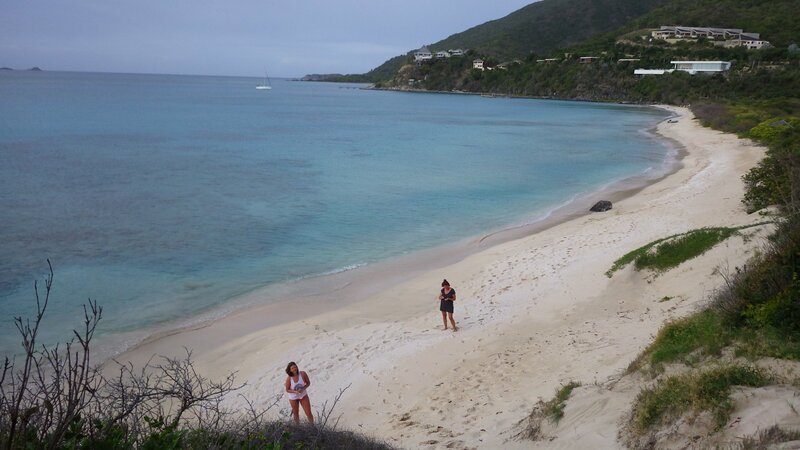 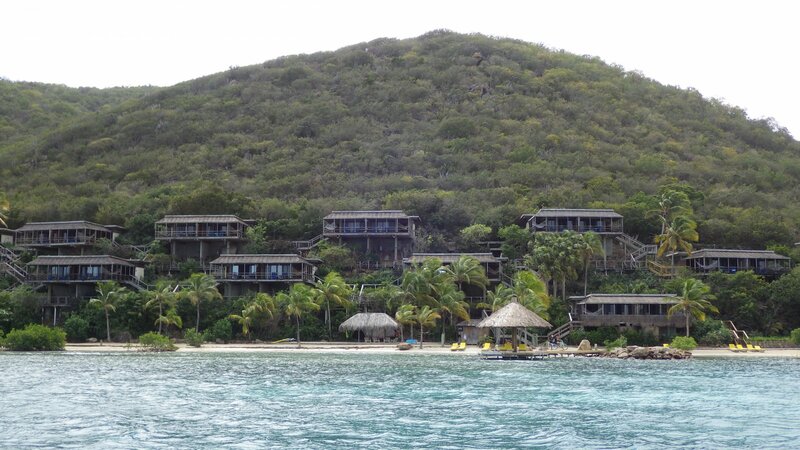 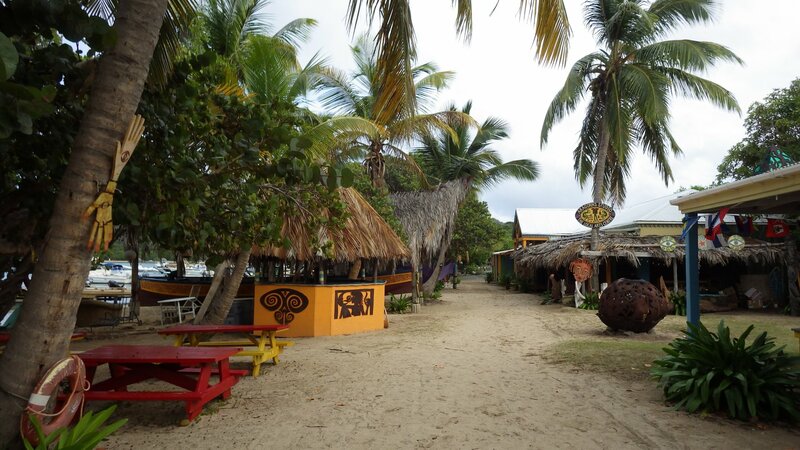 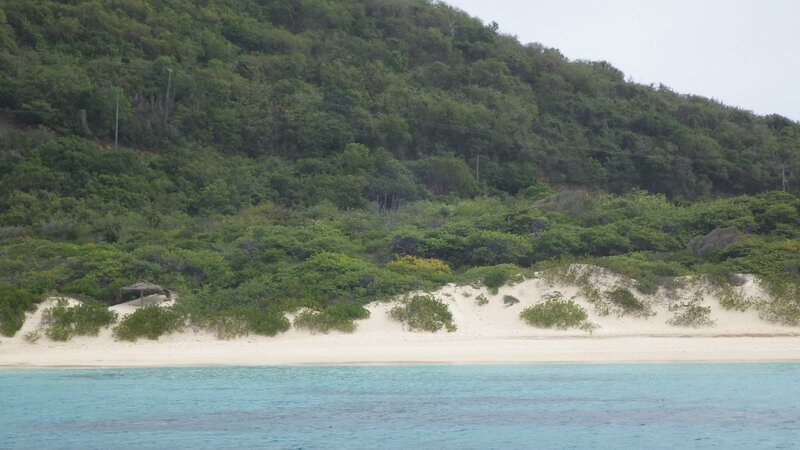 Then we visited this place with our daughter on our way from Jost Van Dyke island. Not much here except customs office, marina, shops and restaurant for tourists, but the setting is pleasant. 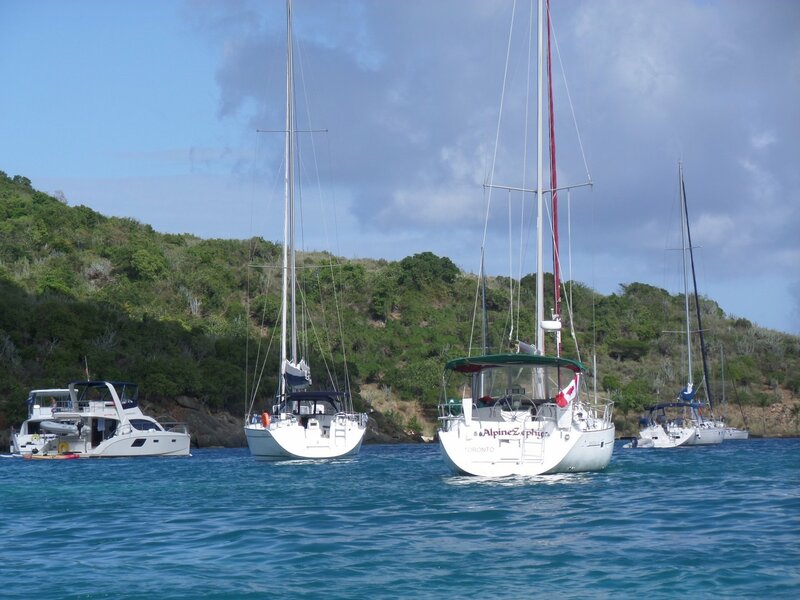 Mooring balls are free for the short day stop and paid to stay overnight. 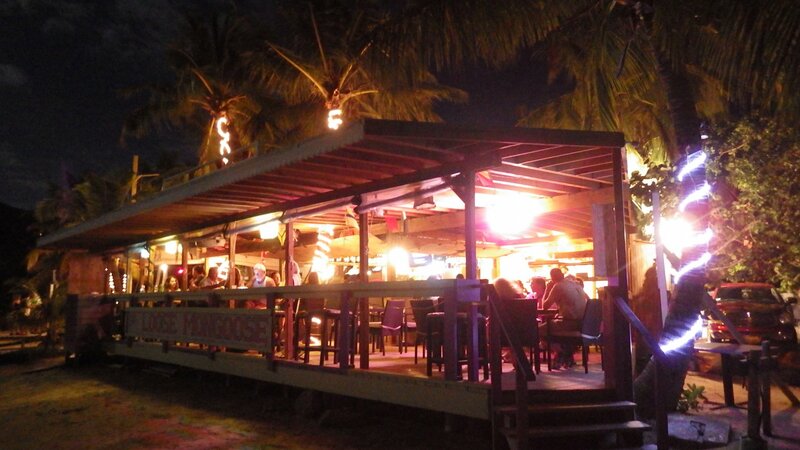 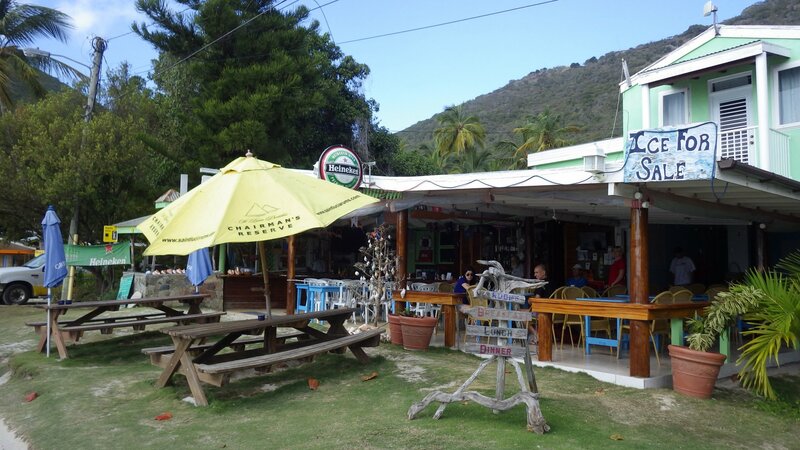 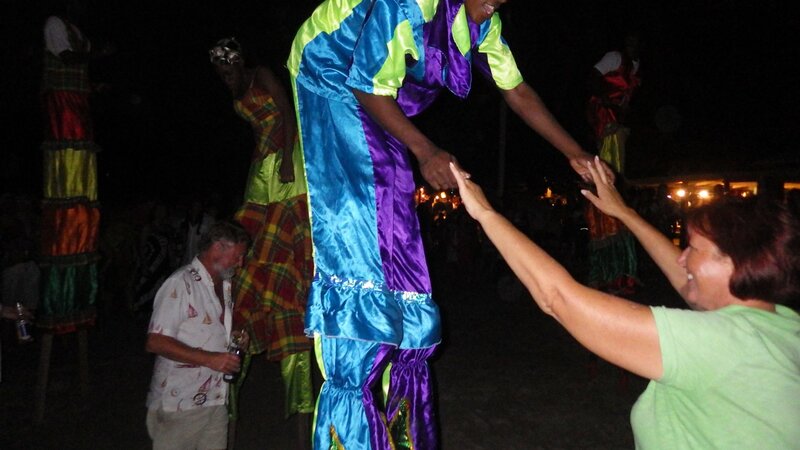 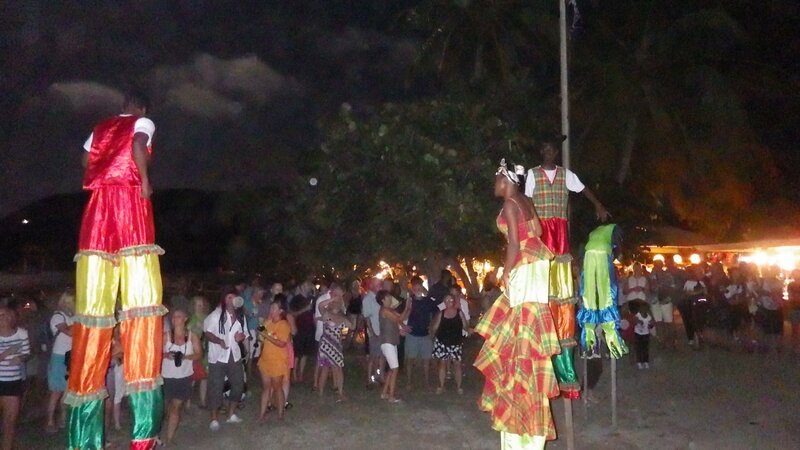 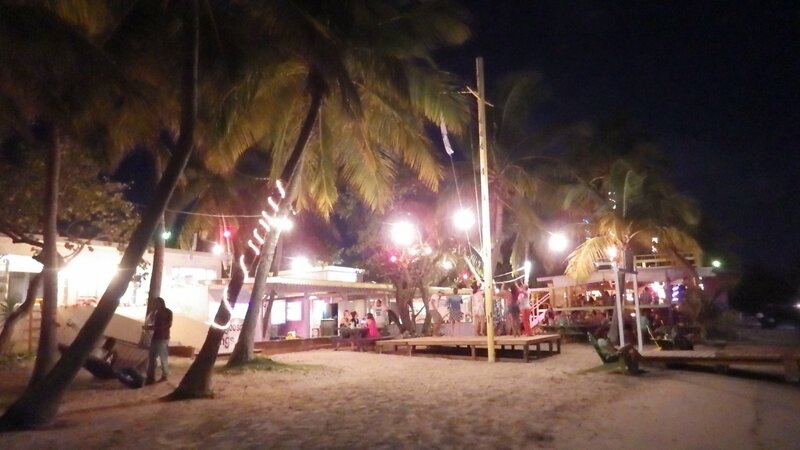 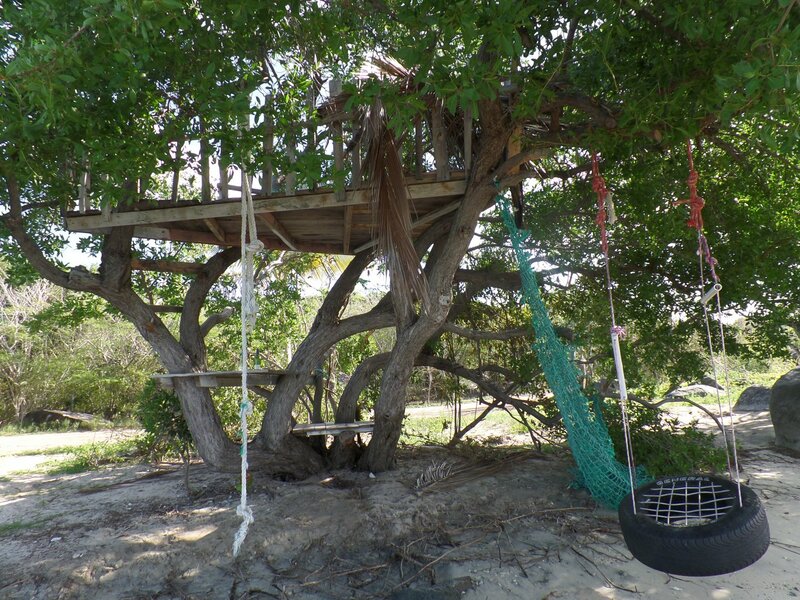 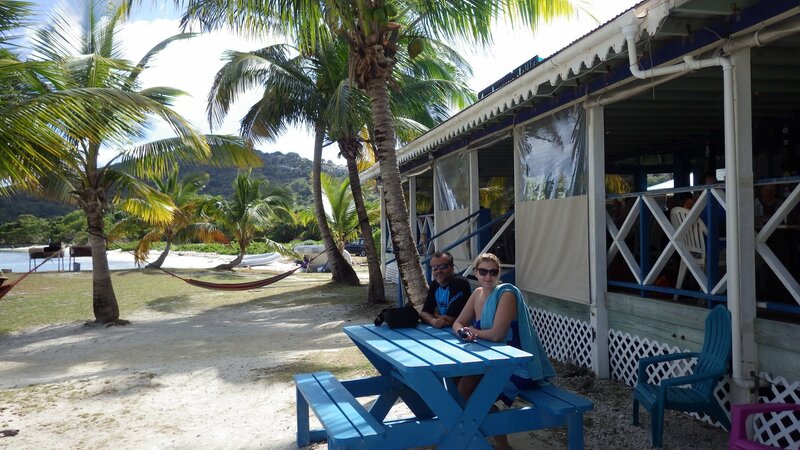 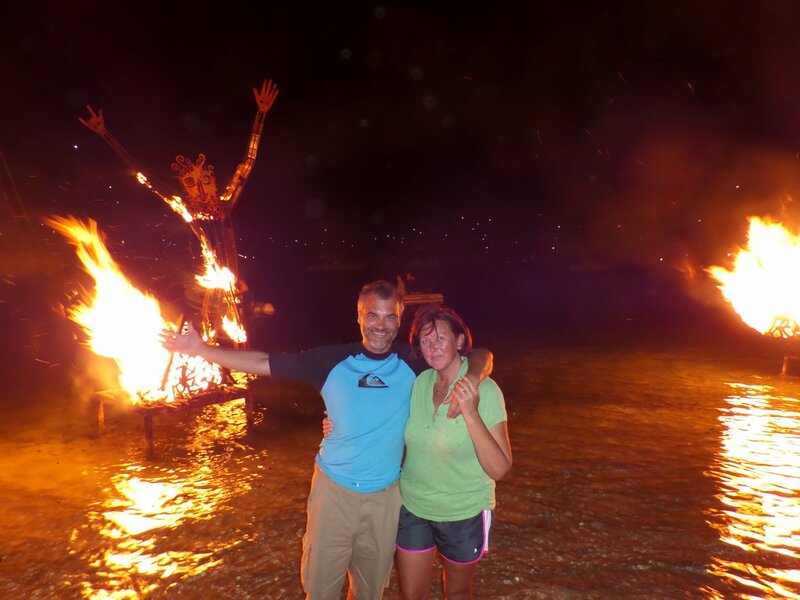 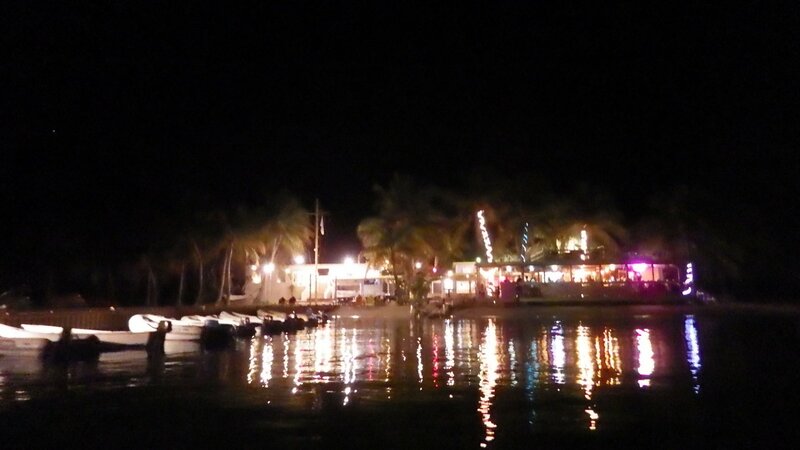 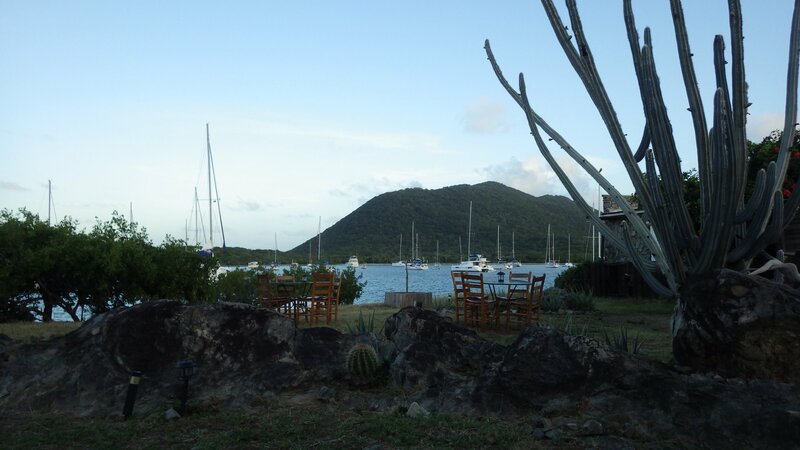 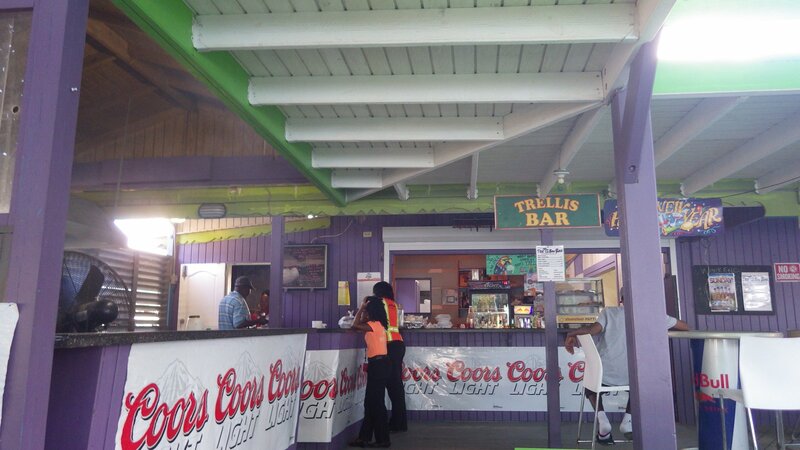 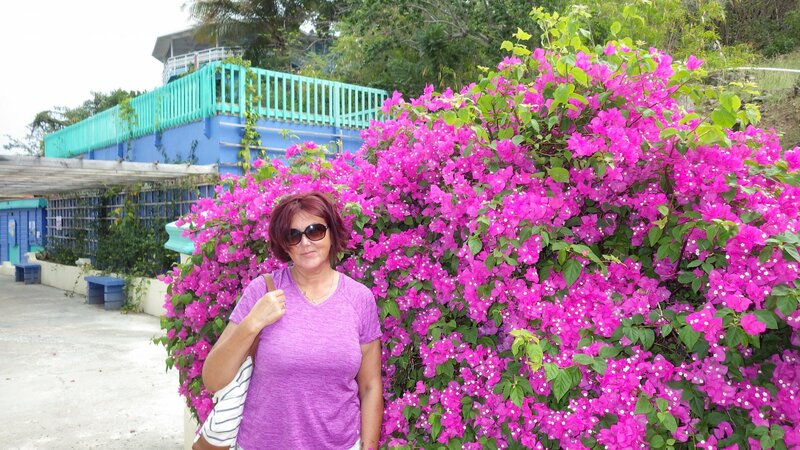 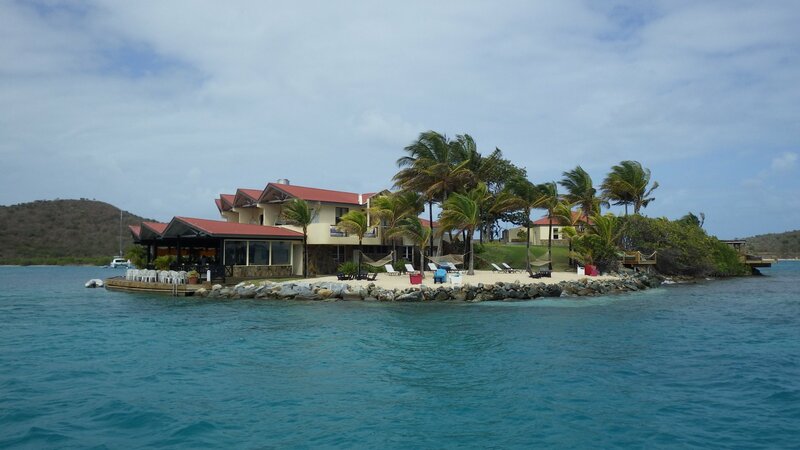 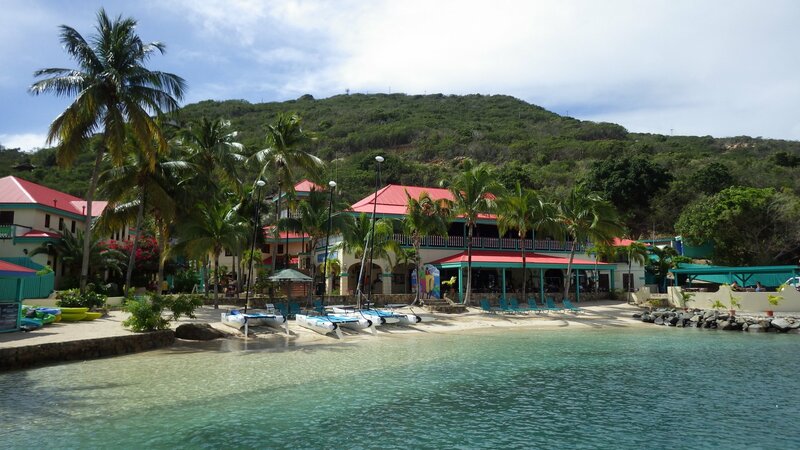 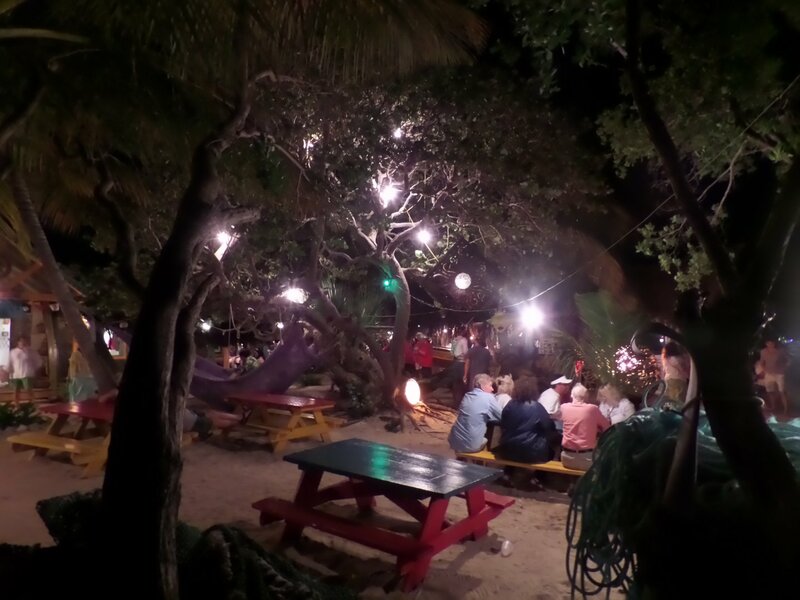 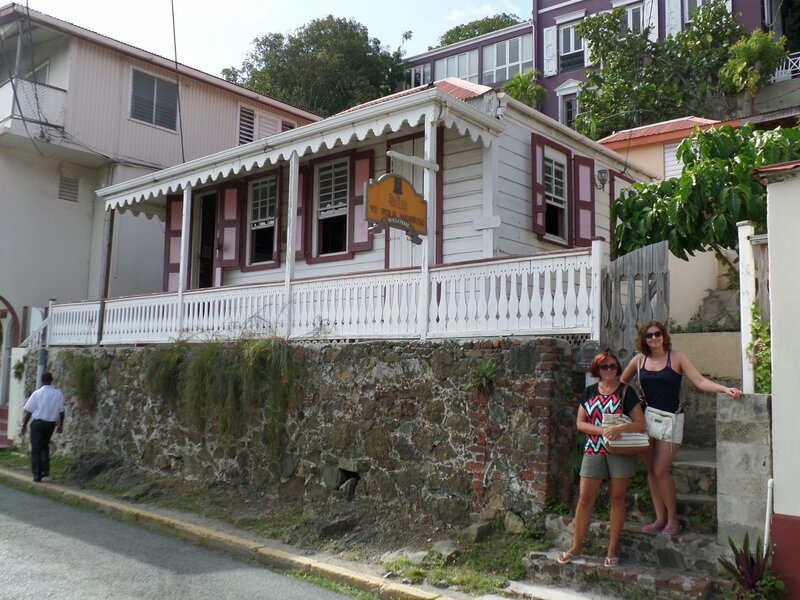 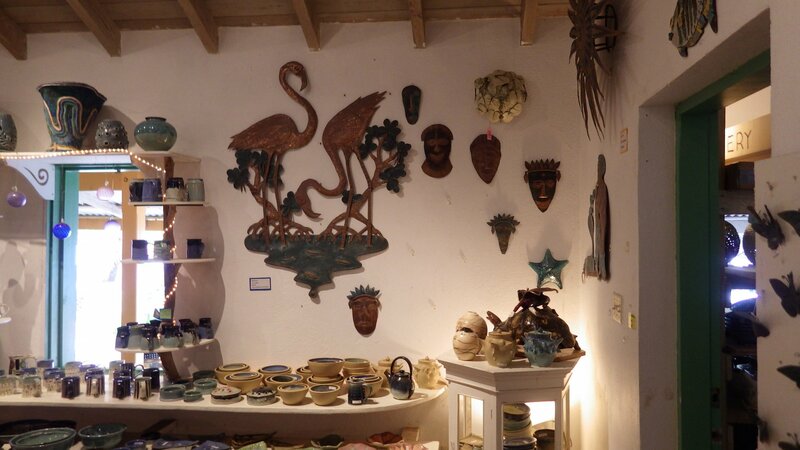 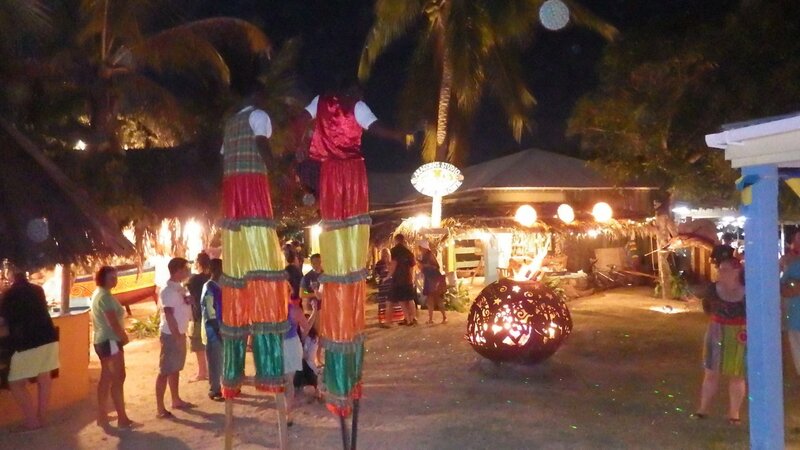 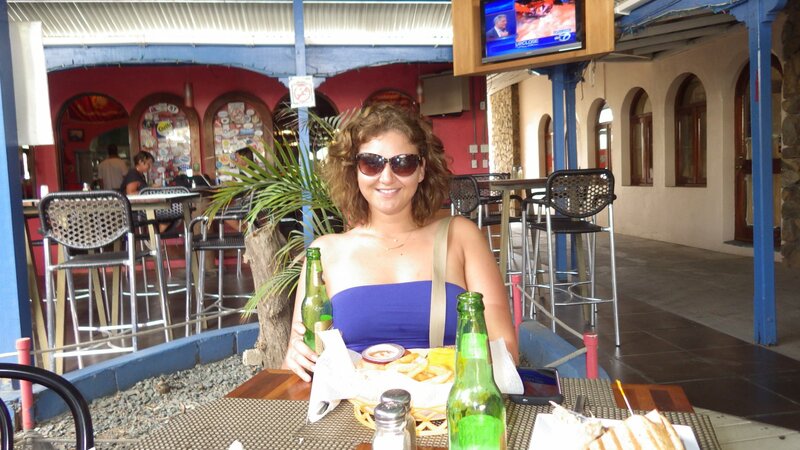 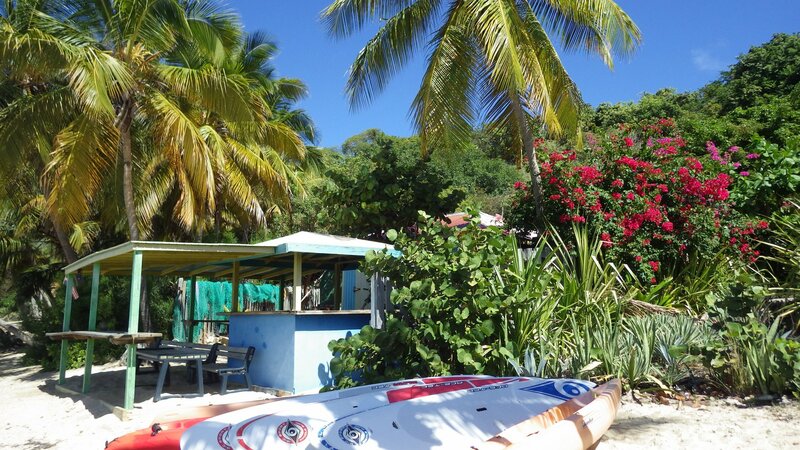 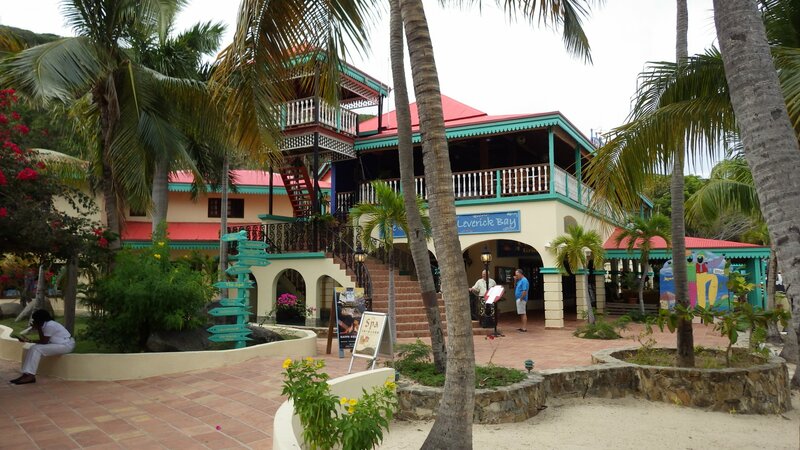 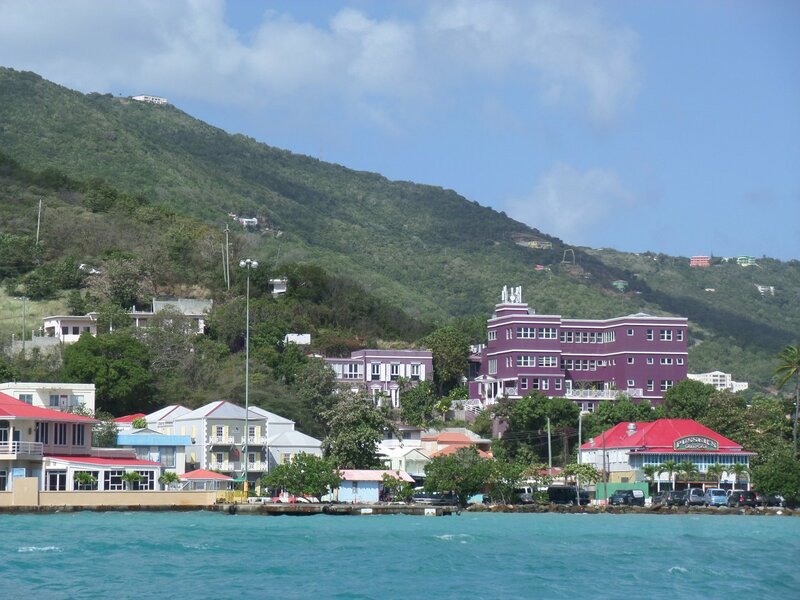 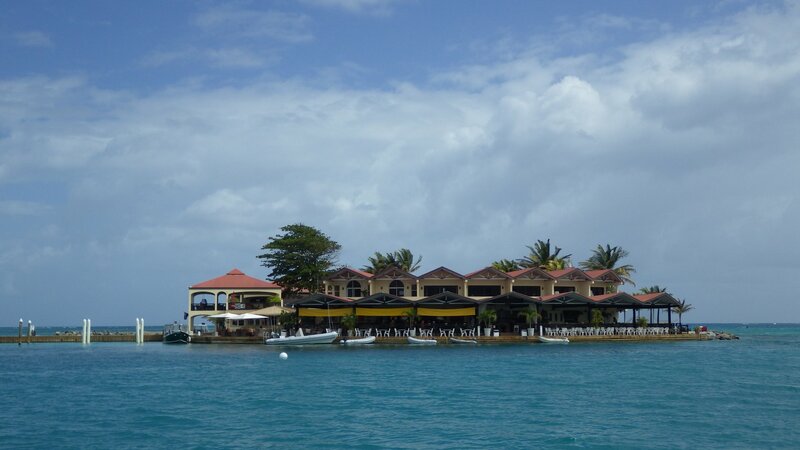 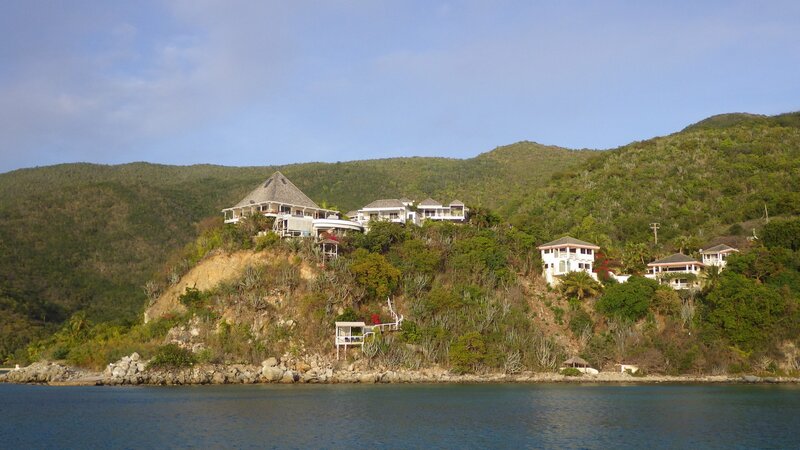 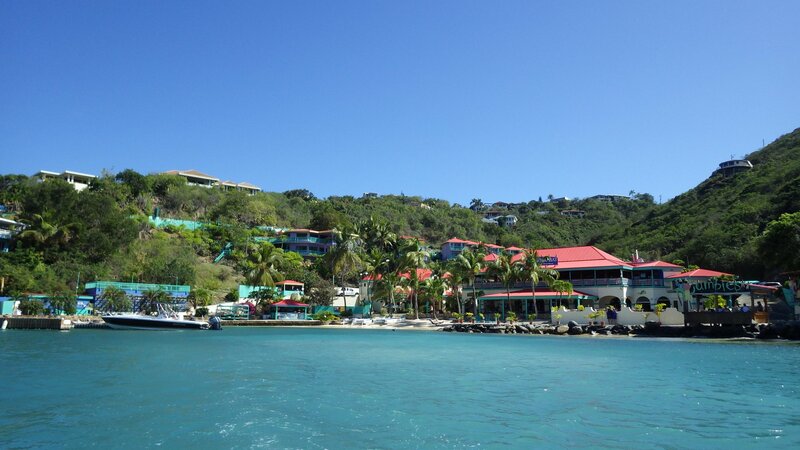 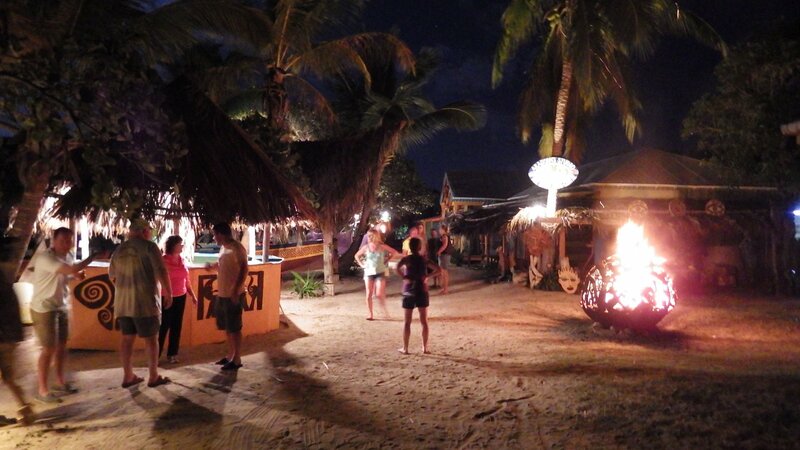 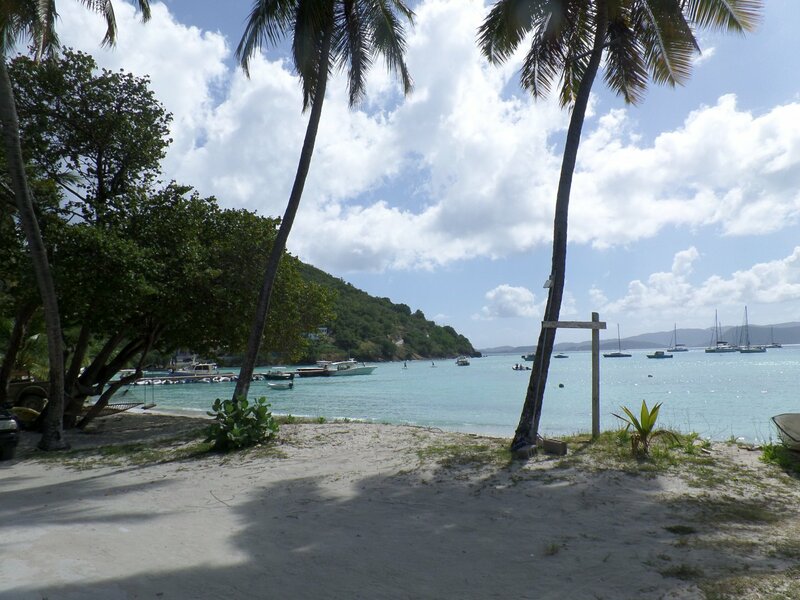 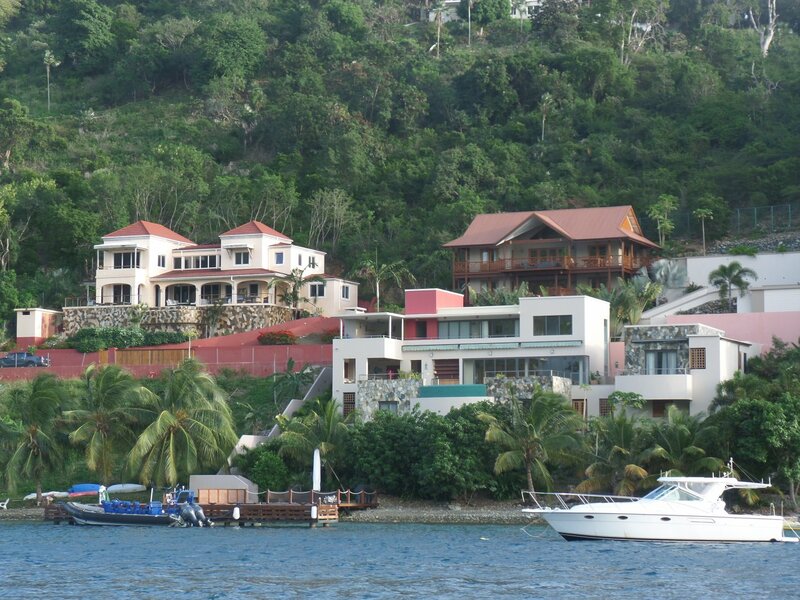 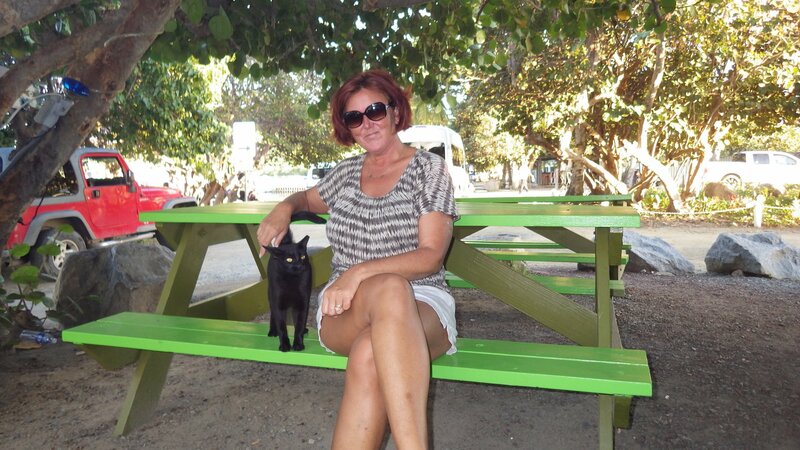 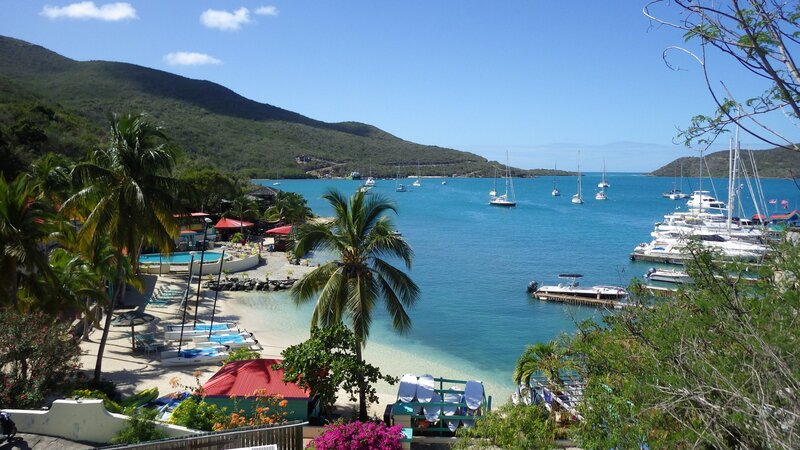 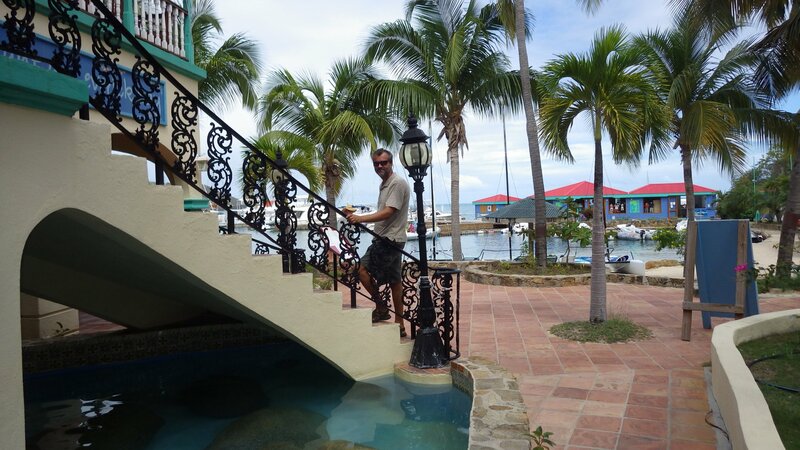 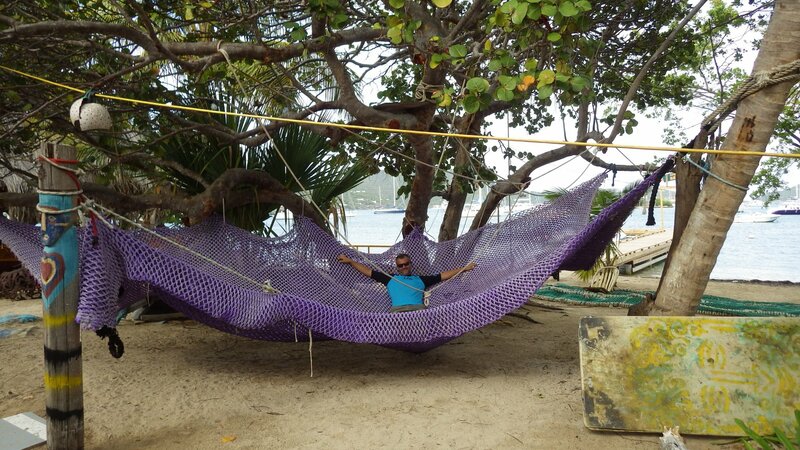 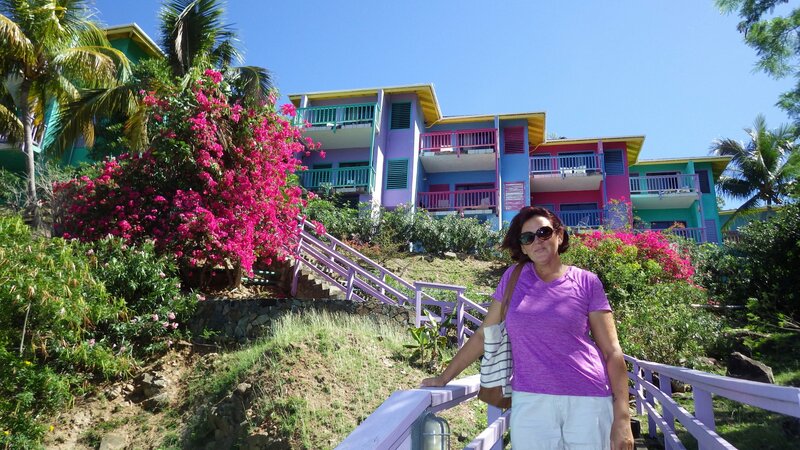 We stayed on several occasions at Road Town, BVI' capital. 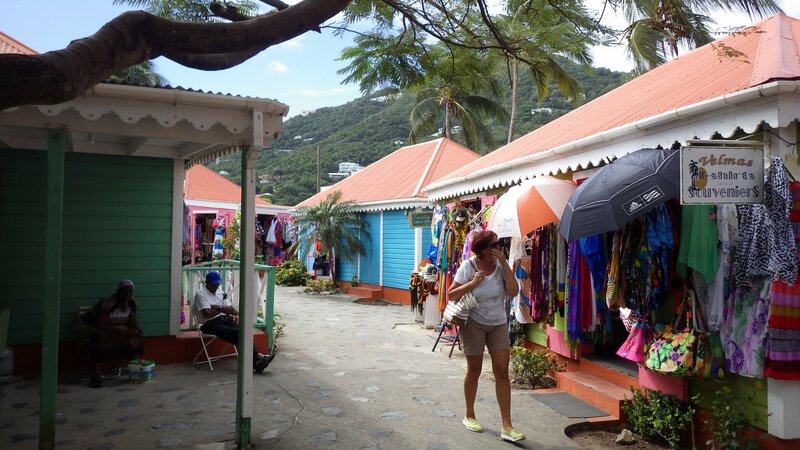 Just exploring the place, wondering streets, eating out, browsing souvenir shops, picking up supplies and doing some chores. 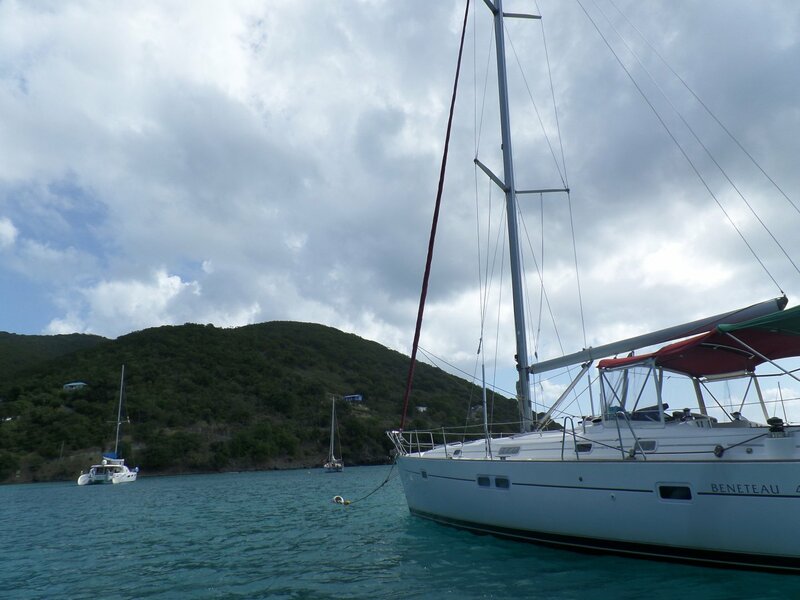 We also picked up our new mainsail here. 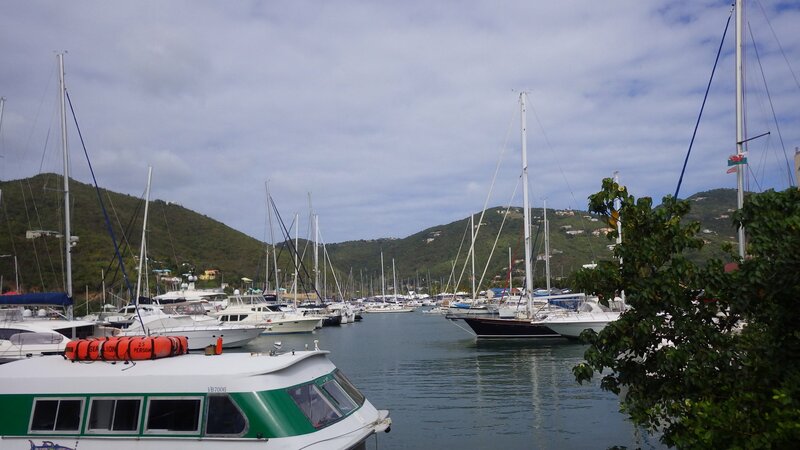 Unfortunately, there is no good place to anchor in the harbour, the anchorage is quite open and there is no proper public dinghy dock. 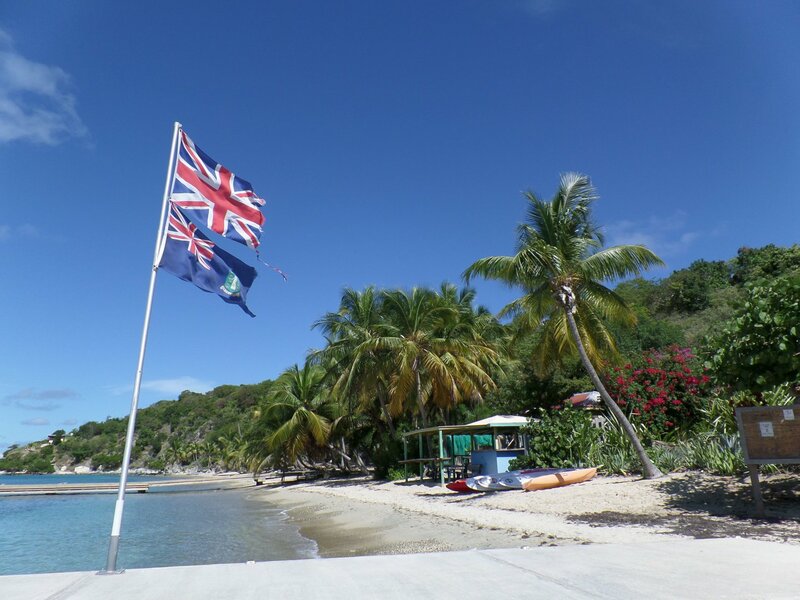 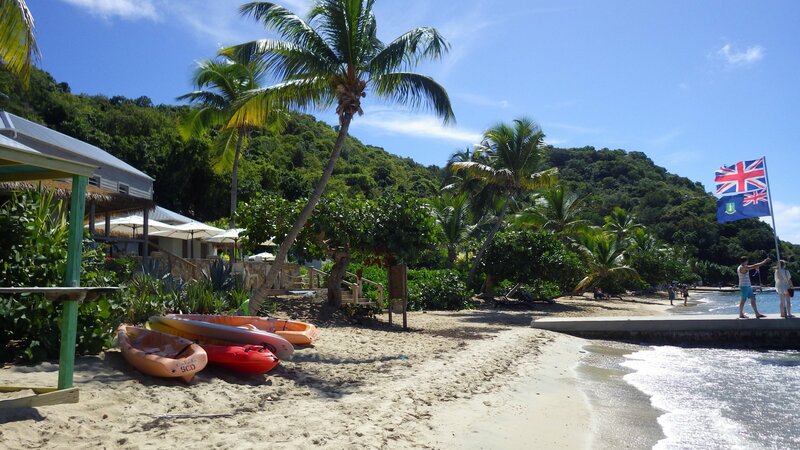 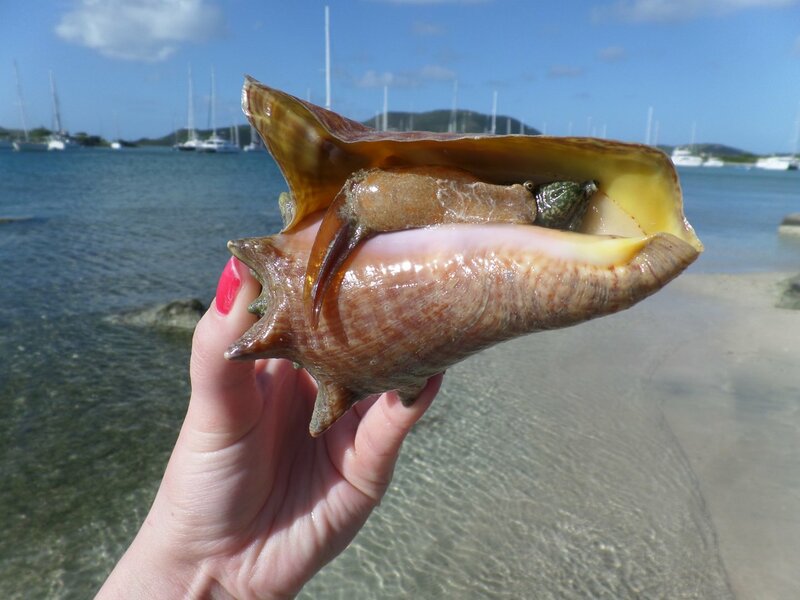 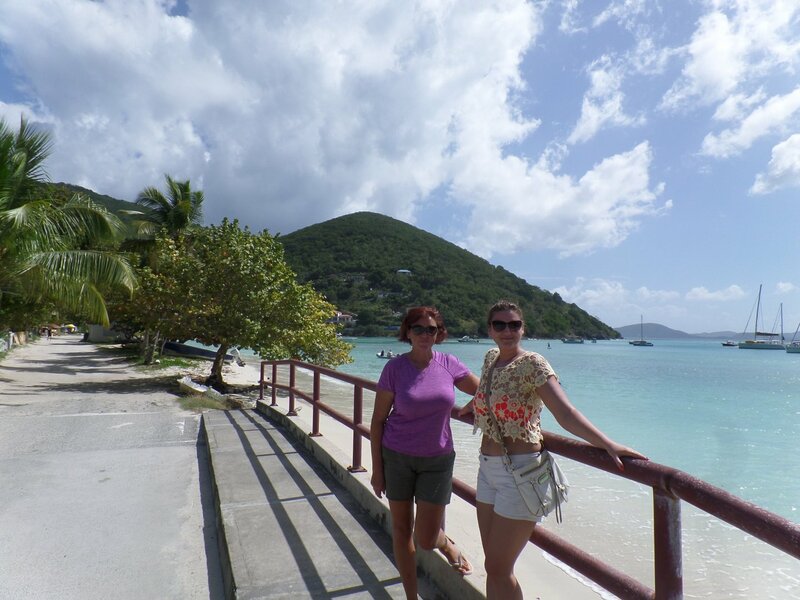 Trelis Bay is located just minutes walk from BVI' main airport and that's where we expected our daughter to arrive from Canada for a week of BVI cruising with us. 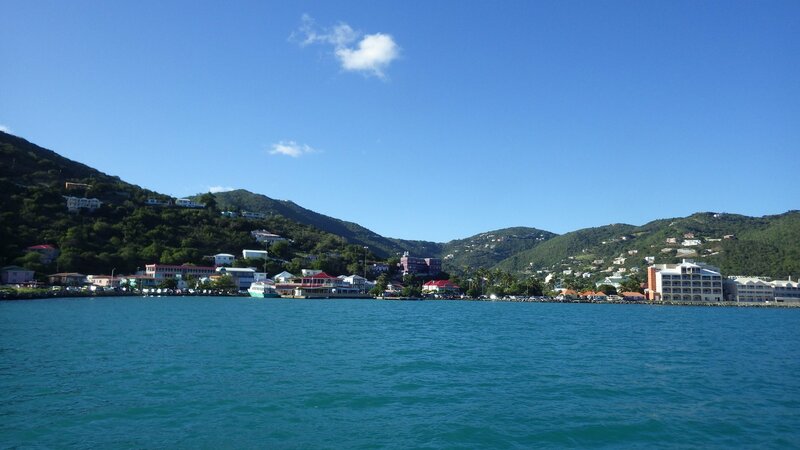 The bay is inviting, picturesque and well protected from all directions. 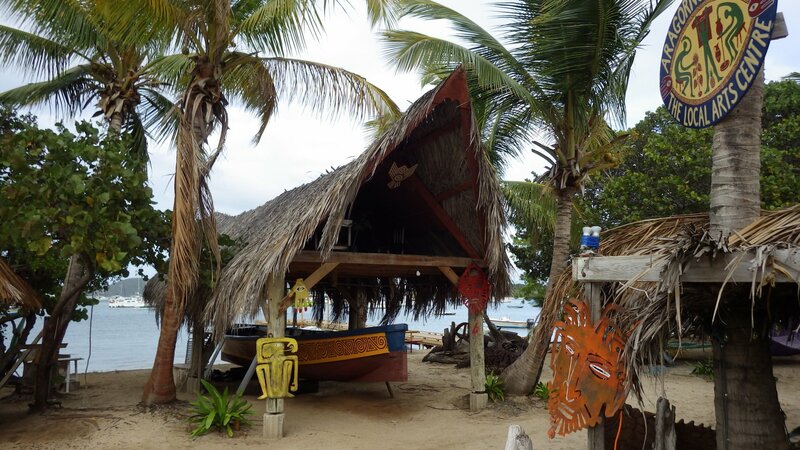 Larysa finally had good night sleeps here after rolly nights at earlier anchorages. 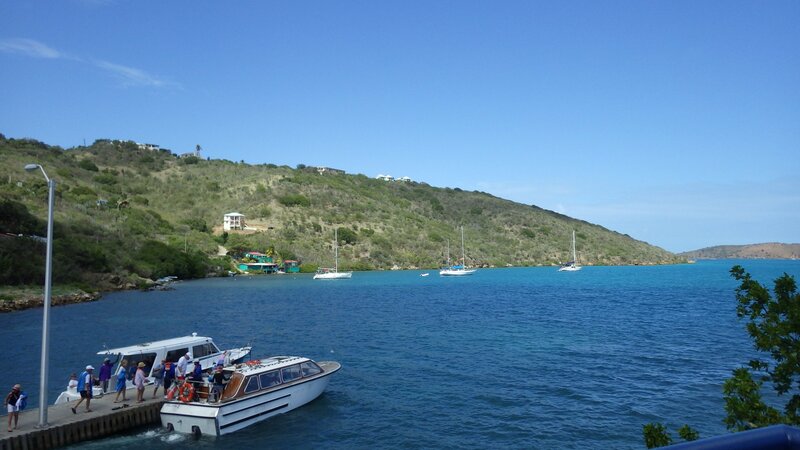 The bay is also a popular stop of charter boats, and finding a place for boat could be difficult. 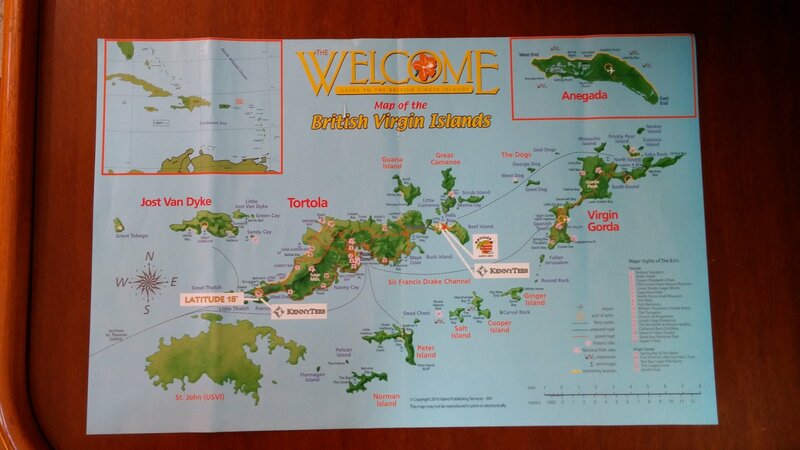 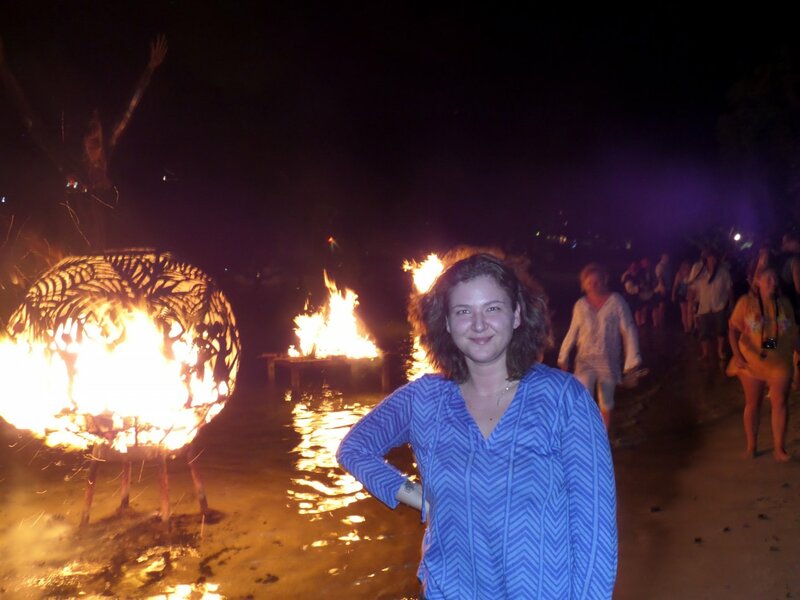 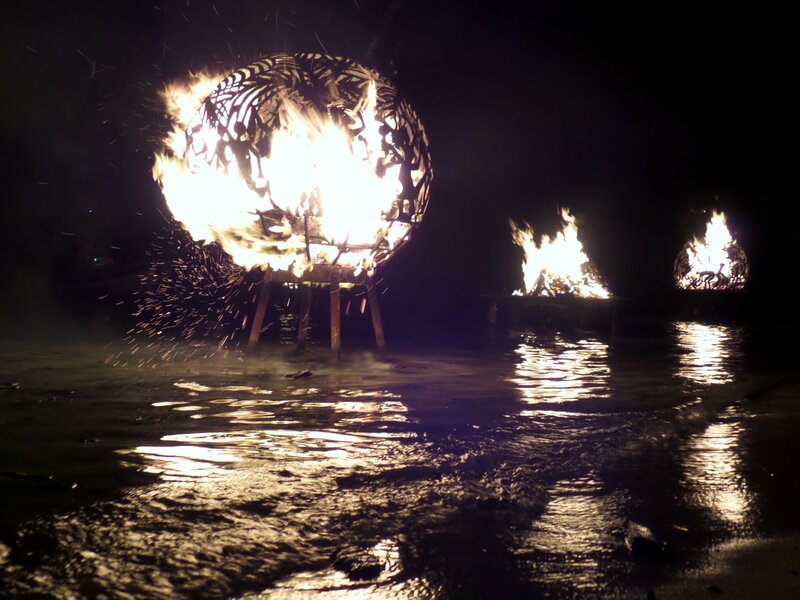 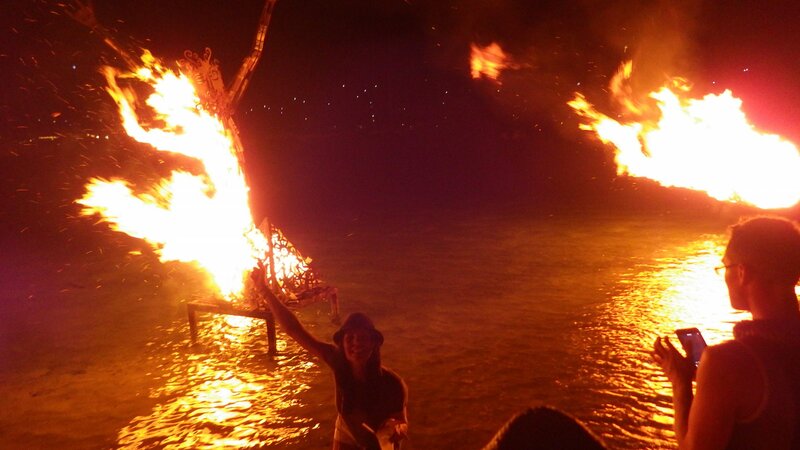 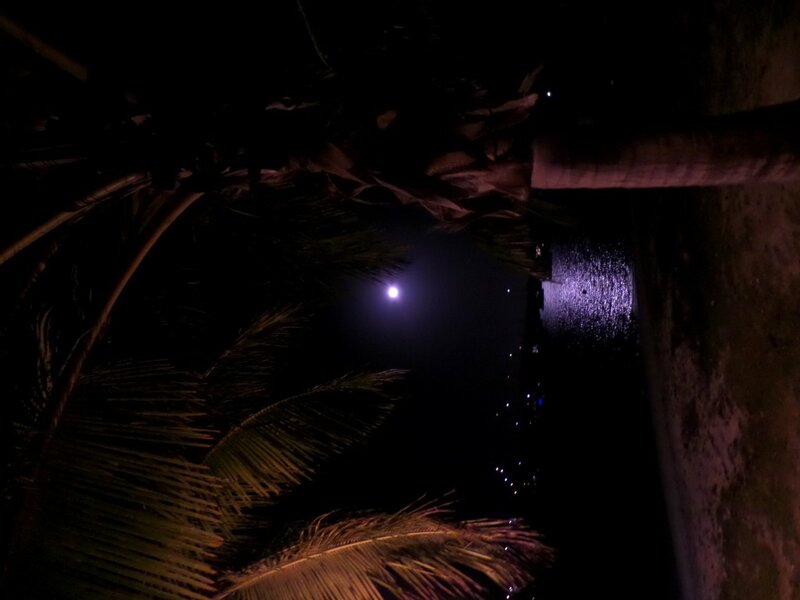 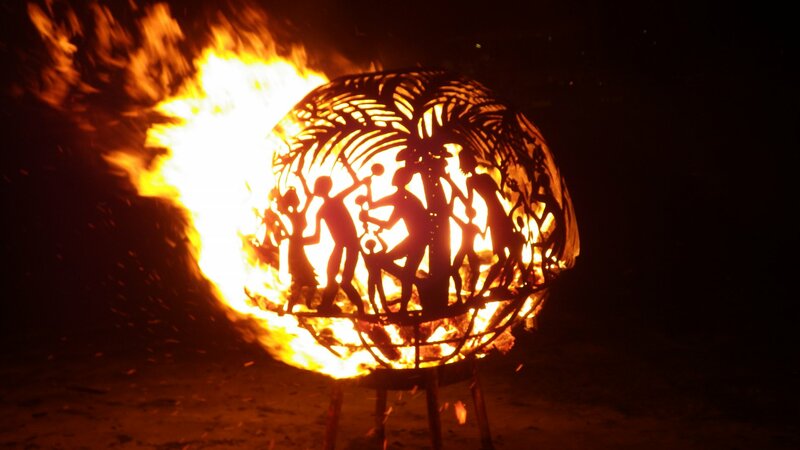 We timed our stay here for the Fool Moon Party, for which Trelis Bay is known. 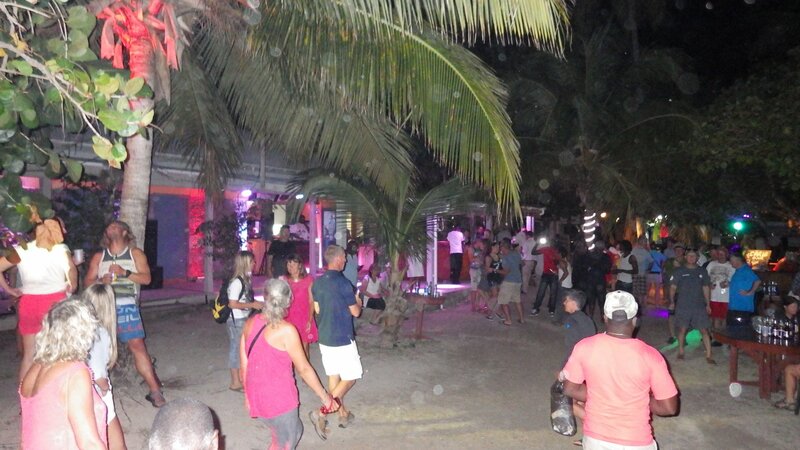 Although we are not really party goers, we had a real fun. 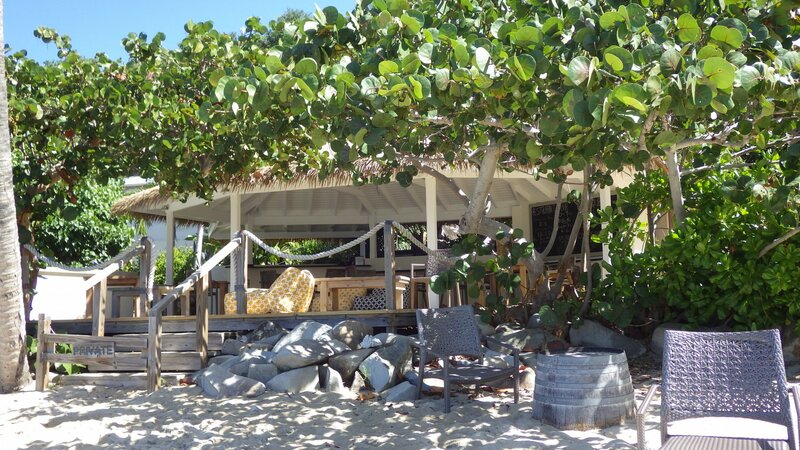 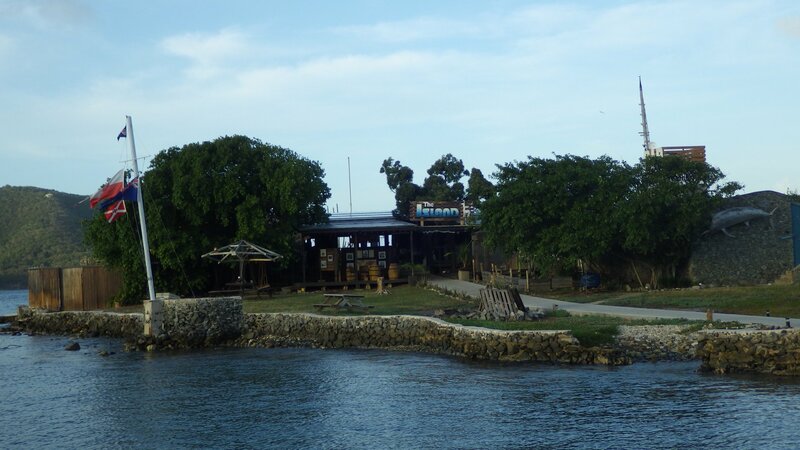 This is also were we celebrated by BD and our anniversary, at the Last Resort restaurant on the small Bellamy Cay island in the middle of the bay. 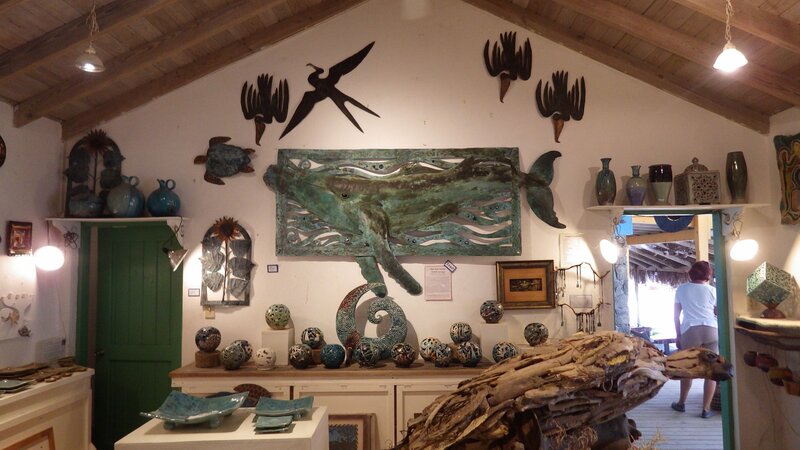 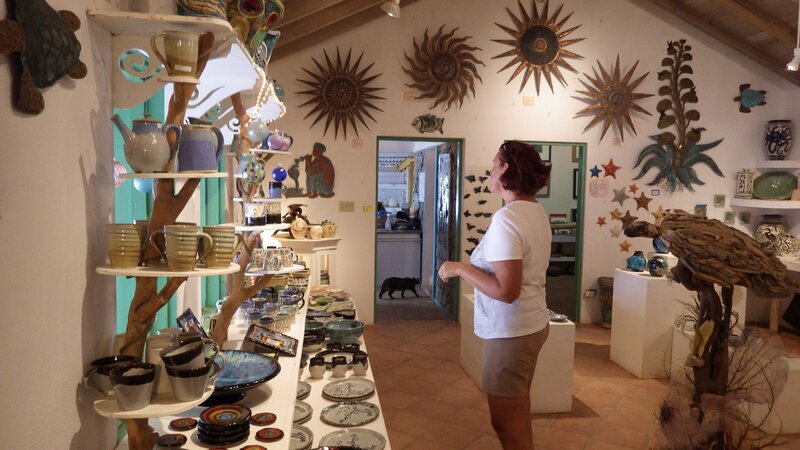 There are few restaurants, an art gallery and a grocery store ashore, not much else. 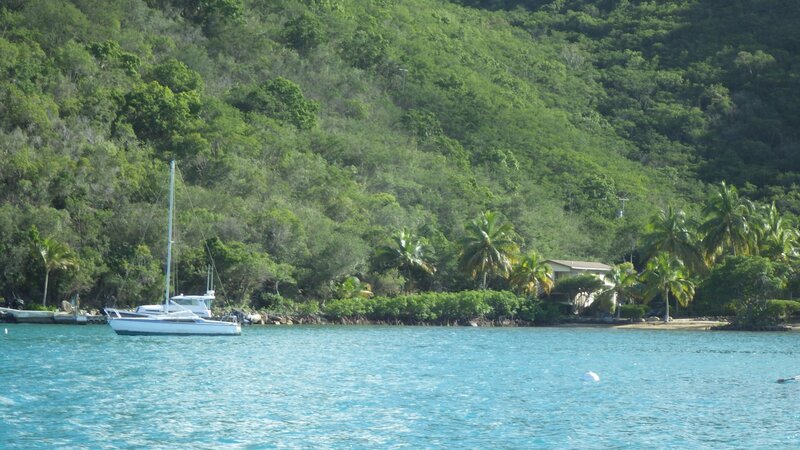 Out next sail downwind was to Jost Van Dyke Island, at the Daimond Cay. 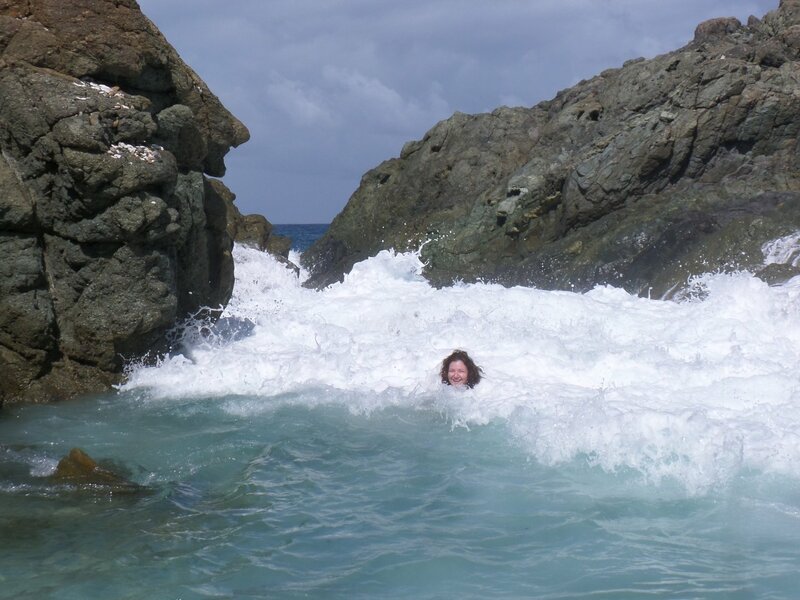 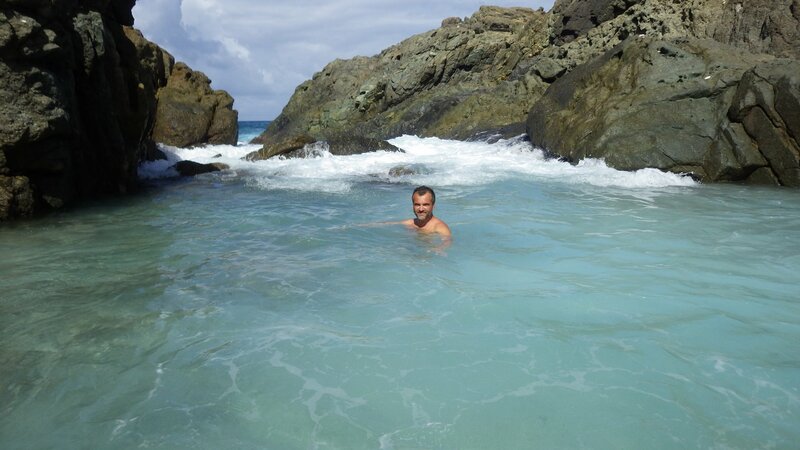 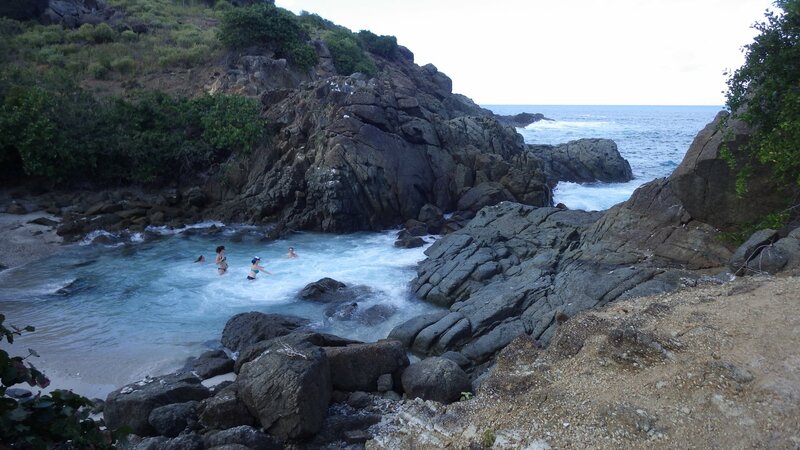 We hiked to nearby "Bubbly Pool" � a natural pool surrounded by large rocks on the ocean's edge, where waves tumble trough a hole in the rocks creating a bubbling salt water pool. 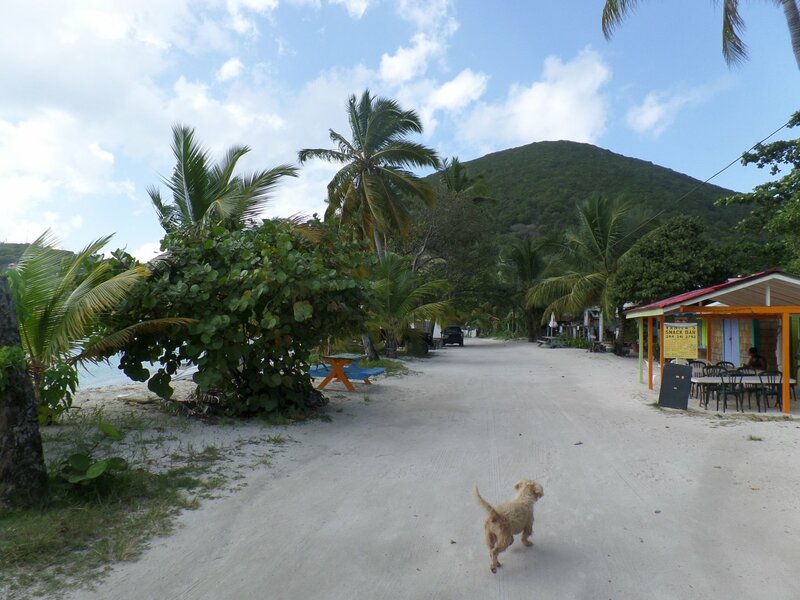 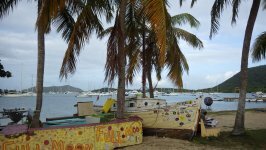 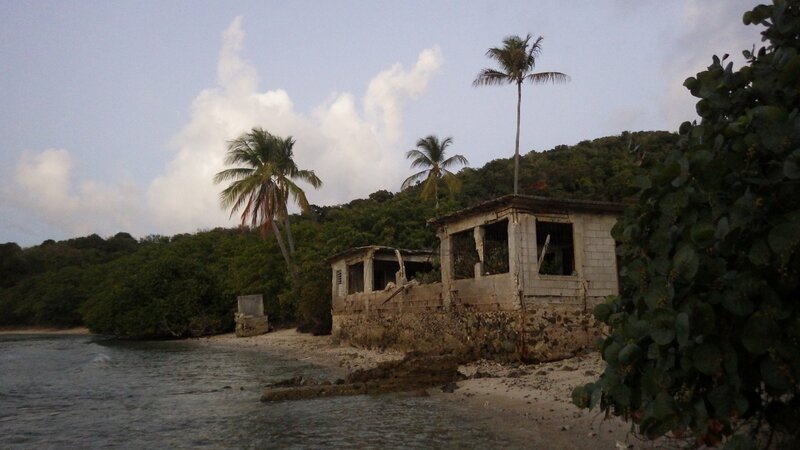 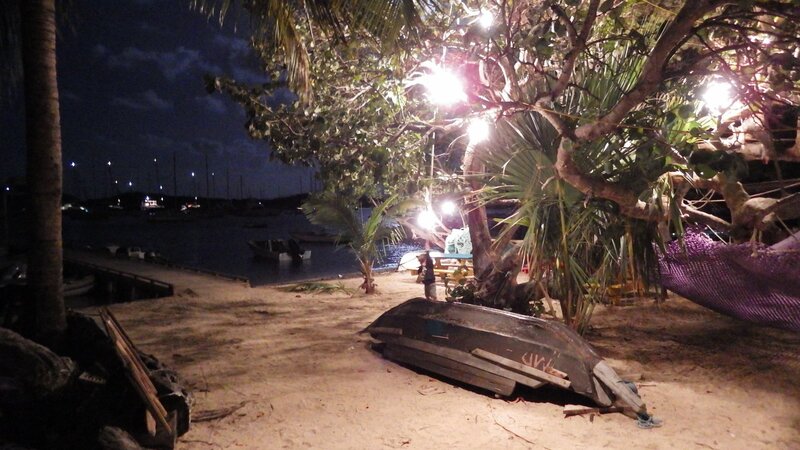 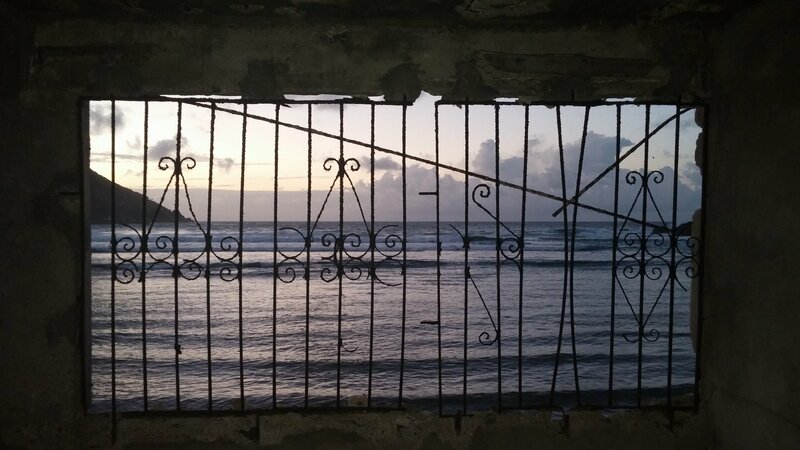 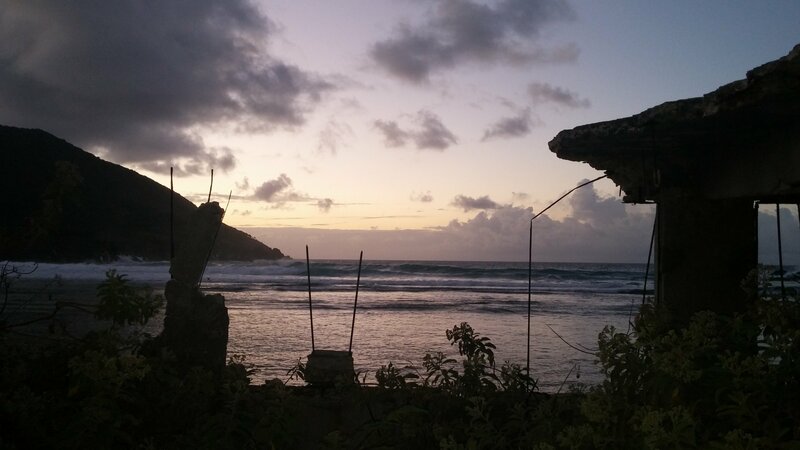 At evening we visited abandoned bar/motel on Little Jost Van Dyke. 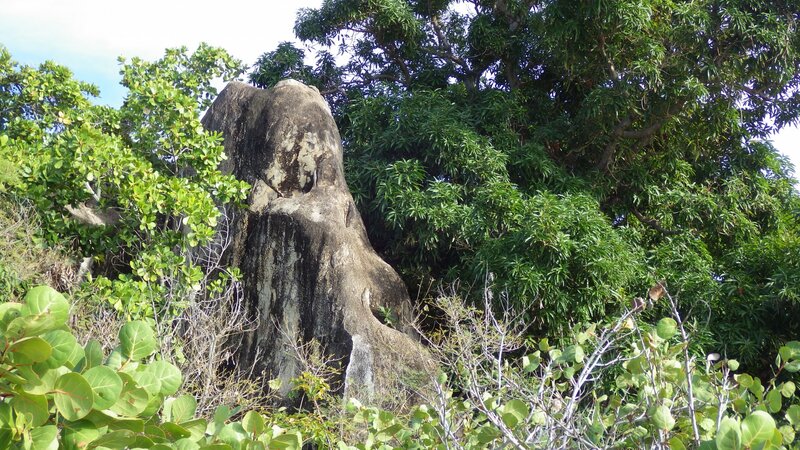 Wondering what caused its demise. 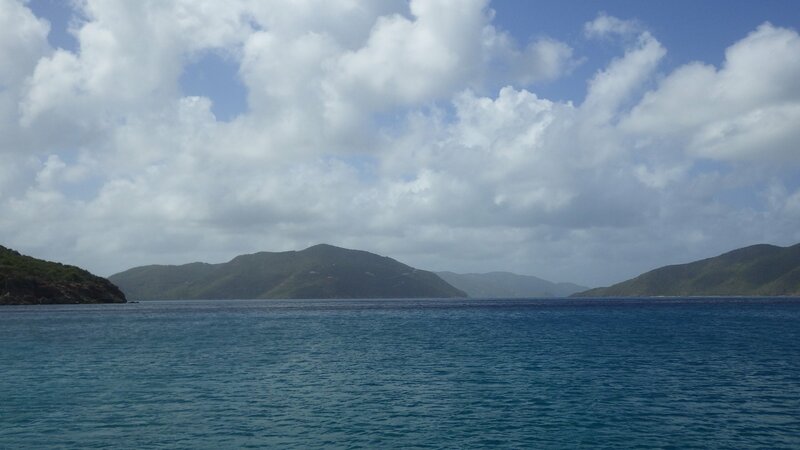 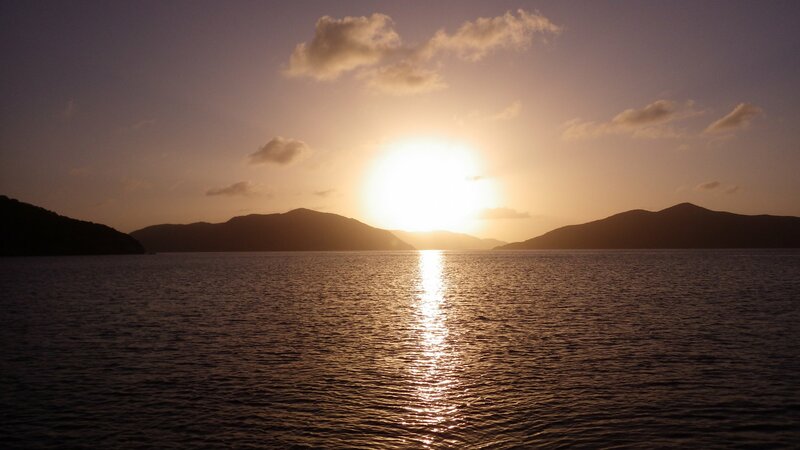 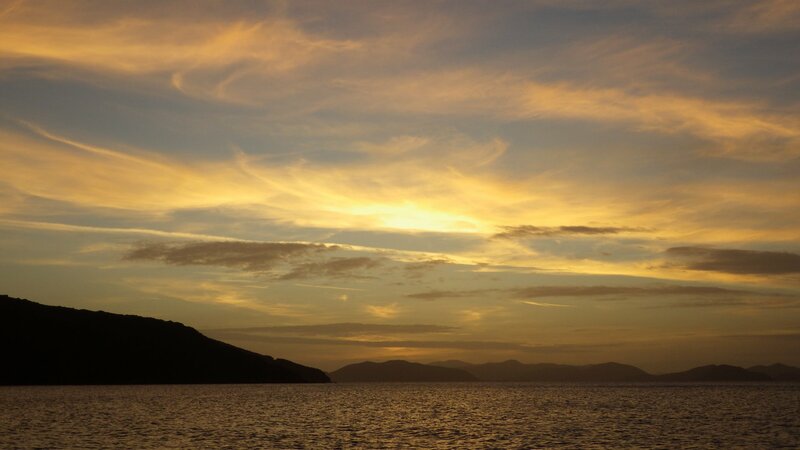 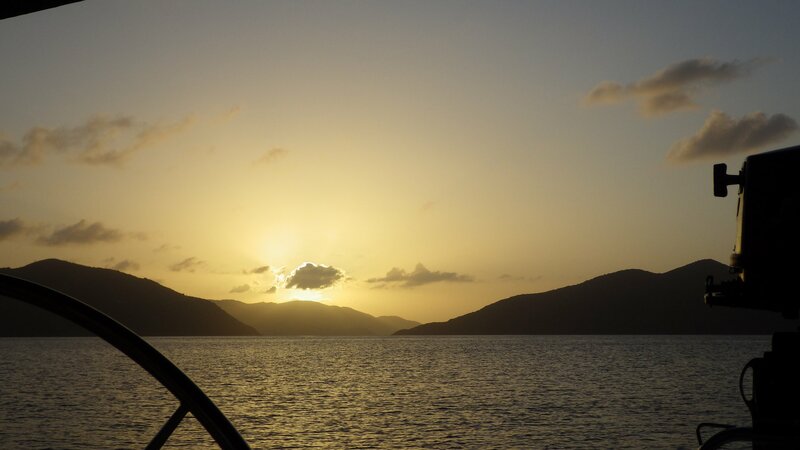 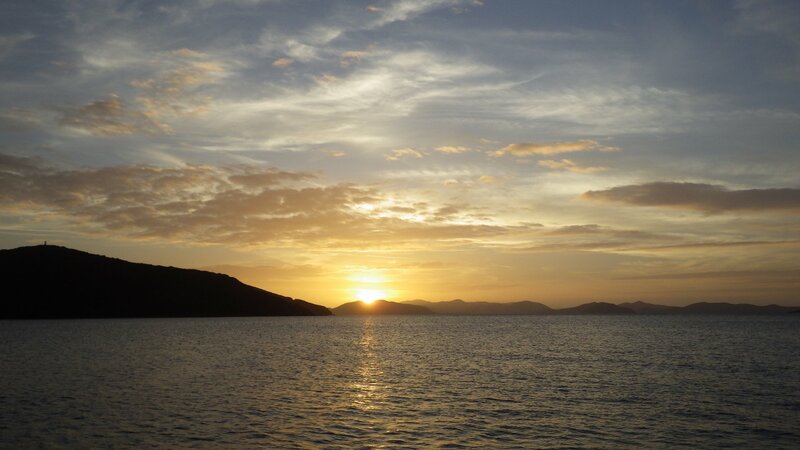 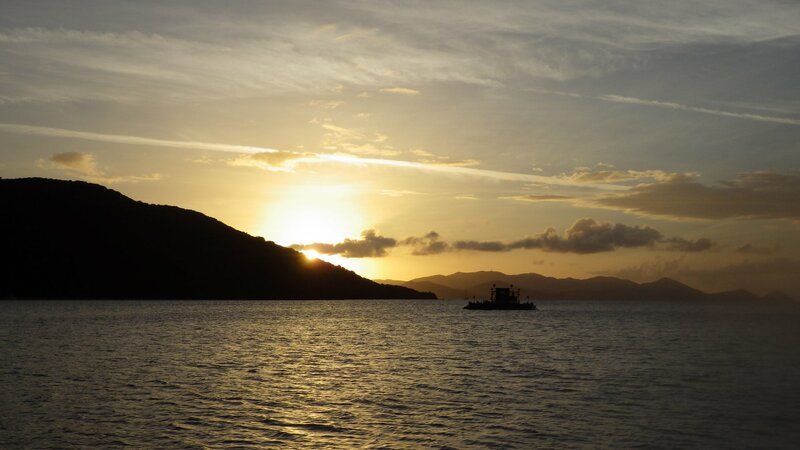 The next morning we sailed to the Great Harbour on the southern shore of Jost Van Dyke Island. 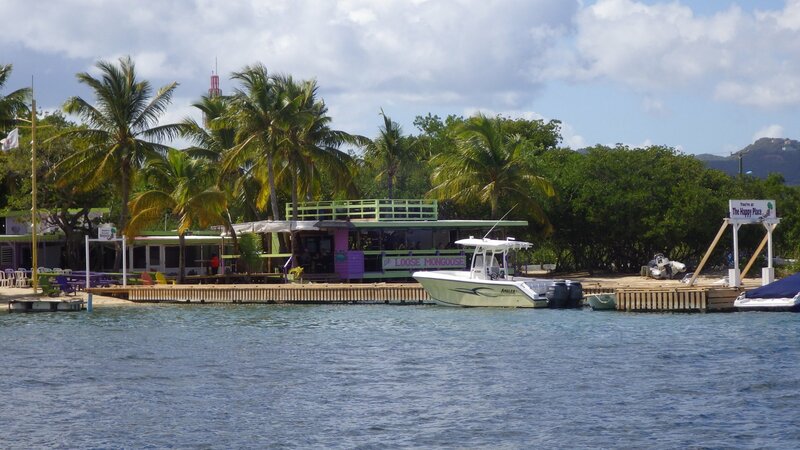 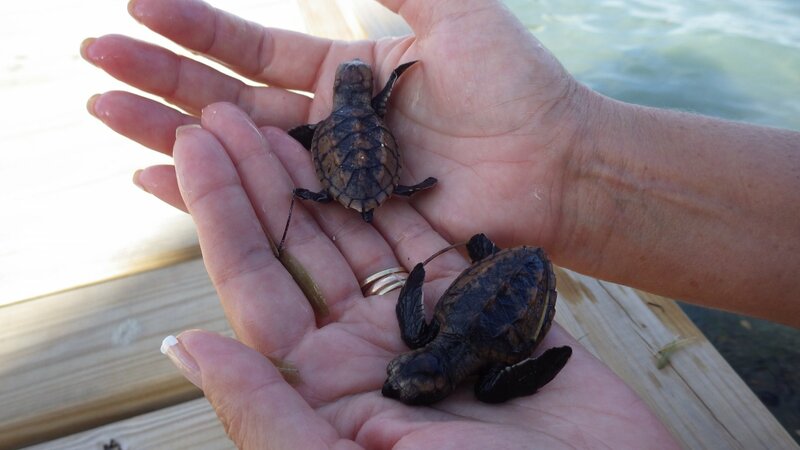 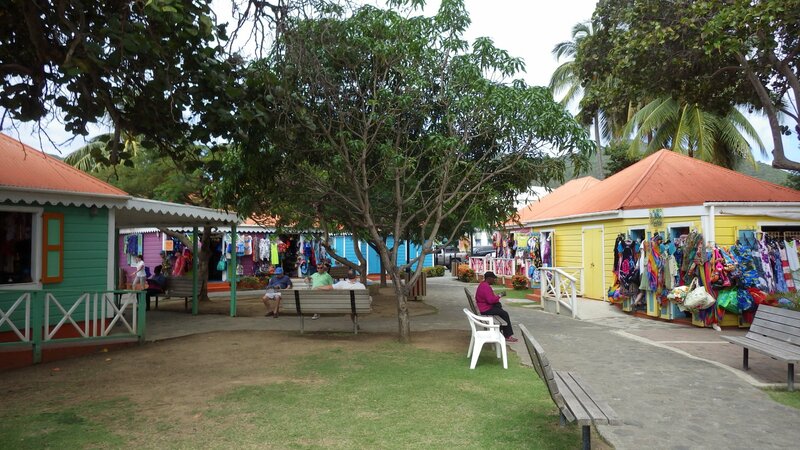 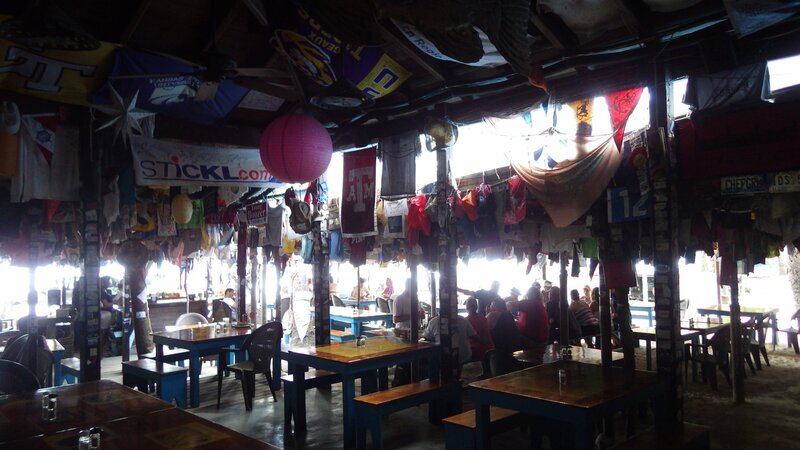 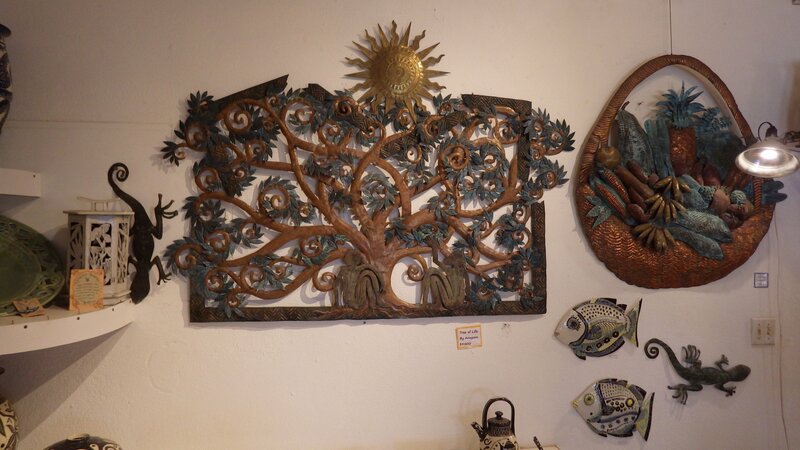 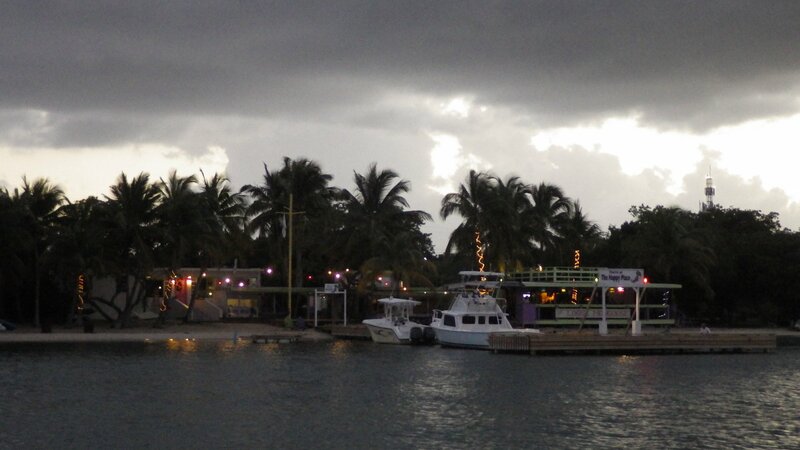 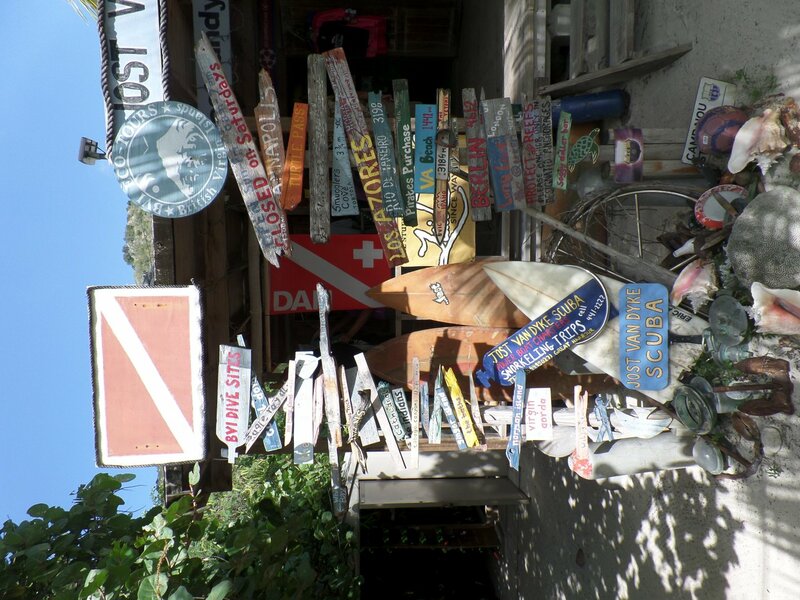 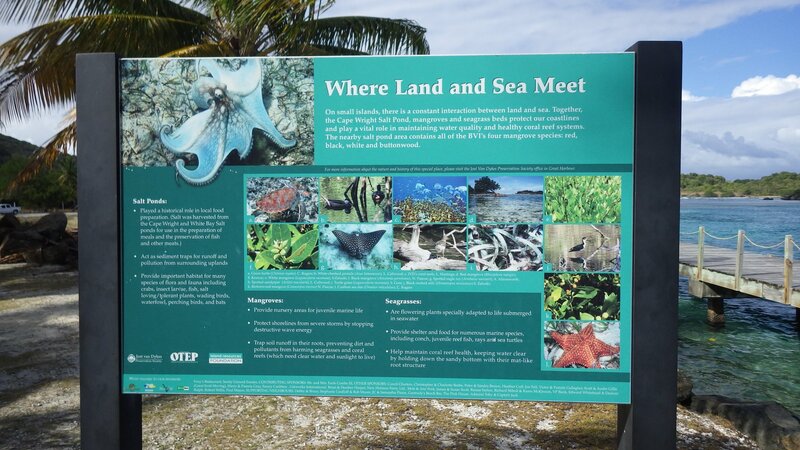 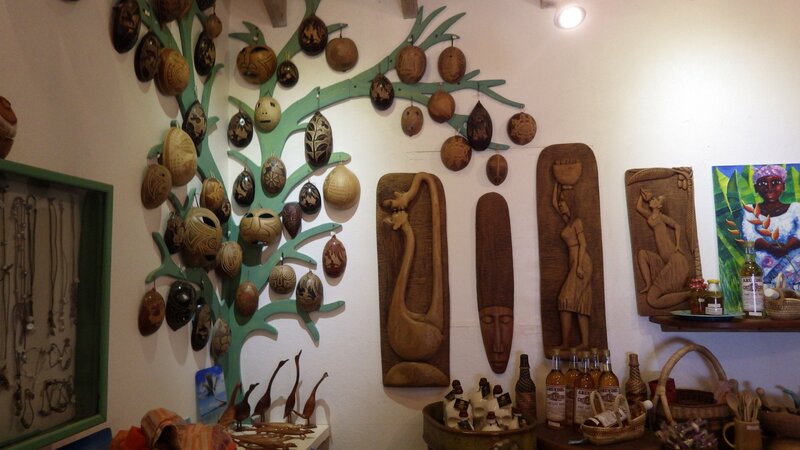 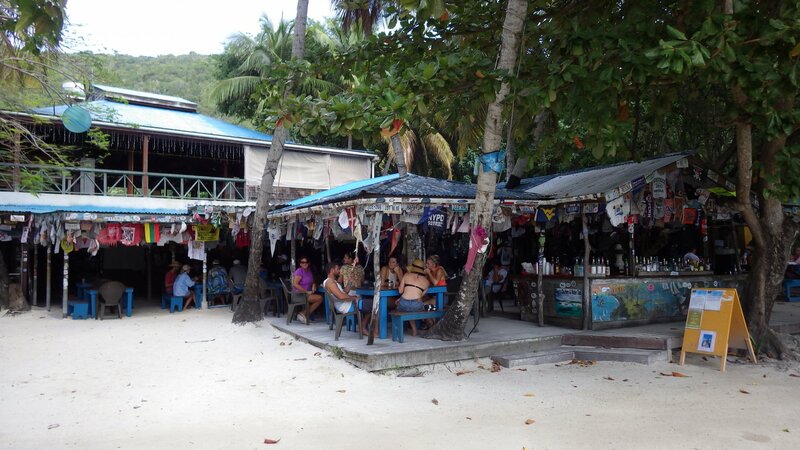 It is a small touristy place, with several souvenir shops, dive operations and restaurants. 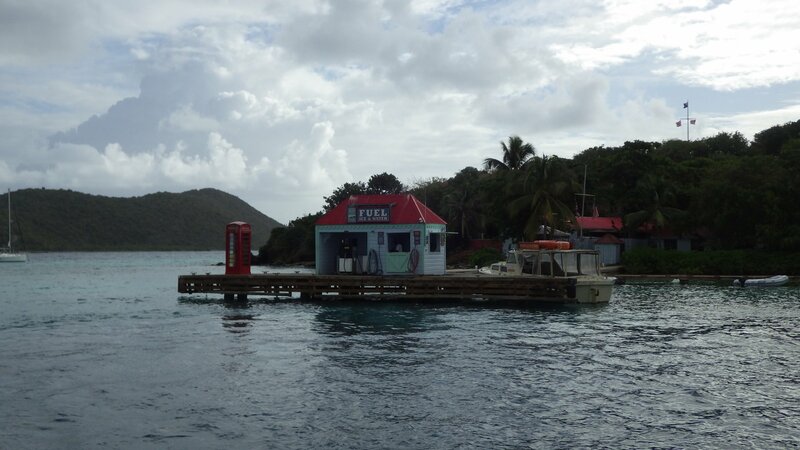 The most famous one is Foxy's where we had our lunch. 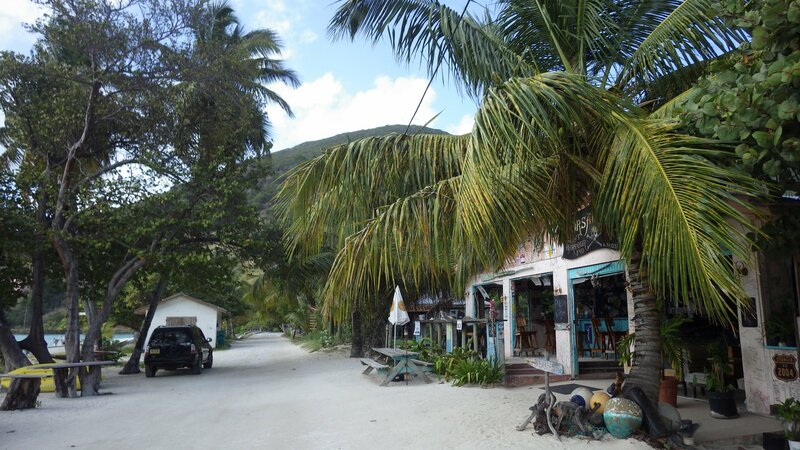 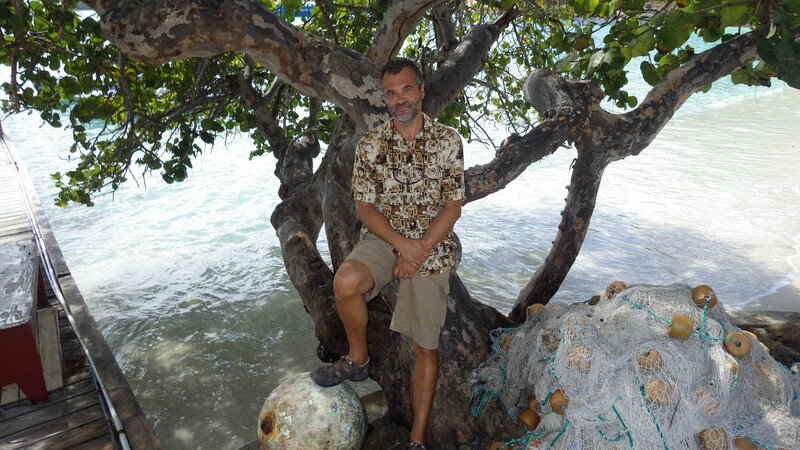 Later we strolled along the shore streets, peeked into local shops and relaxed on the beach a little. 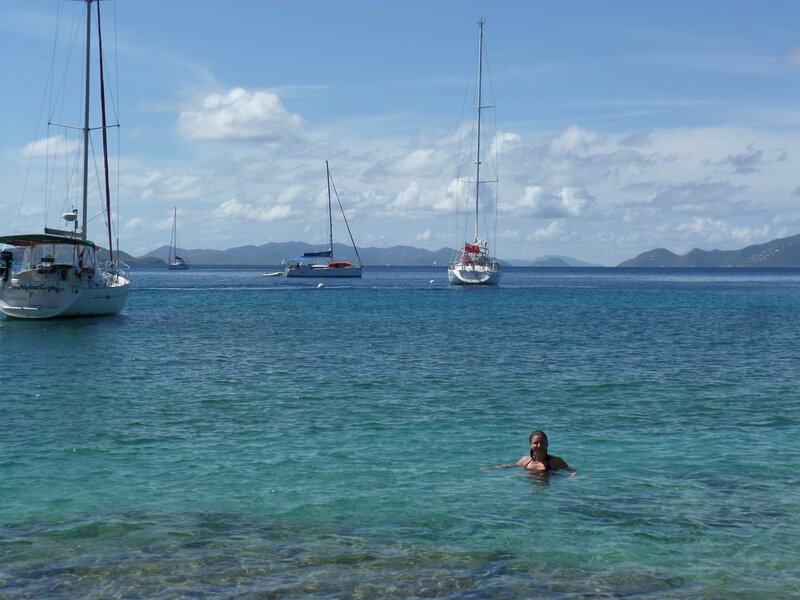 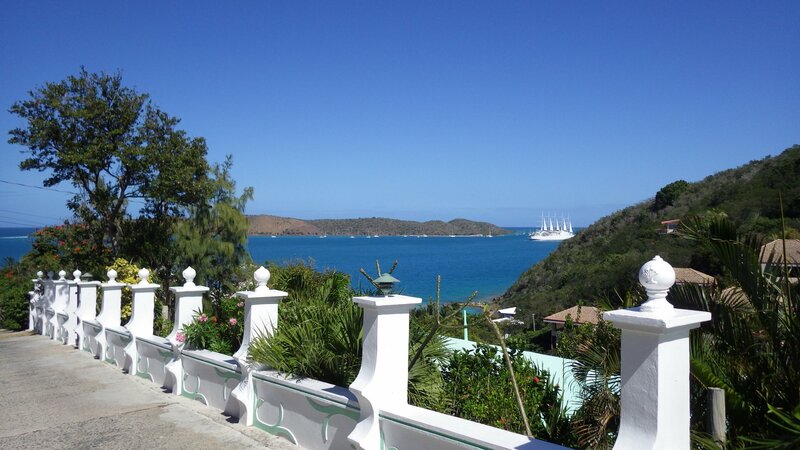 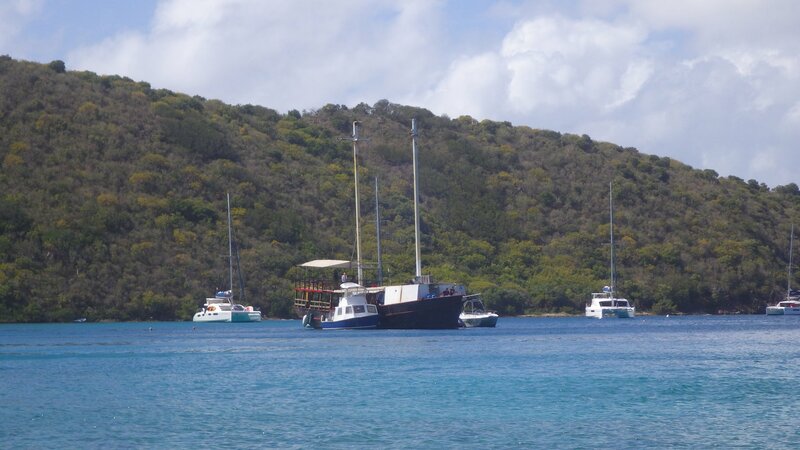 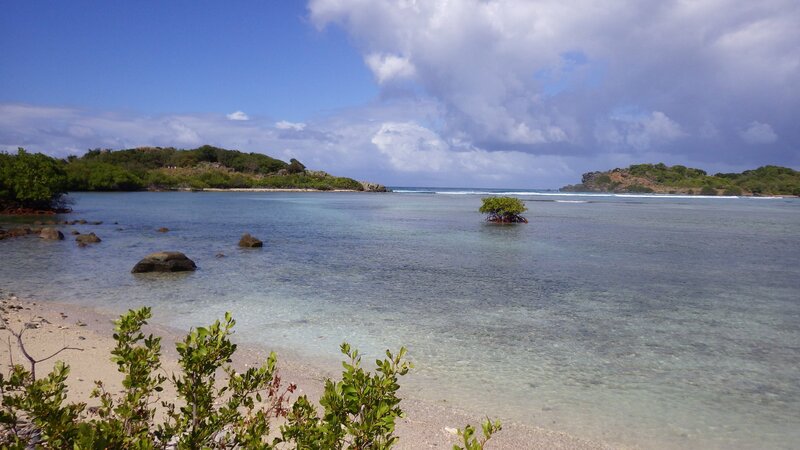 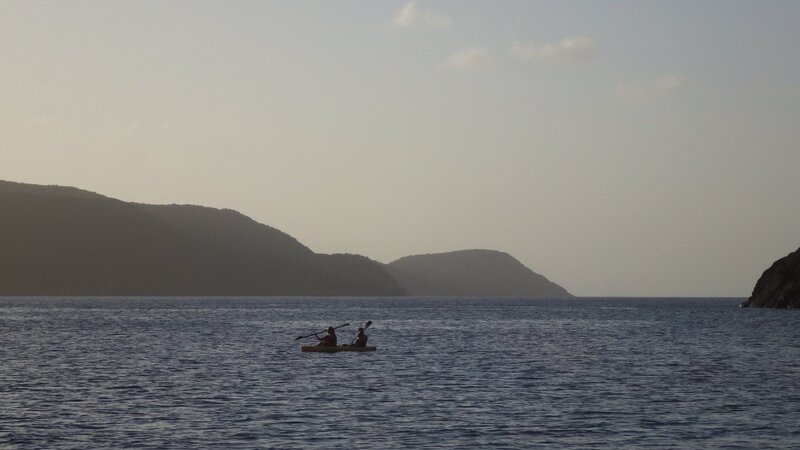 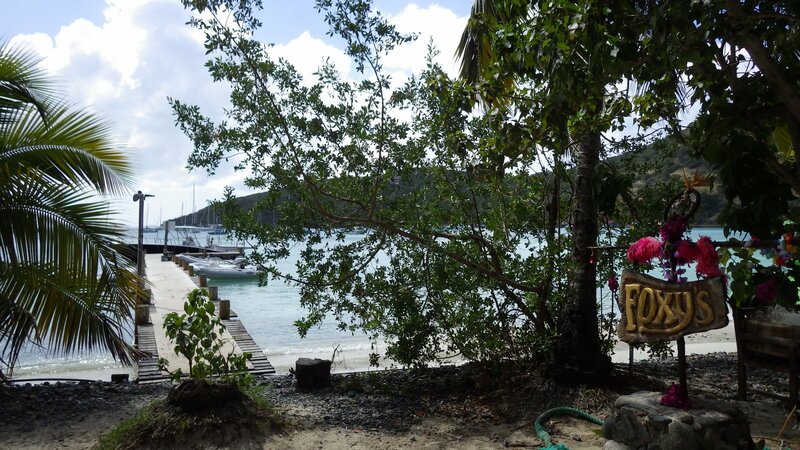 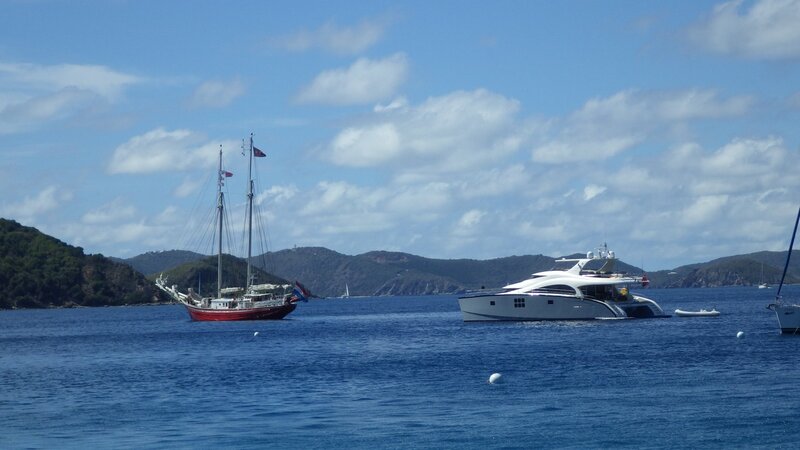 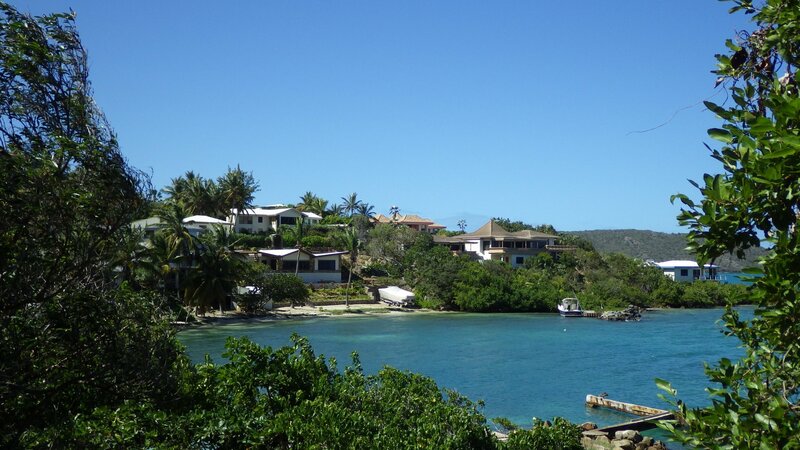 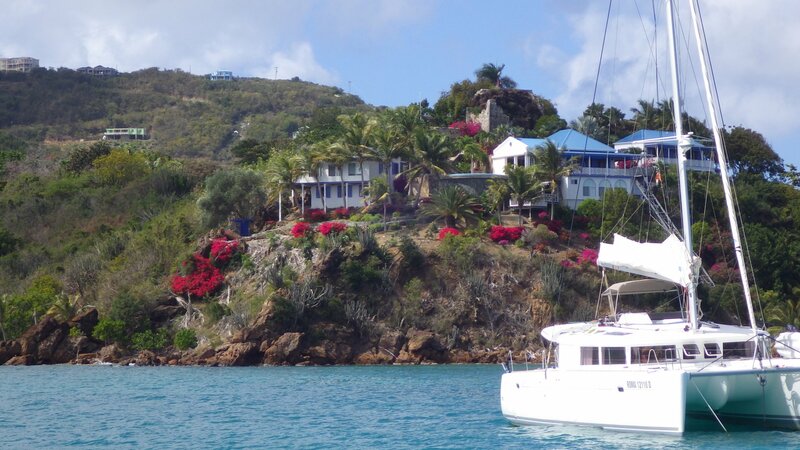 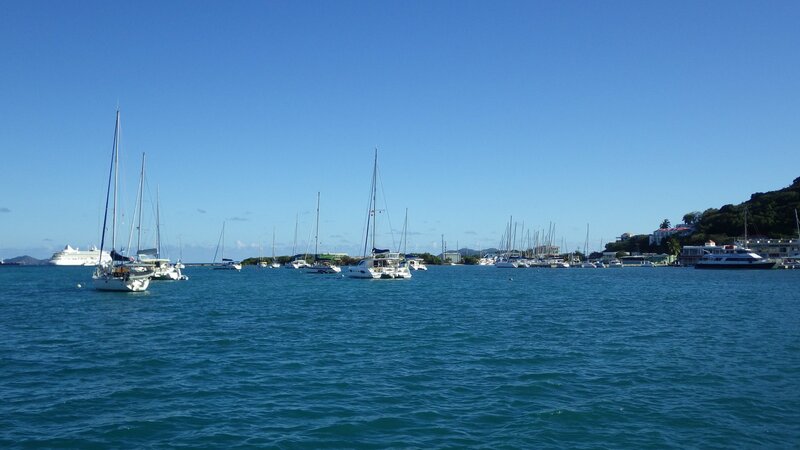 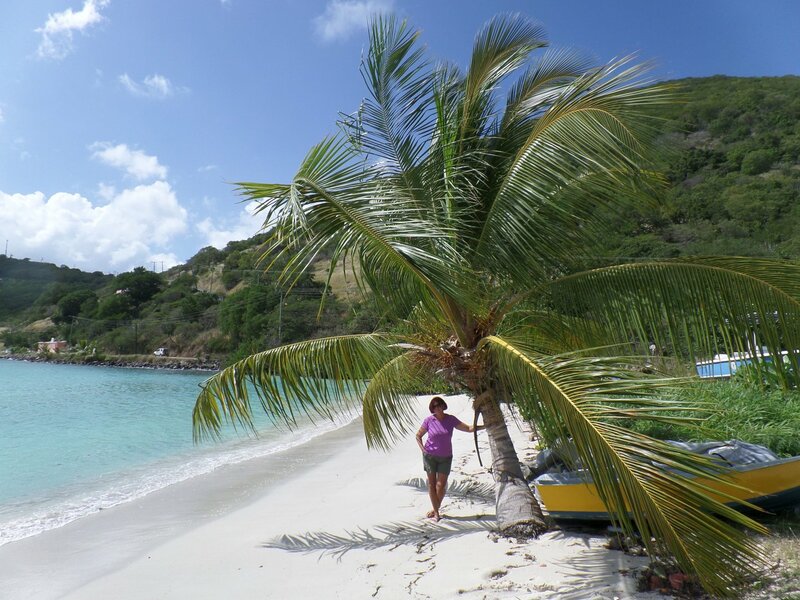 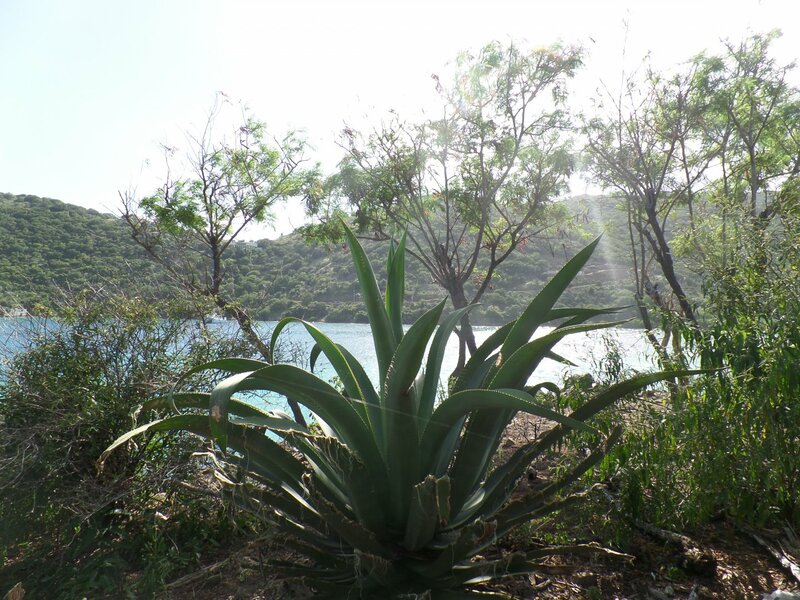 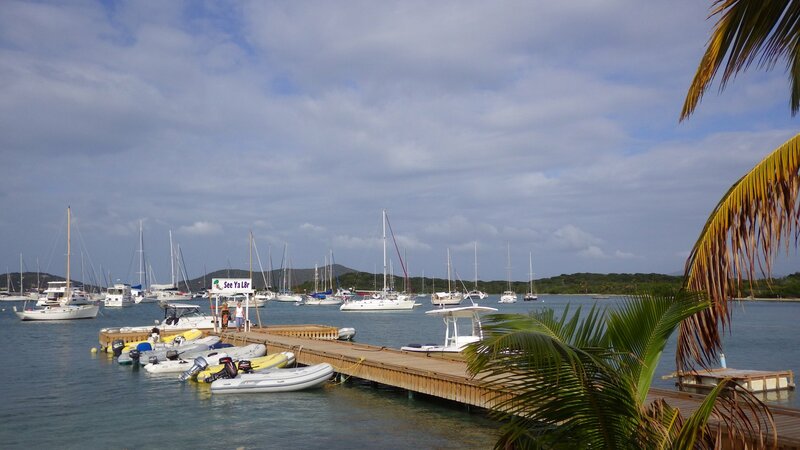 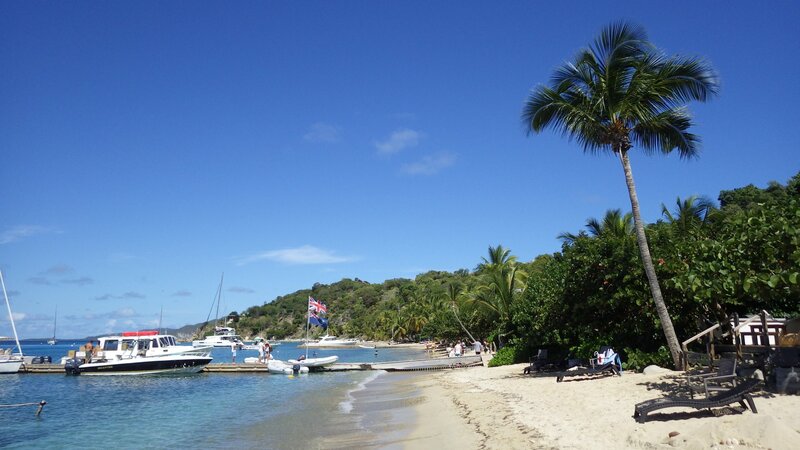 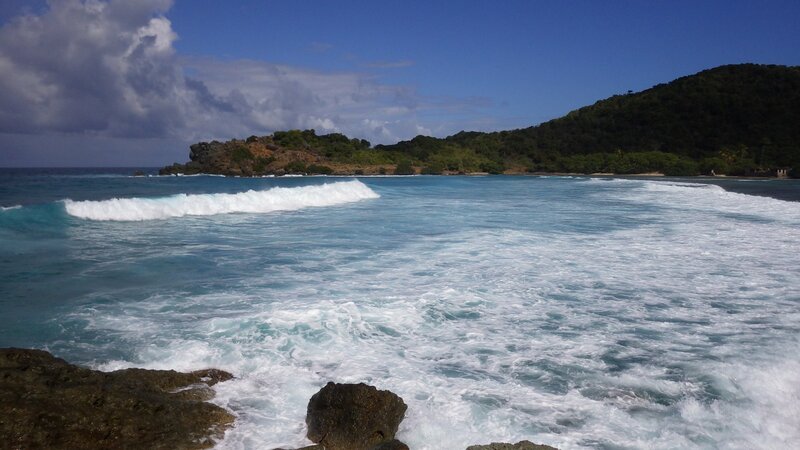 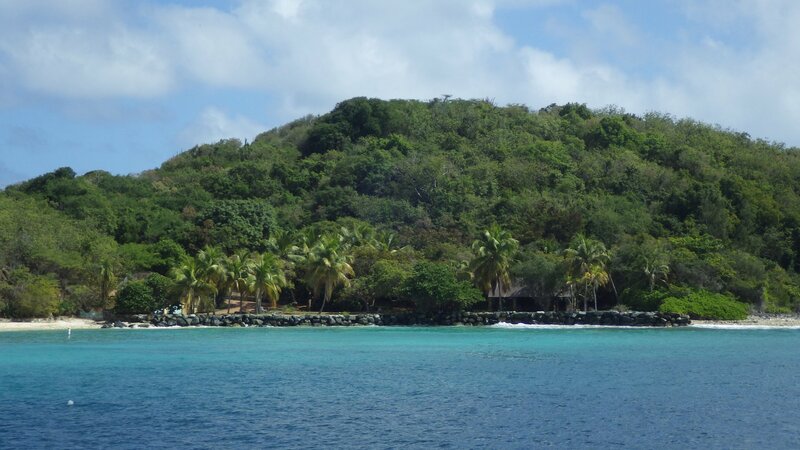 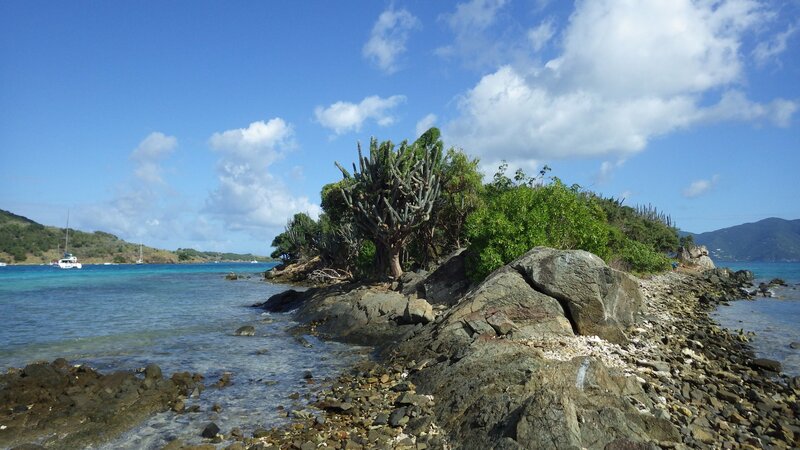 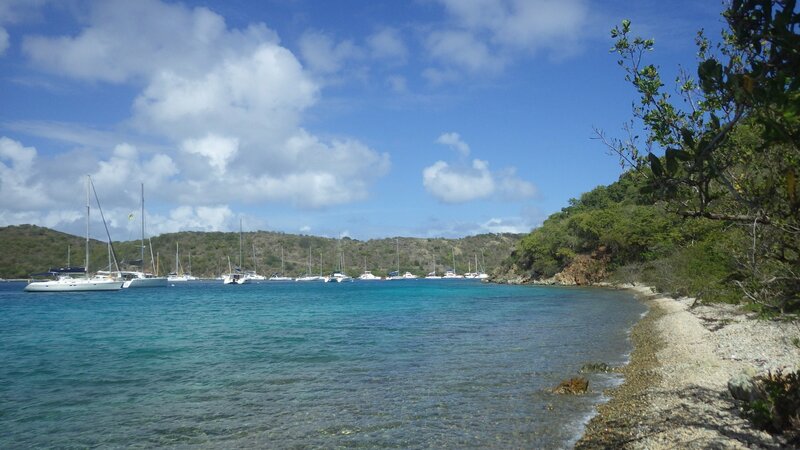 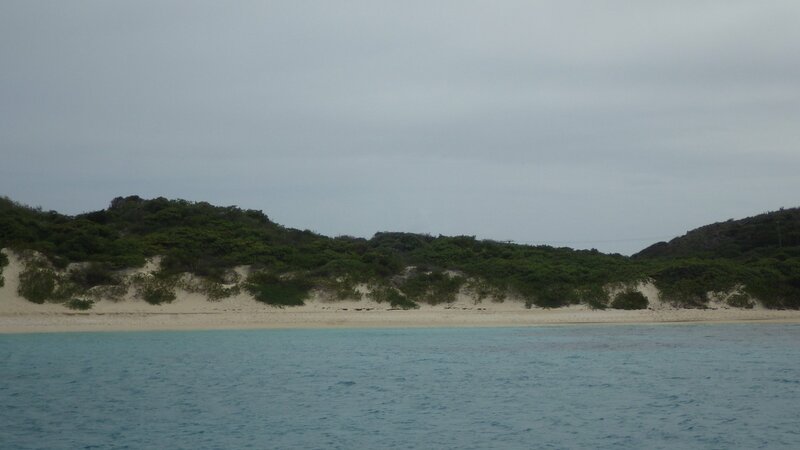 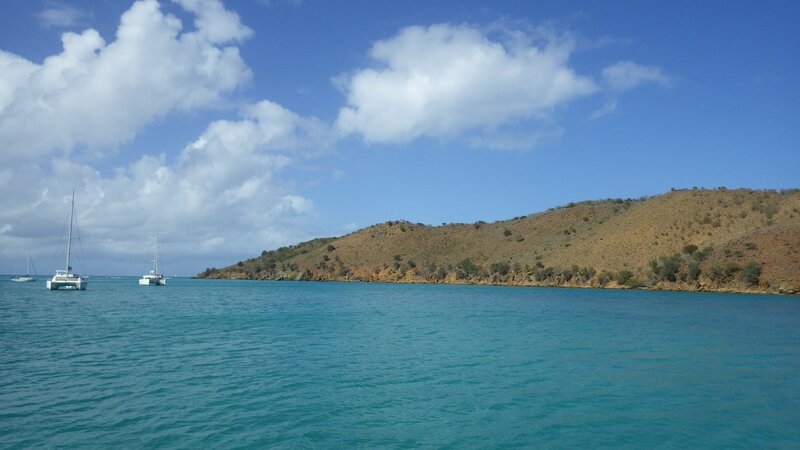 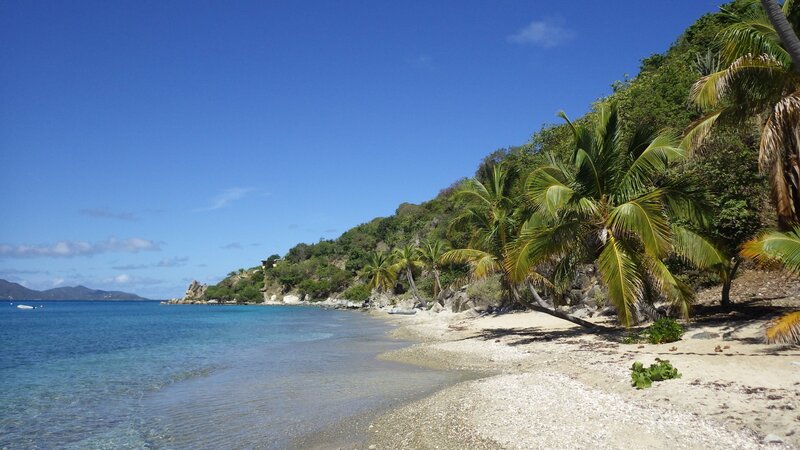 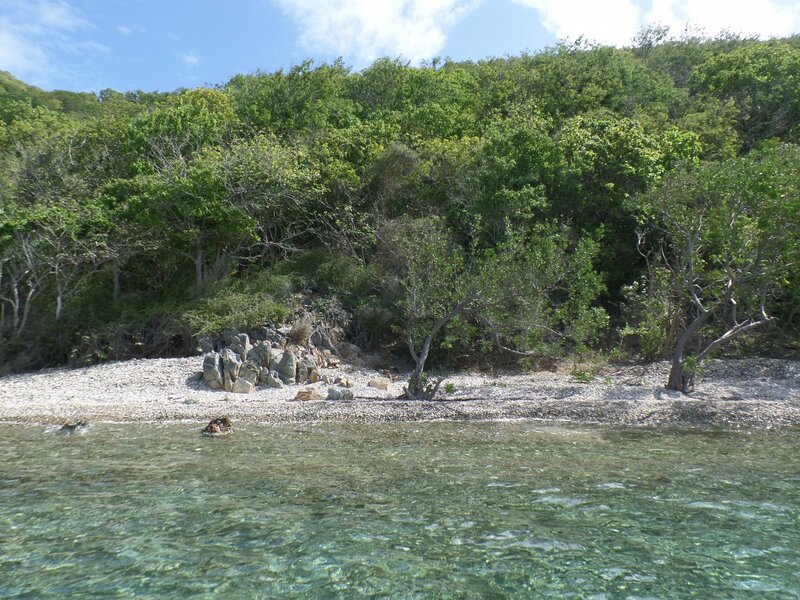 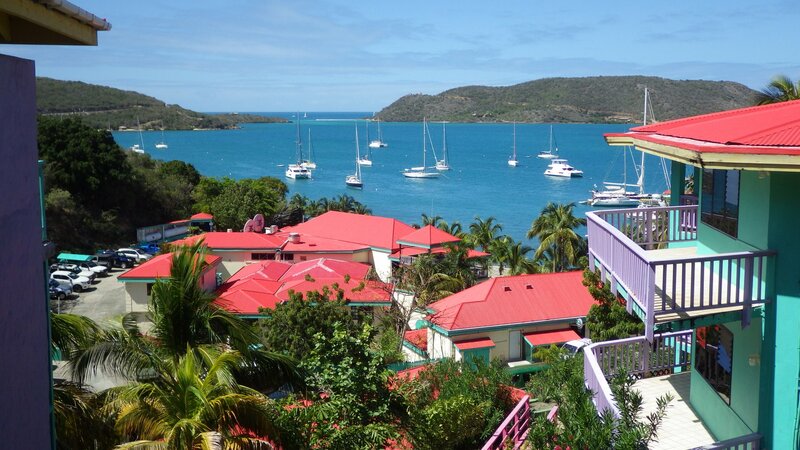 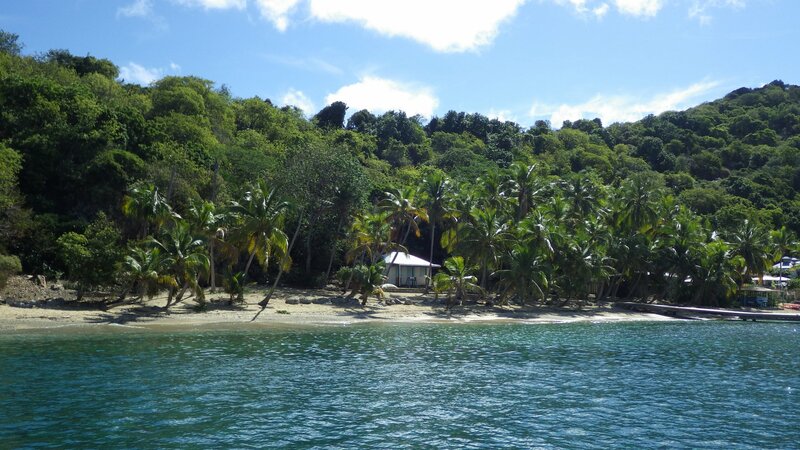 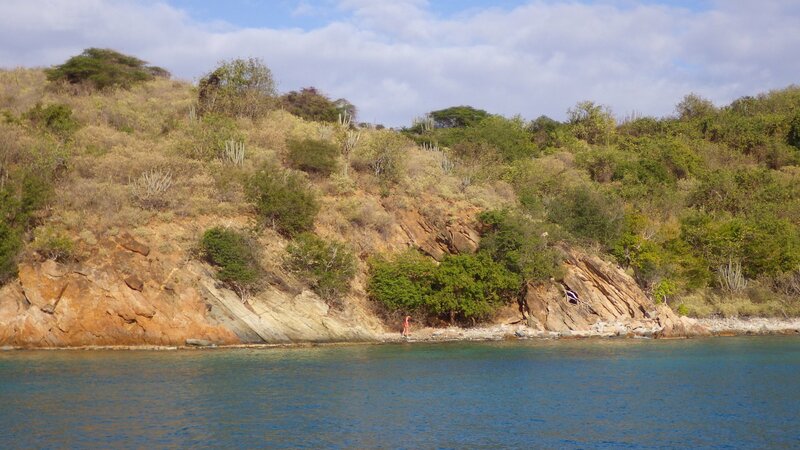 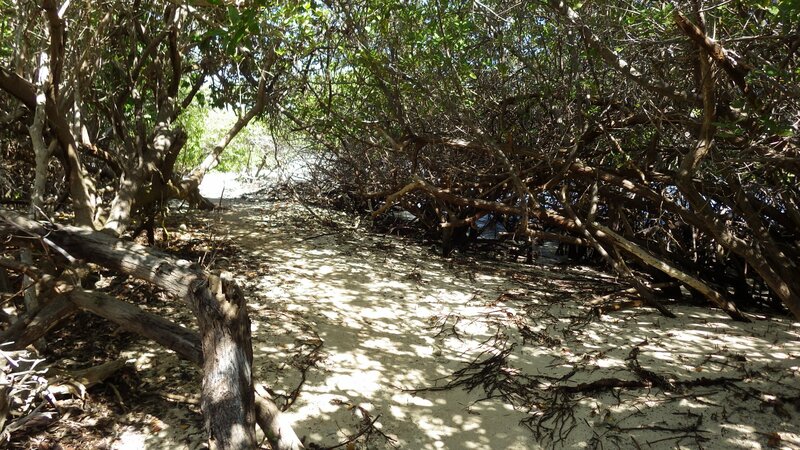 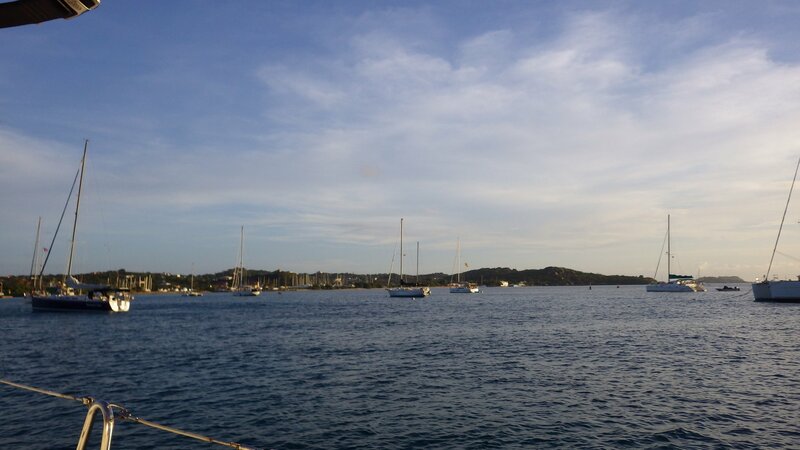 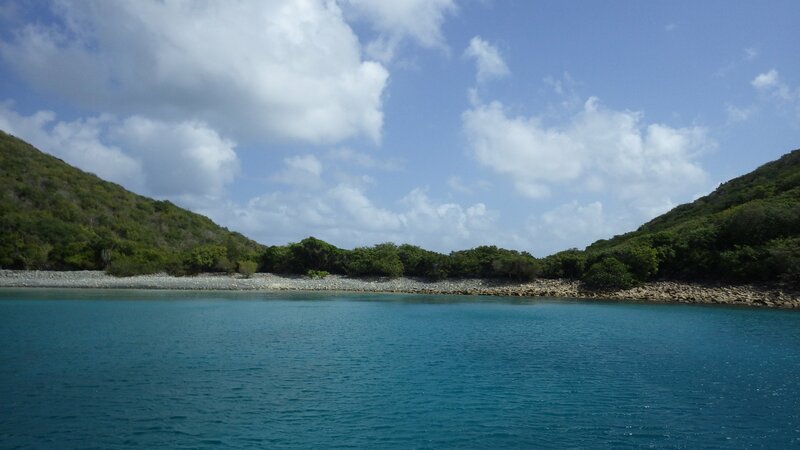 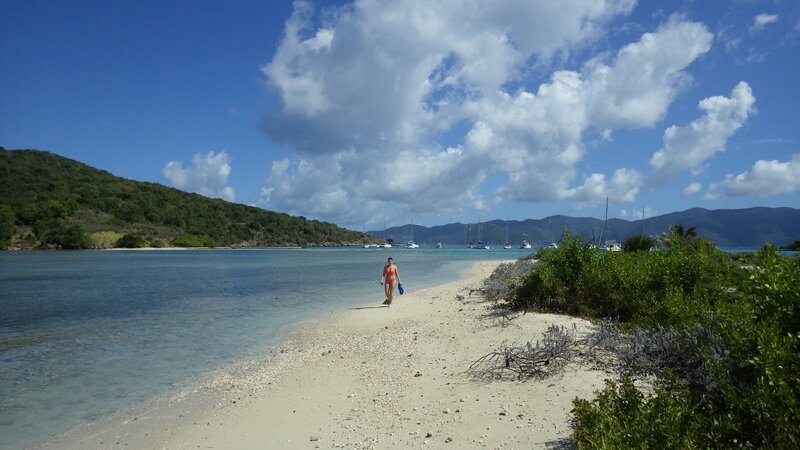 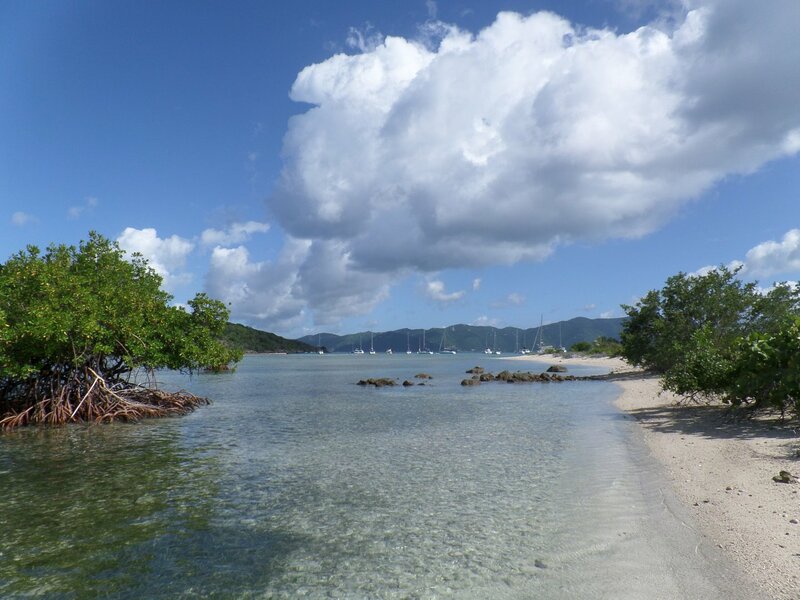 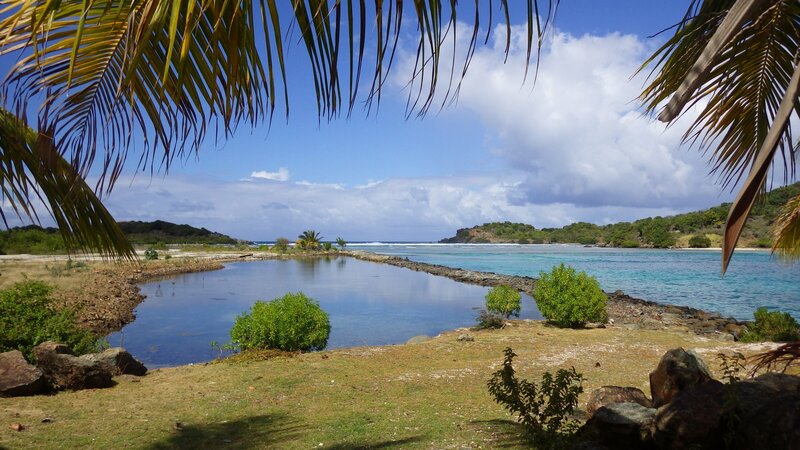 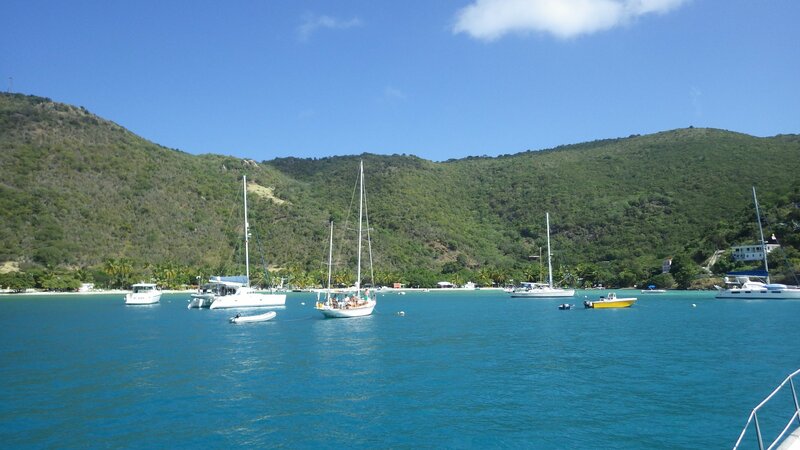 The Bight on Norman Island is a pretty and protected bay, very popular with charter boats. 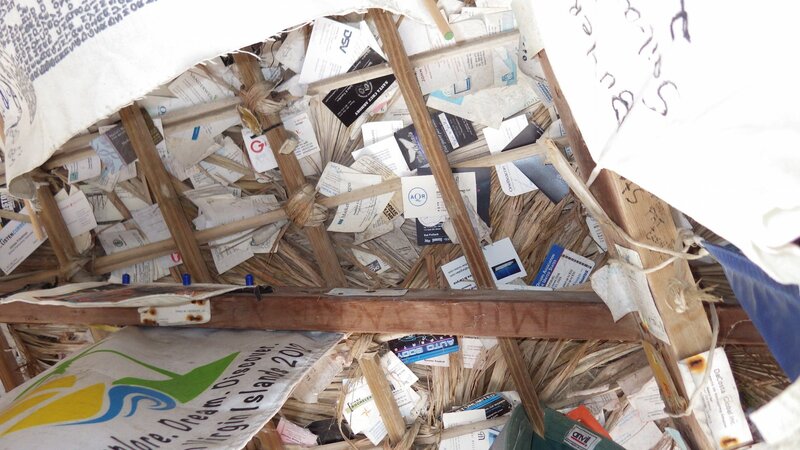 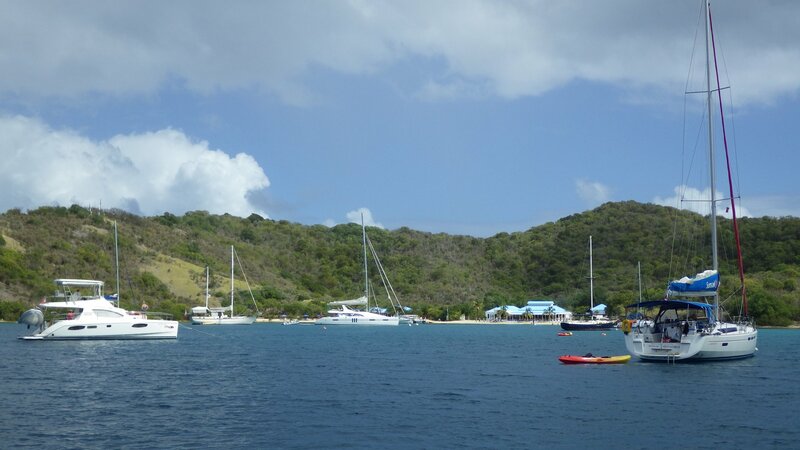 Unfortunately, we found it to be crowded, only with a pricy restaurant and extensive mooring field taking all available anchorage space in the bay. 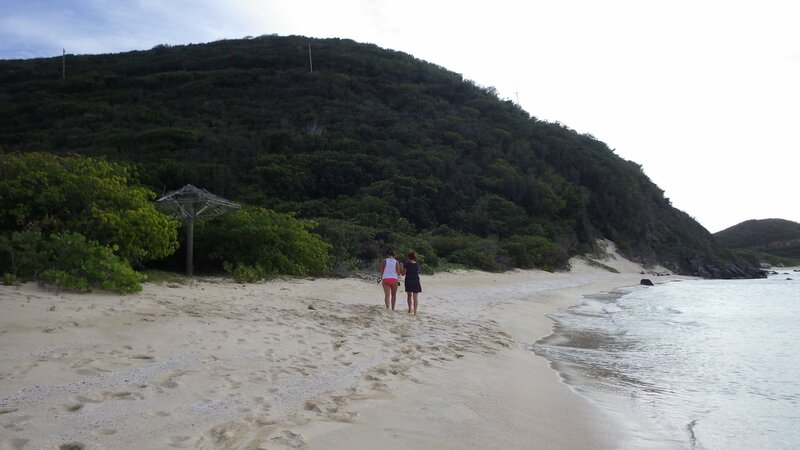 We stayed only a little here. 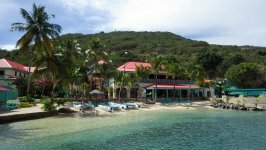 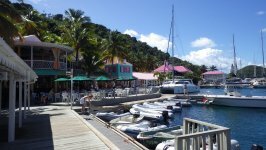 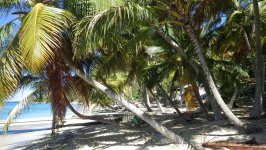 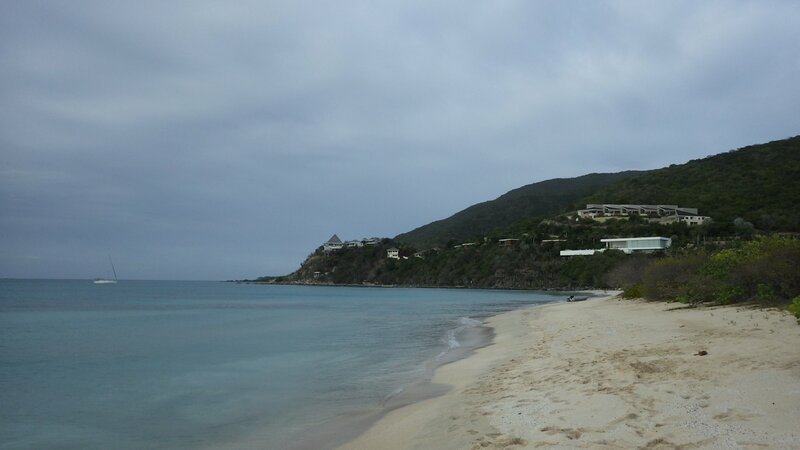 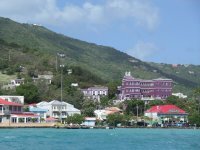 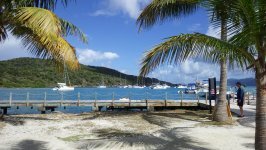 The Great Harbour at Peter Island was similar to the one at Norman Island we visited just before � a little disappointing. 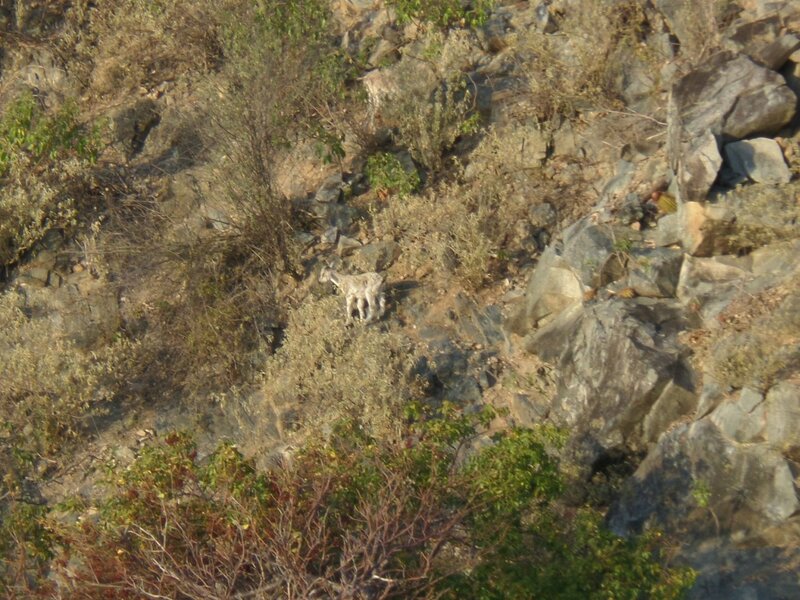 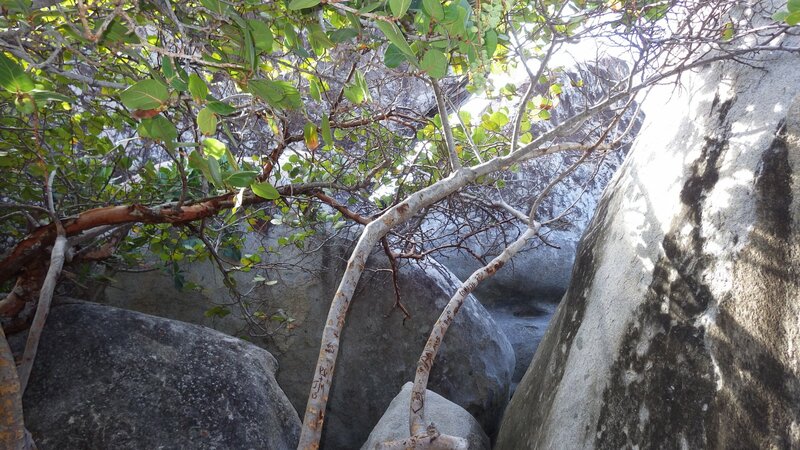 Next time we will stay little off the beaten track in this area. 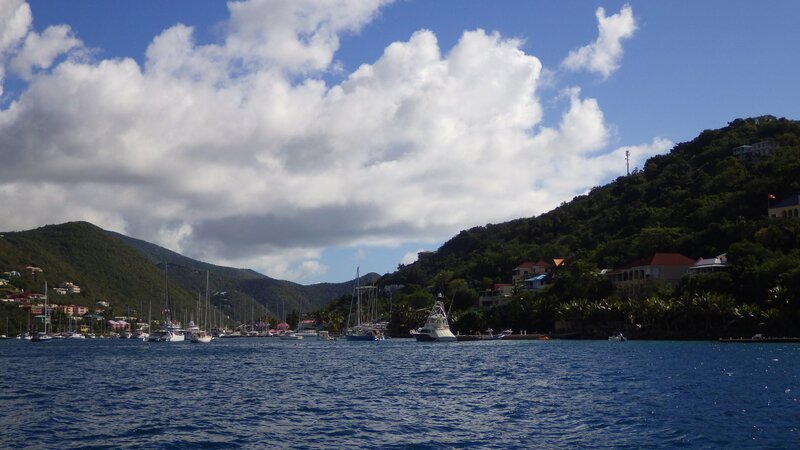 This was the postcard picture perfect little bay. Coconut palms overhanging the sandy beach, pretty gazebos, and the weather was perfect. 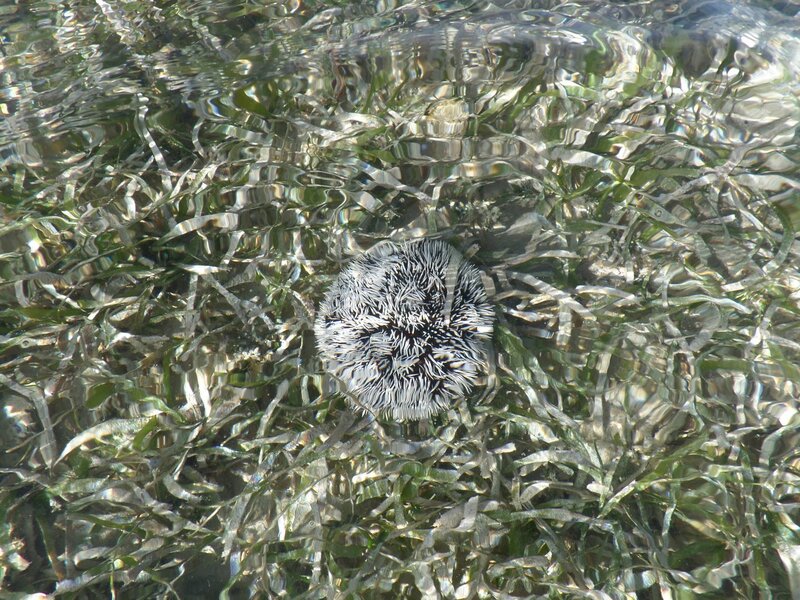 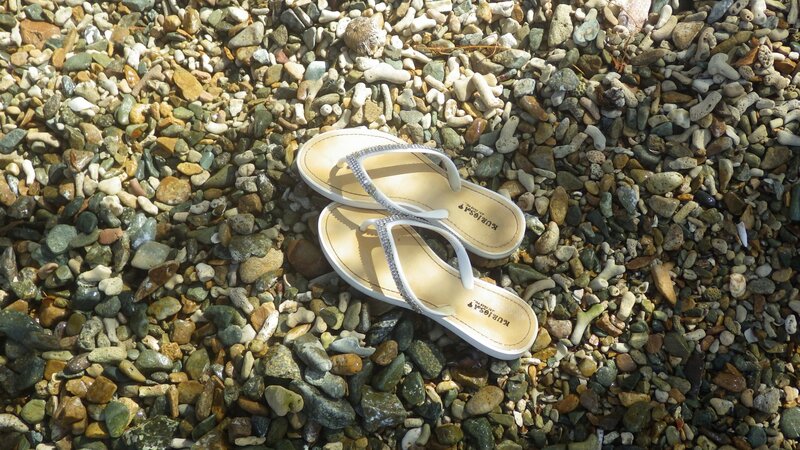 We walked along the pleasant shore, had a cooling swim and relaxed. 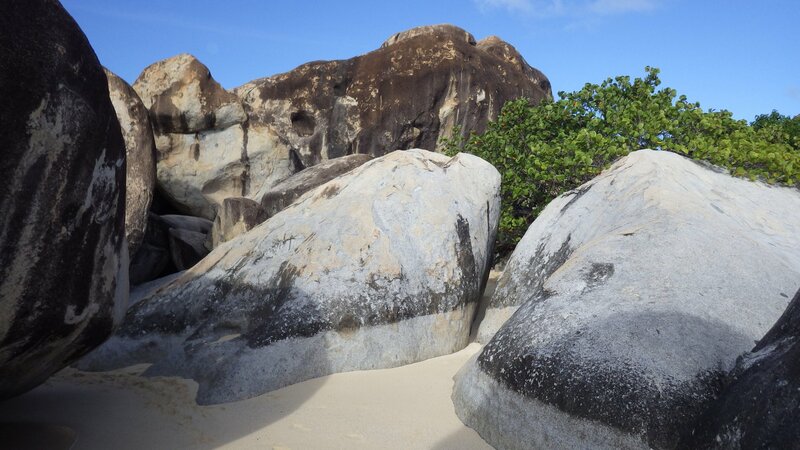 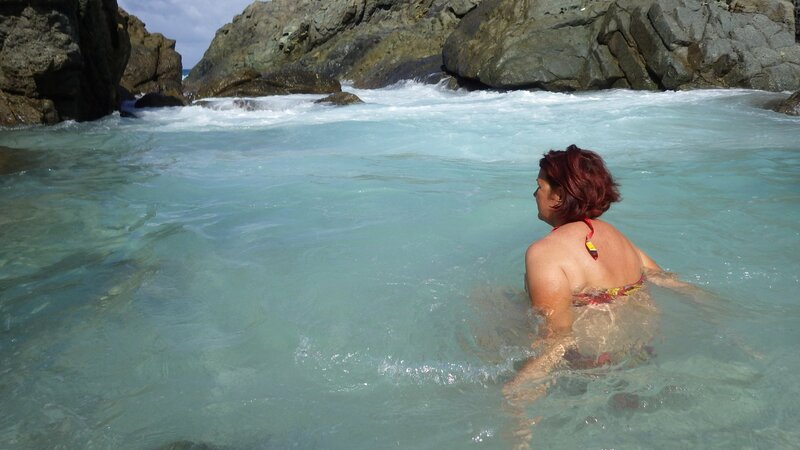 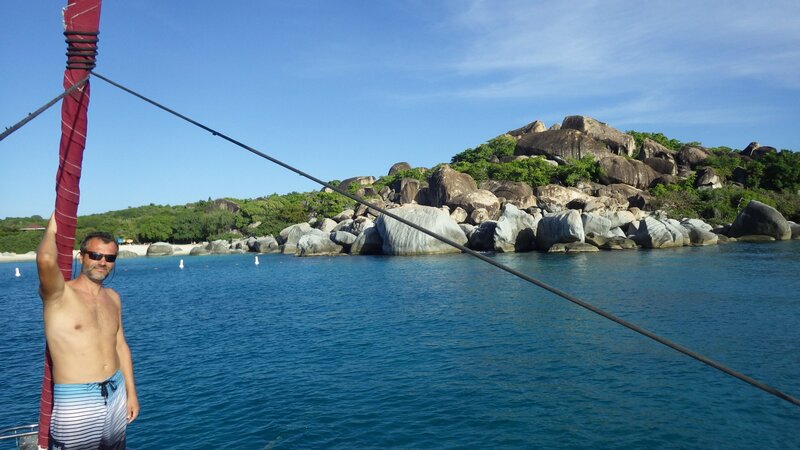 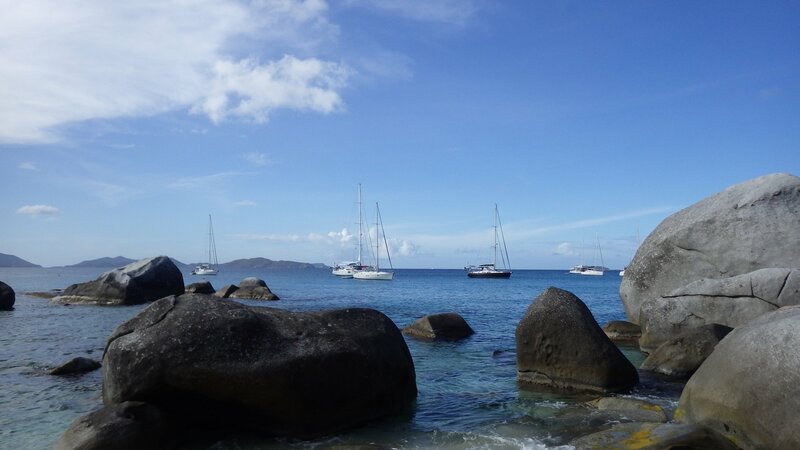 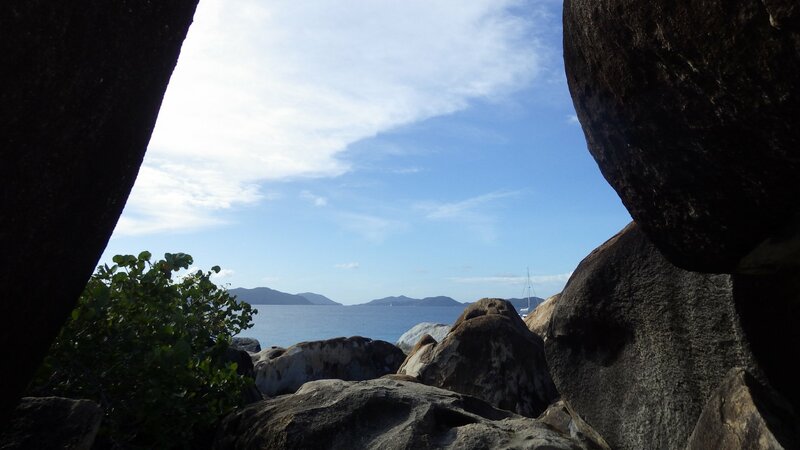 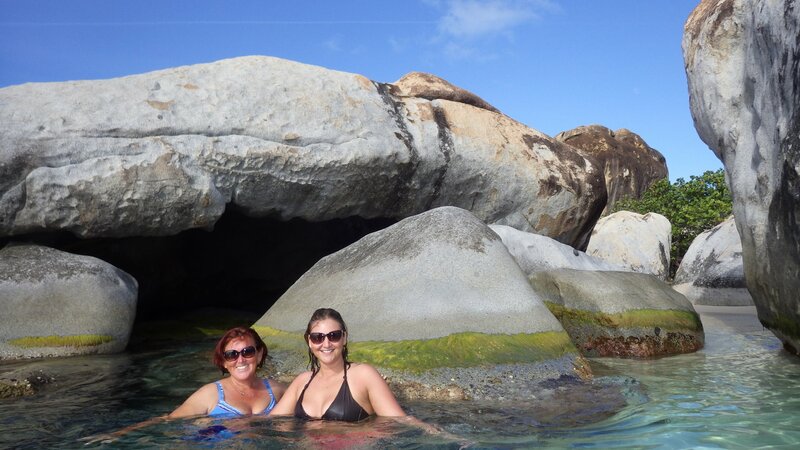 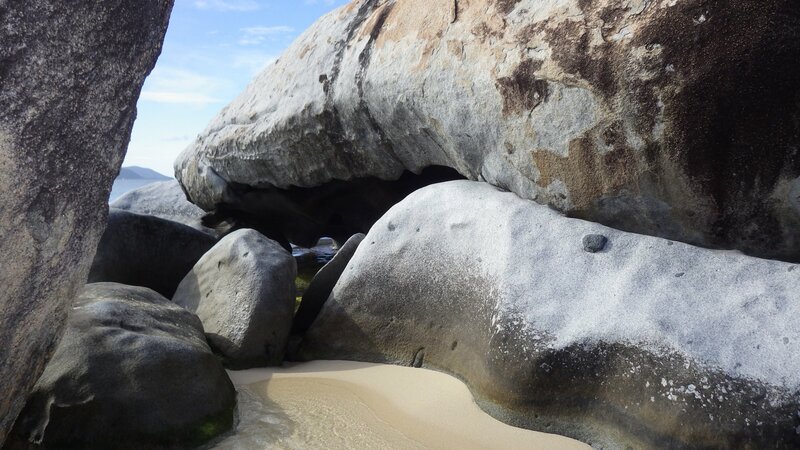 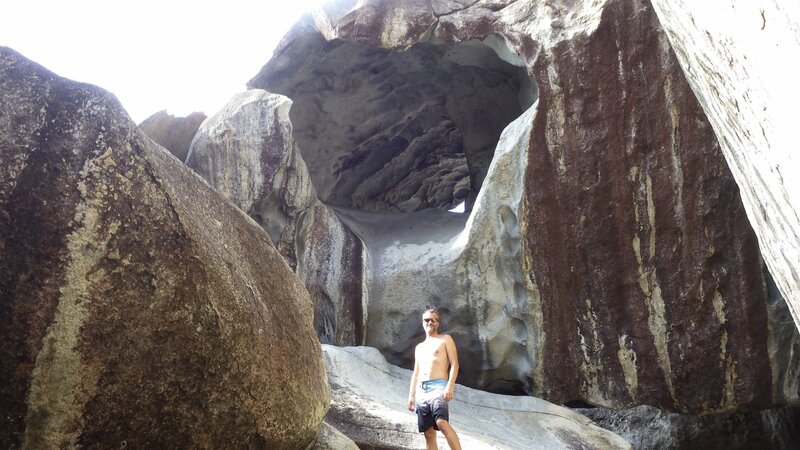 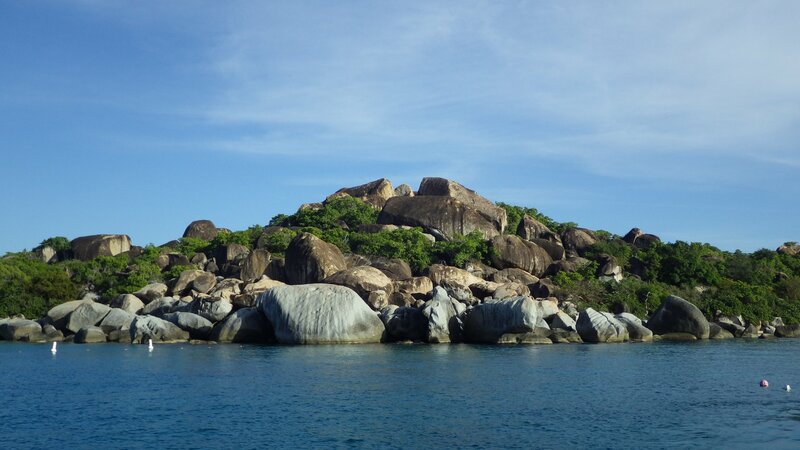 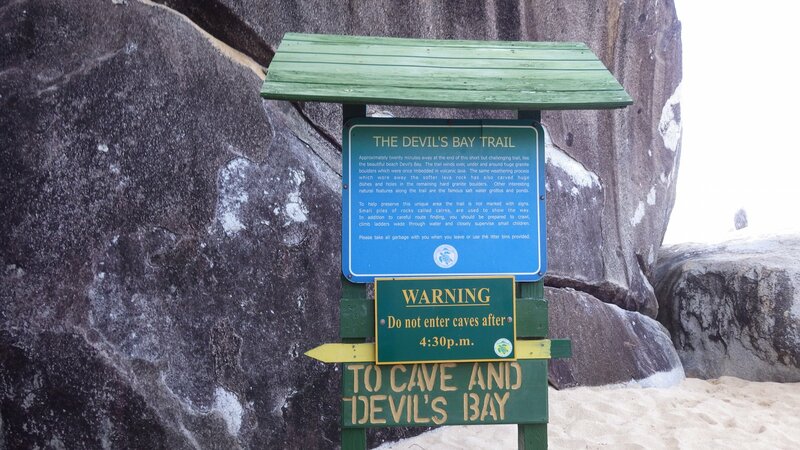 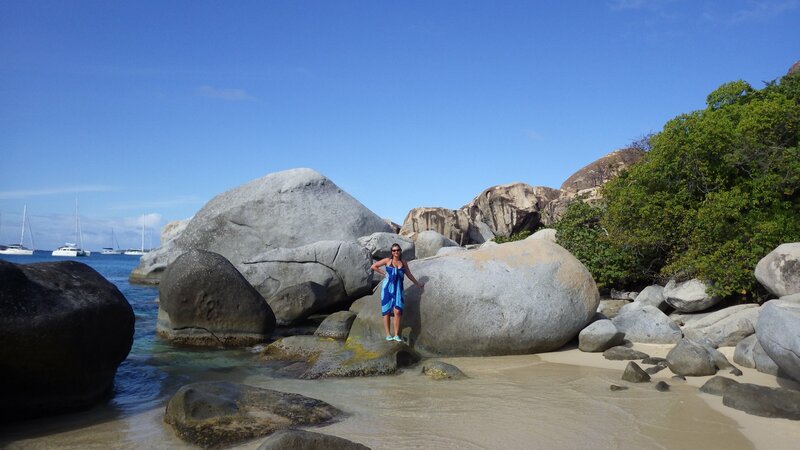 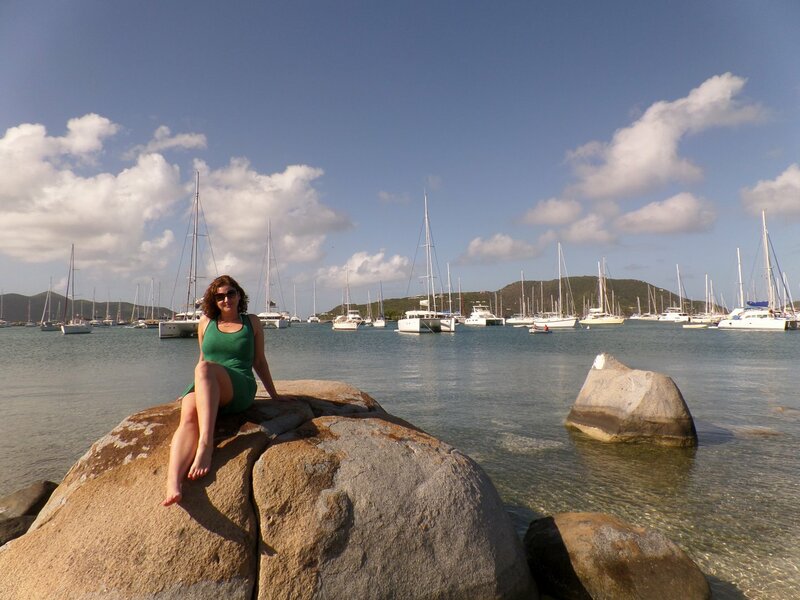 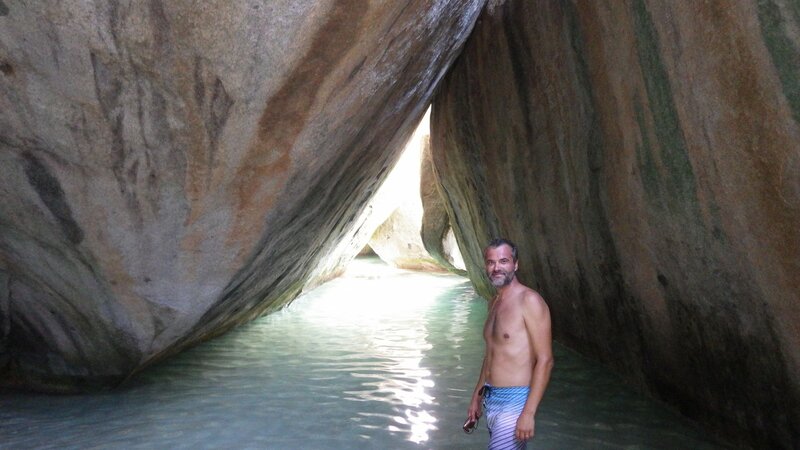 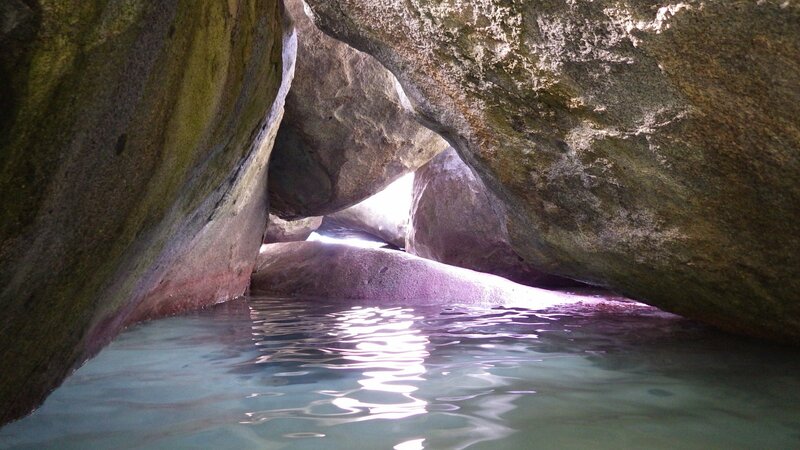 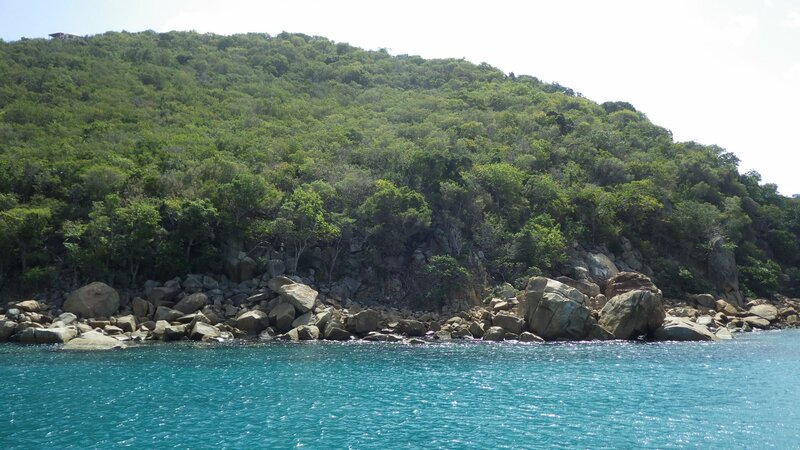 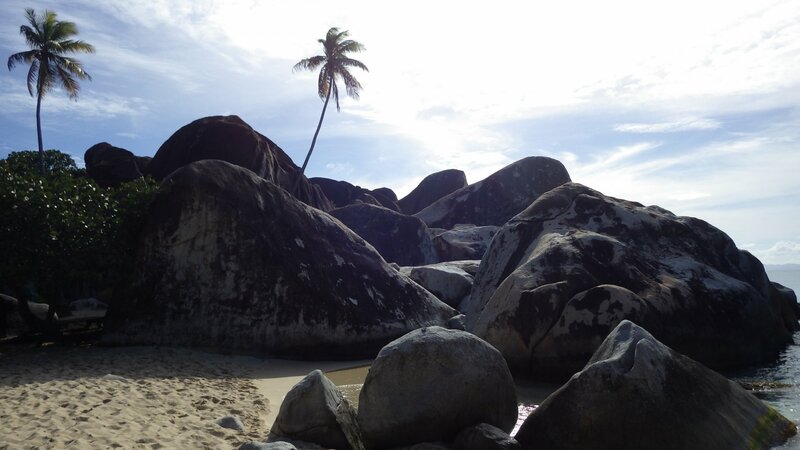 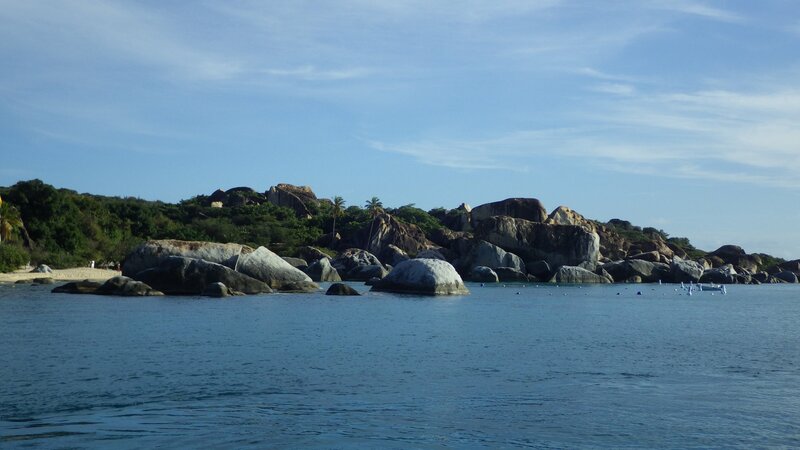 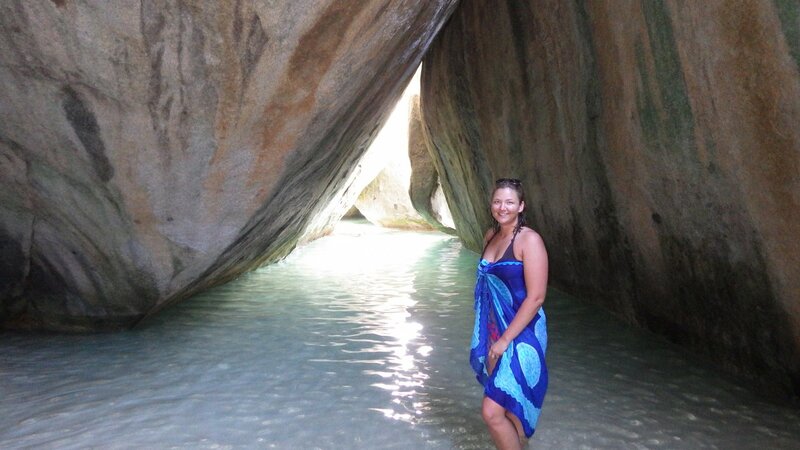 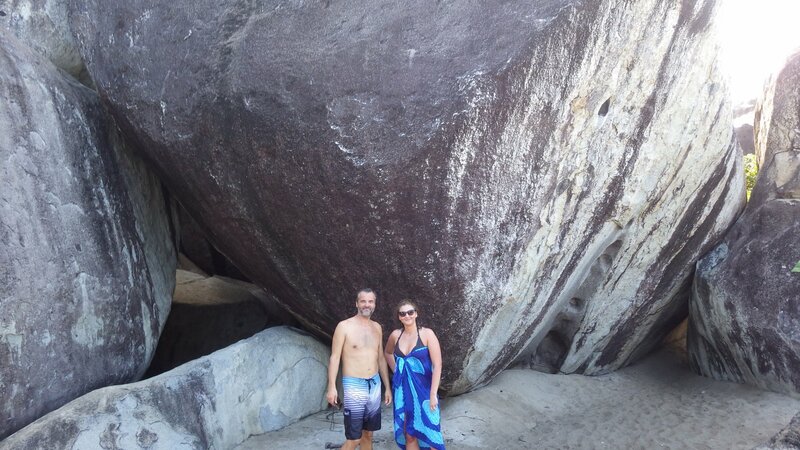 The Baths on the southwest tip of Virgin Gorda was a highlight of our BVI visit. 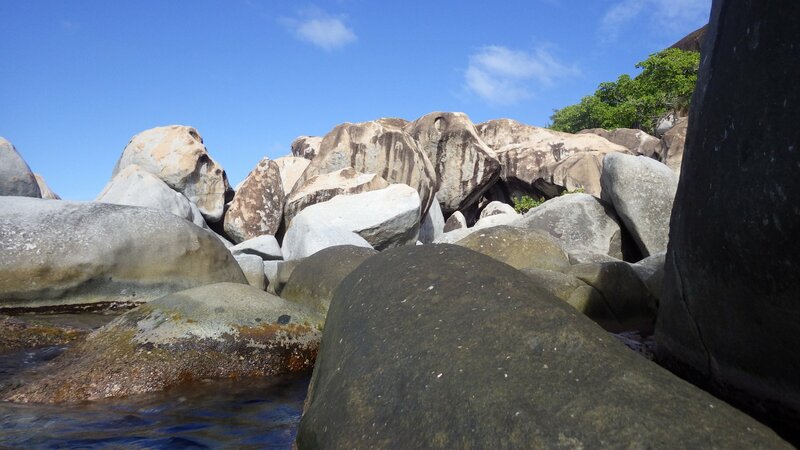 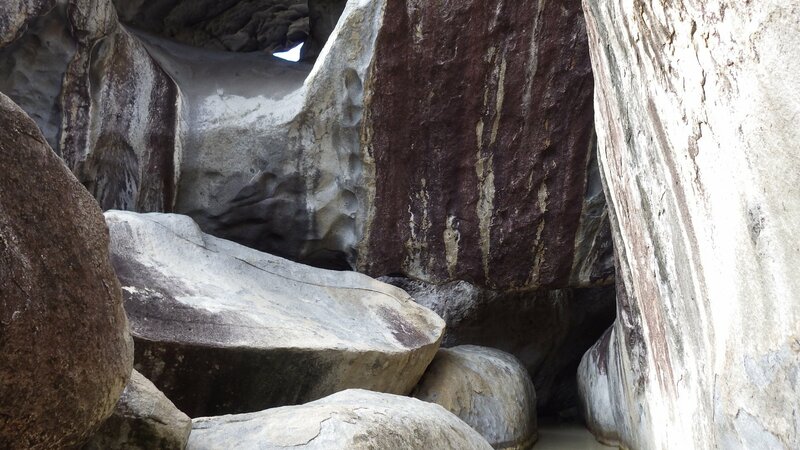 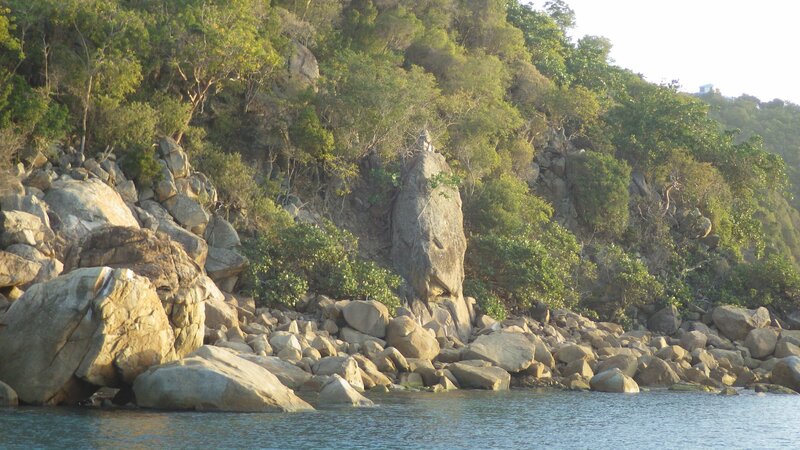 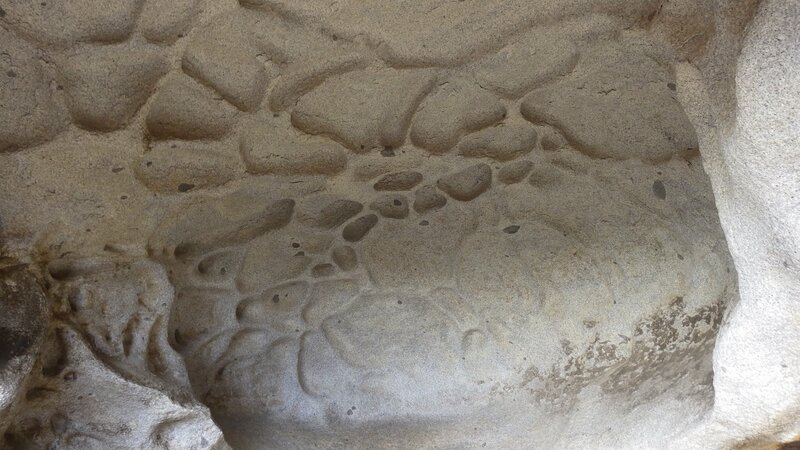 It is an unusual formation of large boulders at the water's edge, with paths and caves between them. 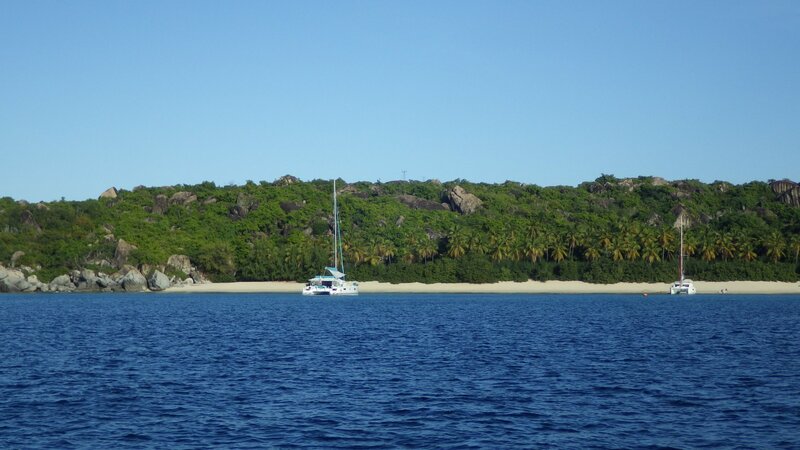 We were here only one afternoon and had to leave to an overnight anchorage nearby. 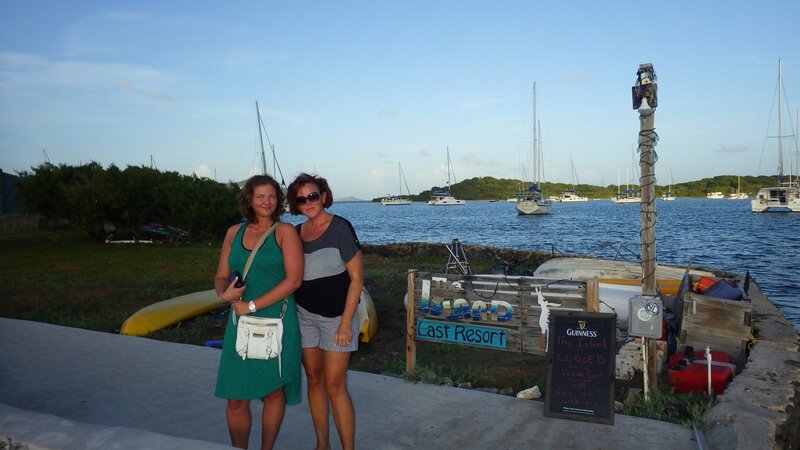 Wish we stayed a bit longer. 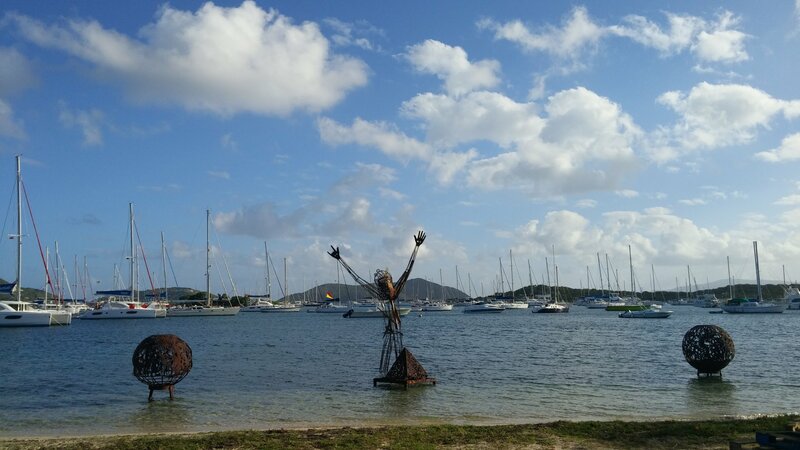 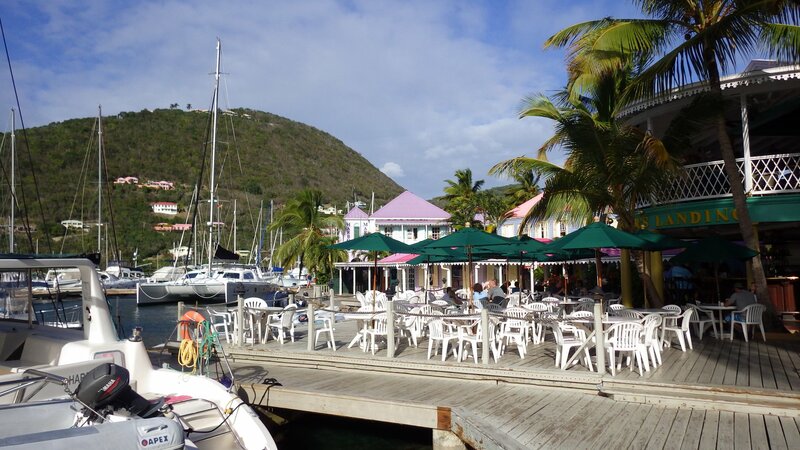 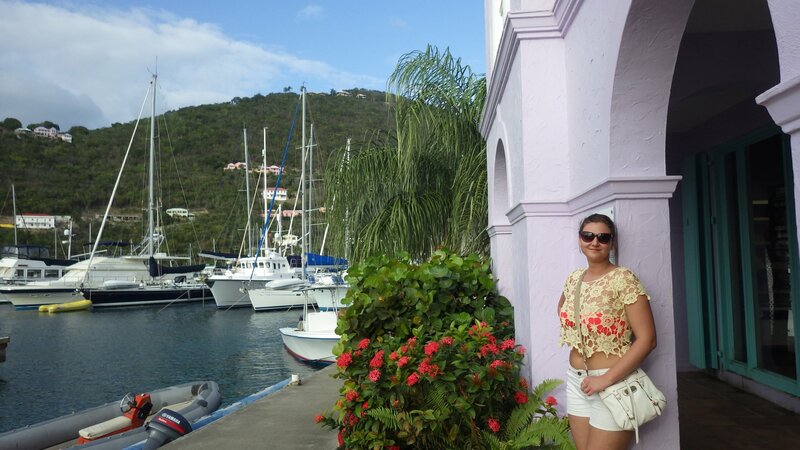 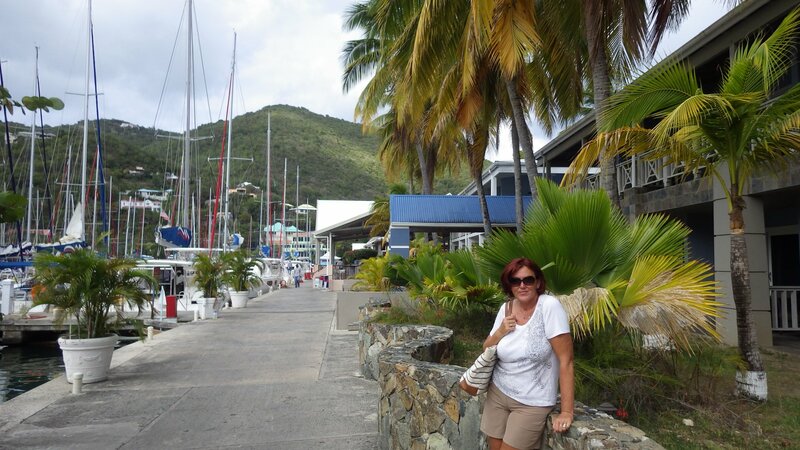 We had a lunch stop at Virgin Gorda Yacht Harbour in Spanish Town. 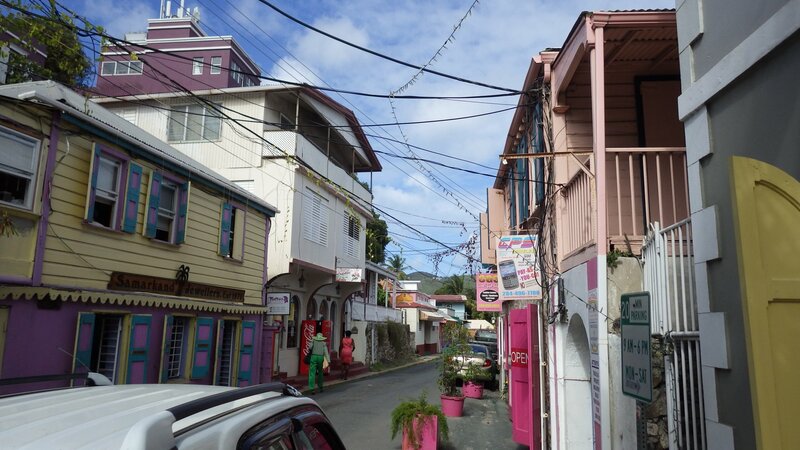 Apparently, there is no actual "town", with main street, etc. 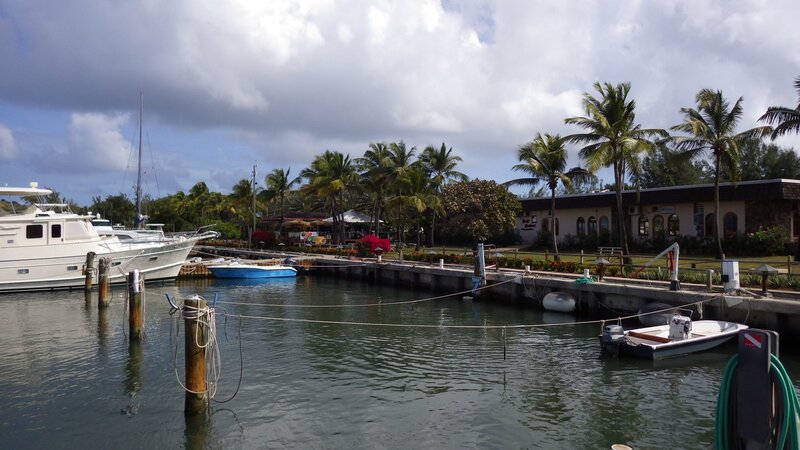 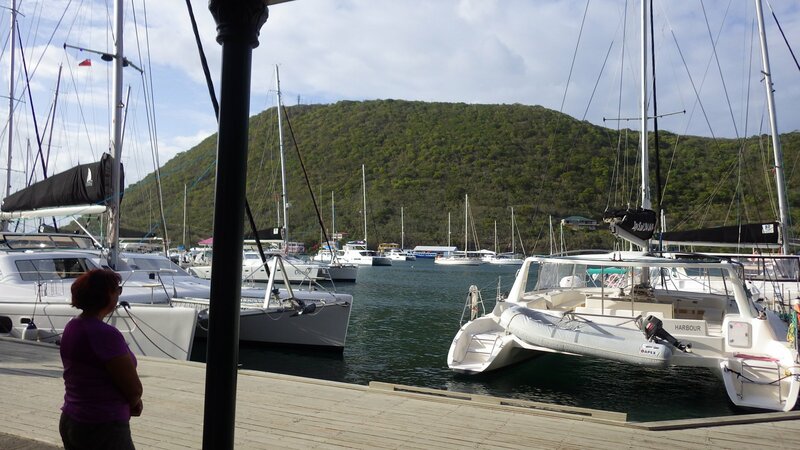 It's just a nice marina, a boat yard, few stores and streets with simple houses. 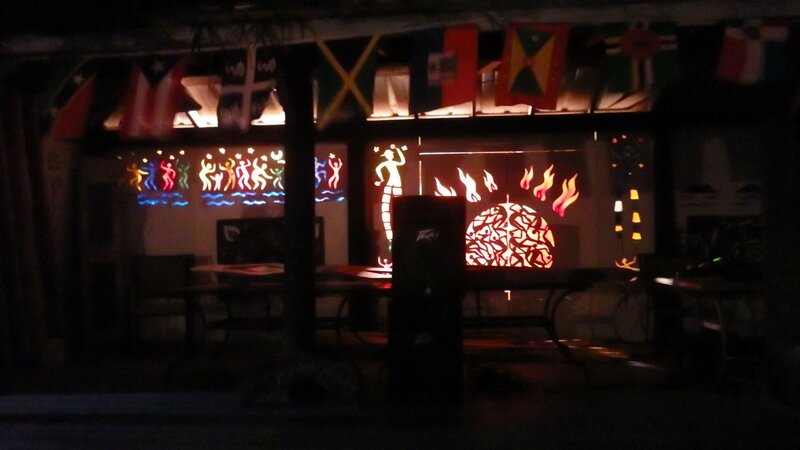 Got wi-fi at the restaurant to sync-up with the world. 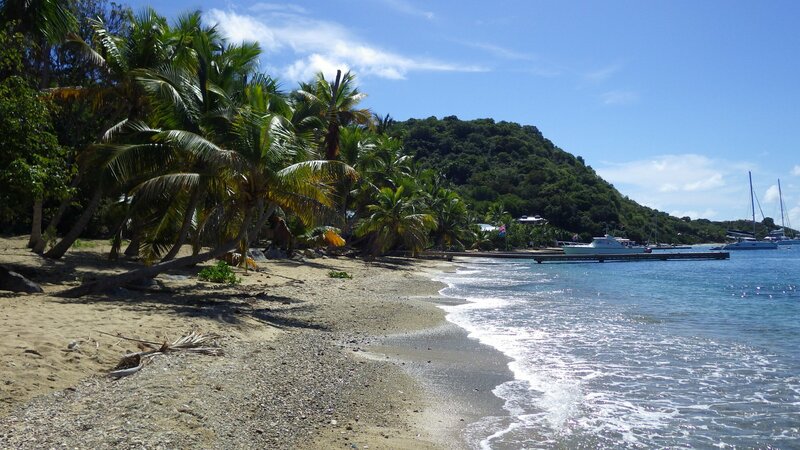 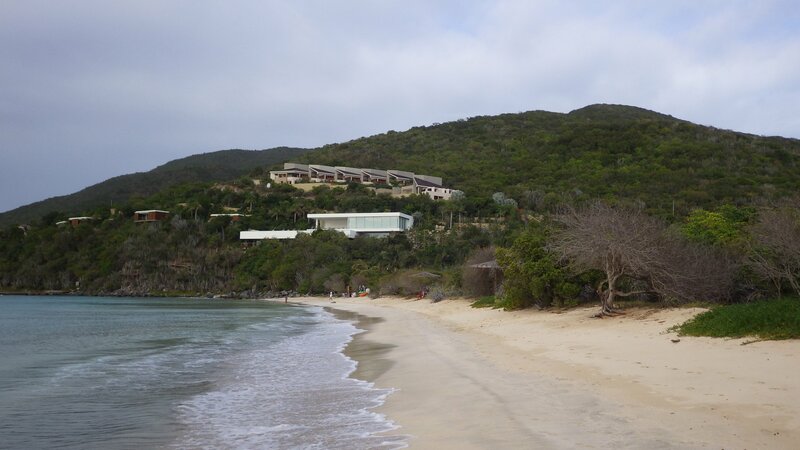 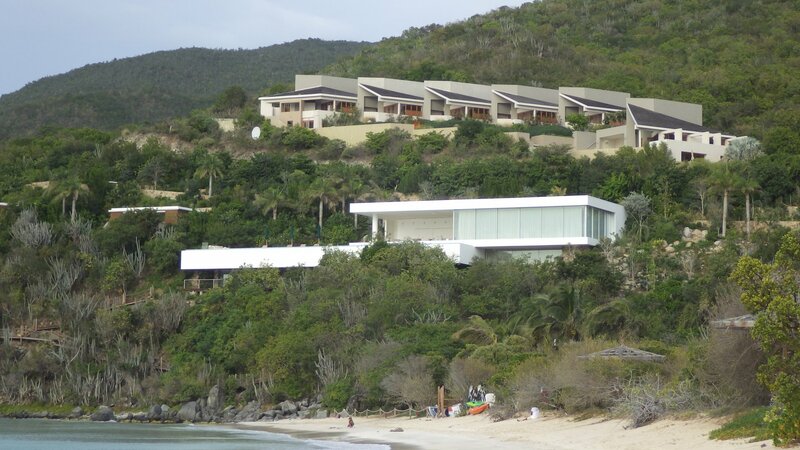 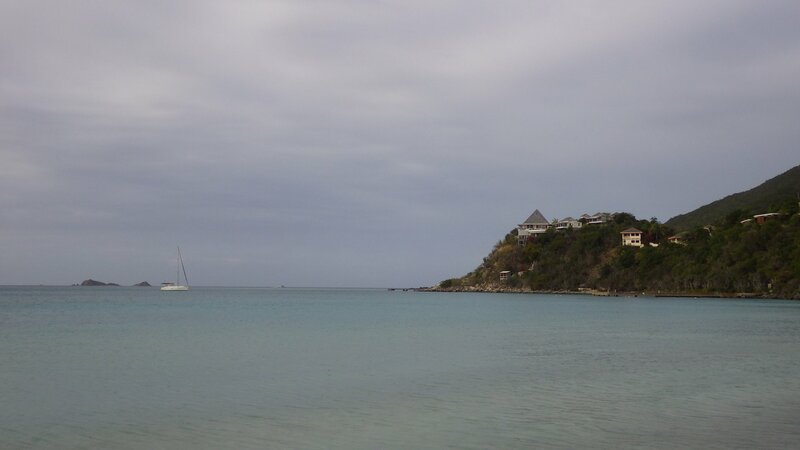 We stayed one night at these pretty bays, with beautiful white sandy beaches. 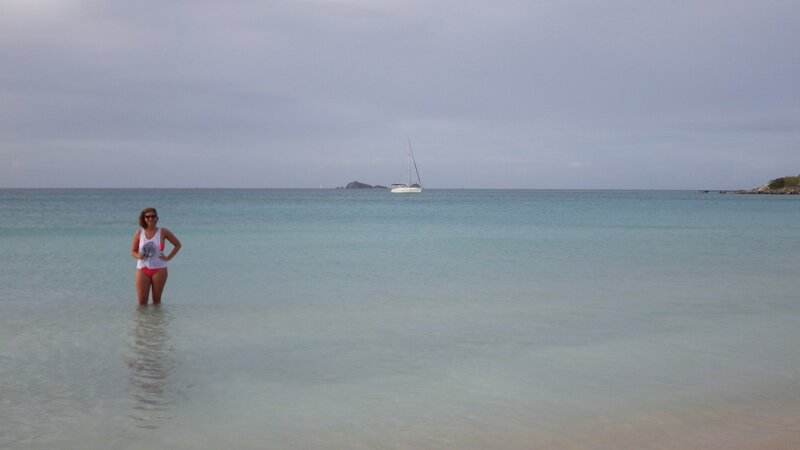 The water was calm and inviting. 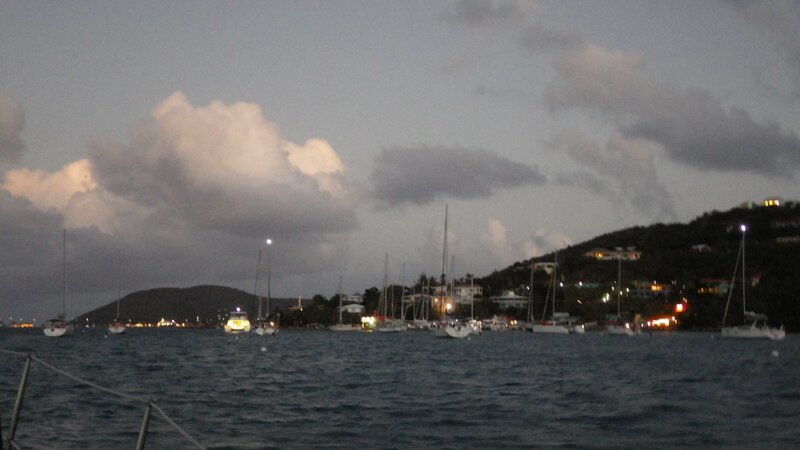 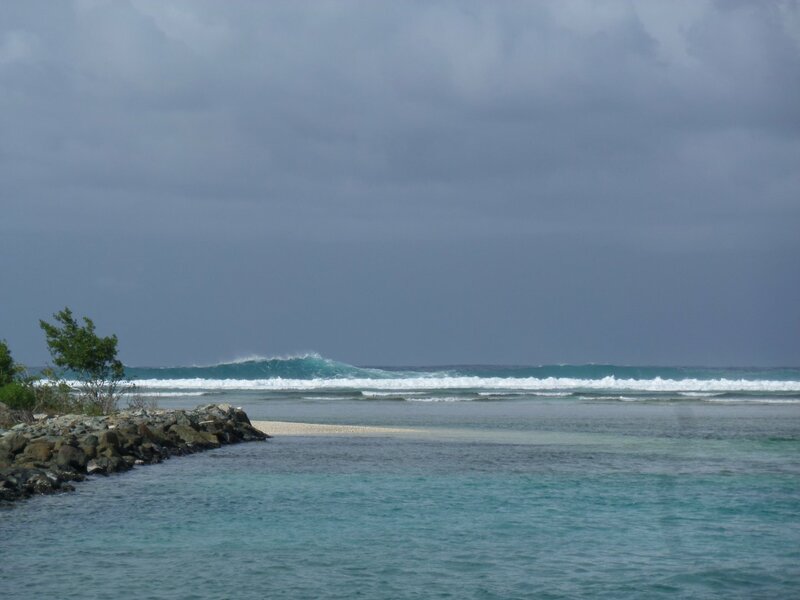 Unexpectedly, during the night, a northerly swell came in and our boat started to roll. 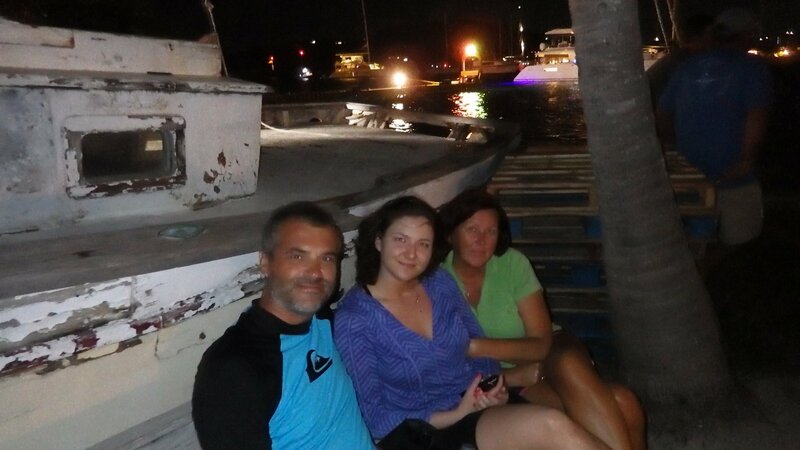 None of us slept well that night. 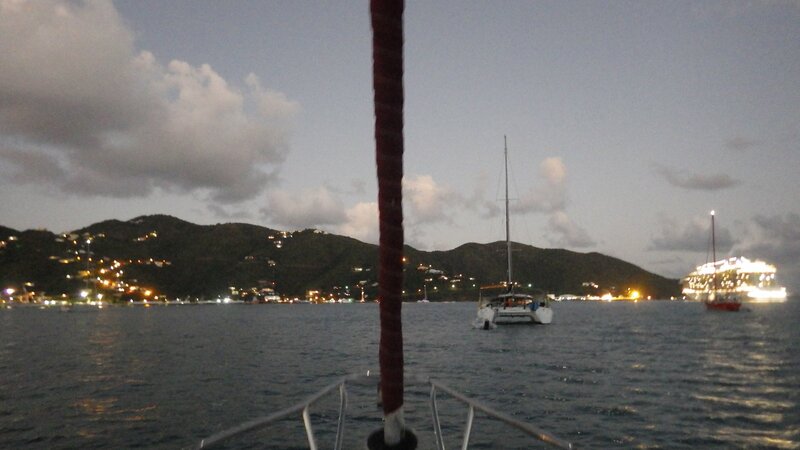 We took off at first light, back to Trelis Bay. 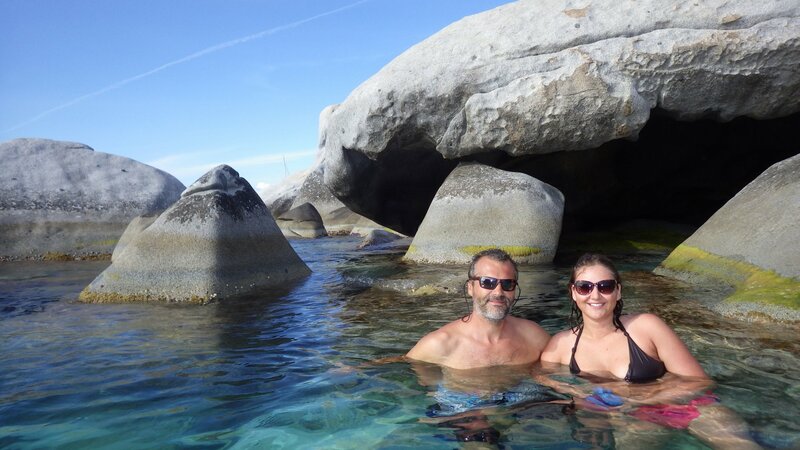 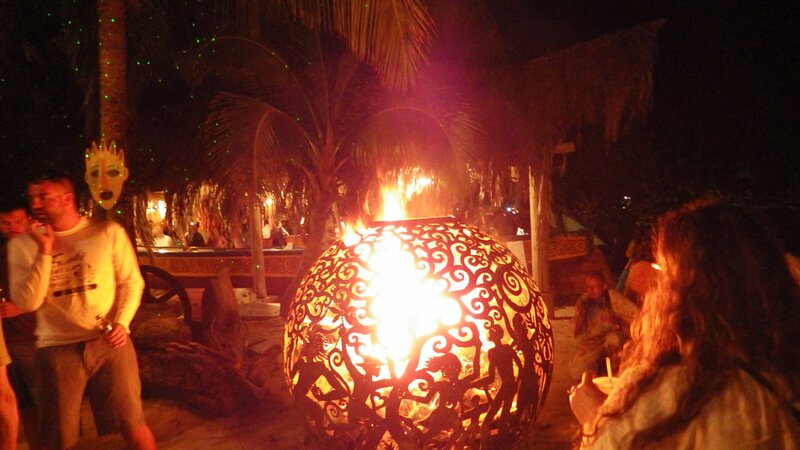 This was just a one night stay � we wanted to get away from the crowds to a quieter spot. 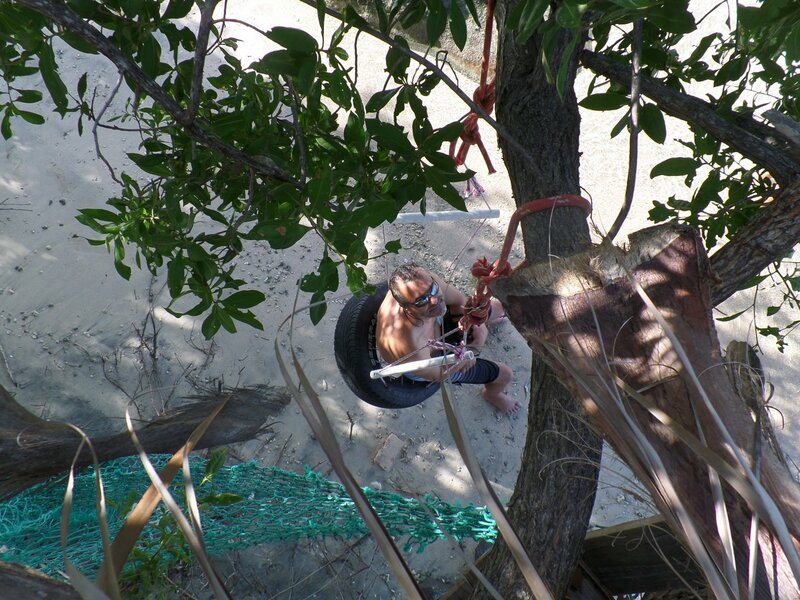 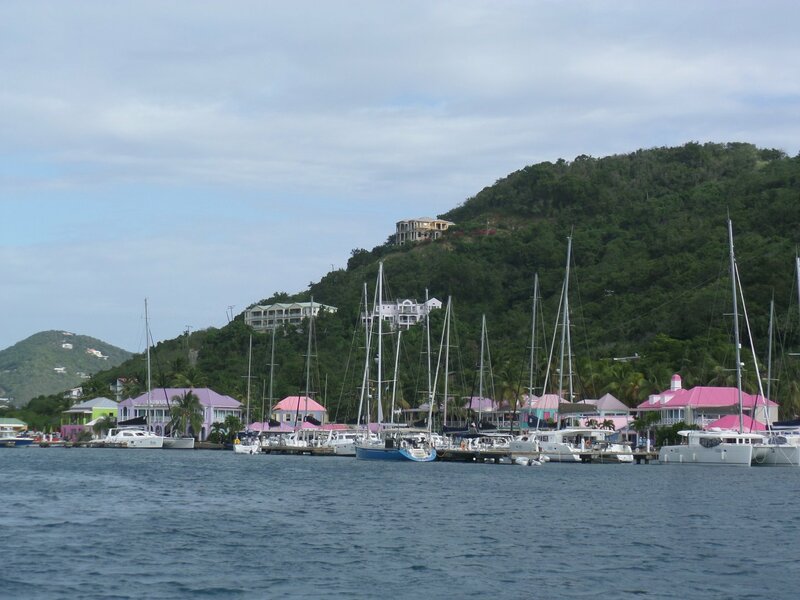 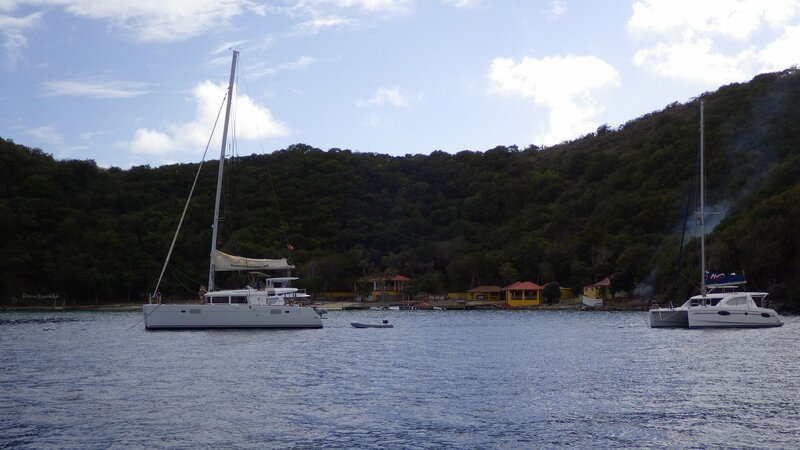 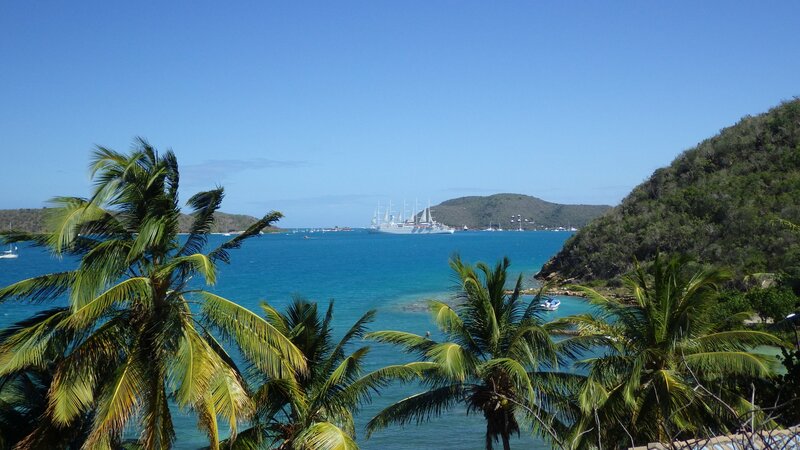 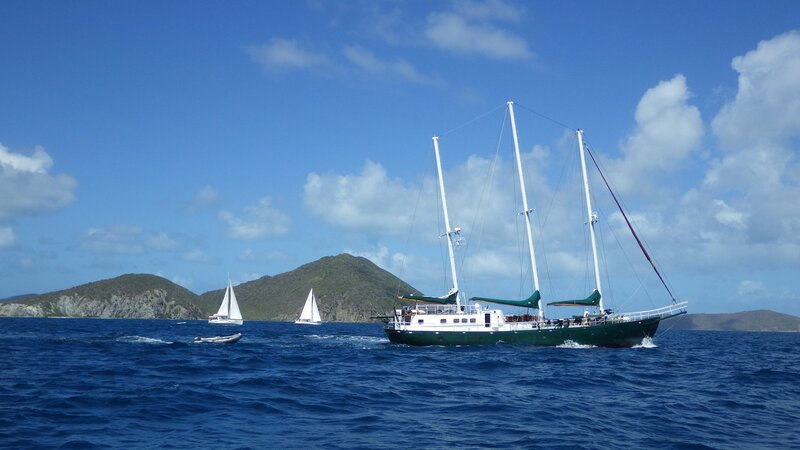 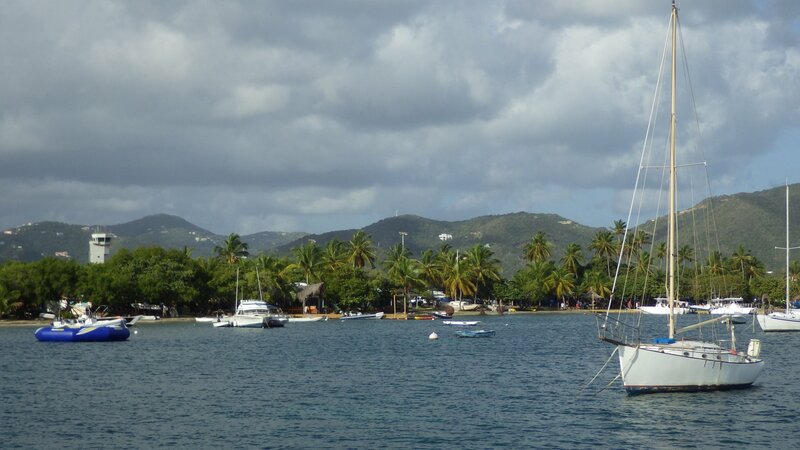 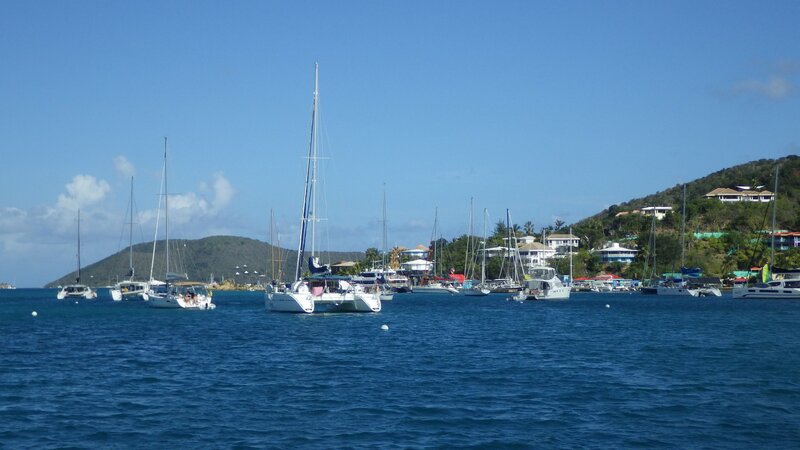 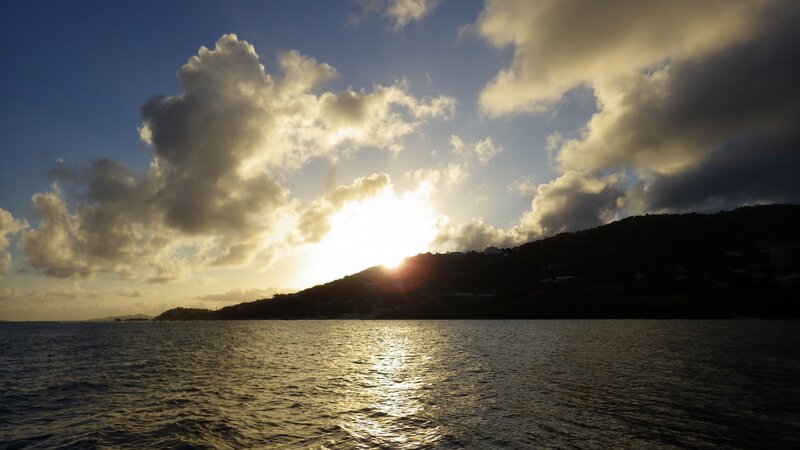 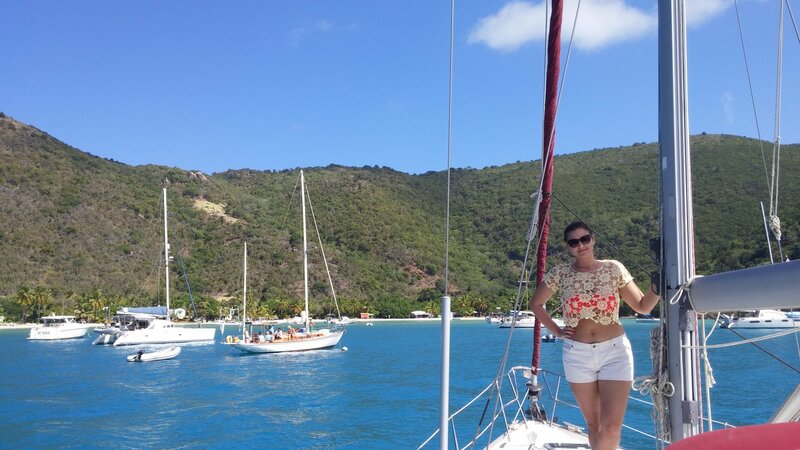 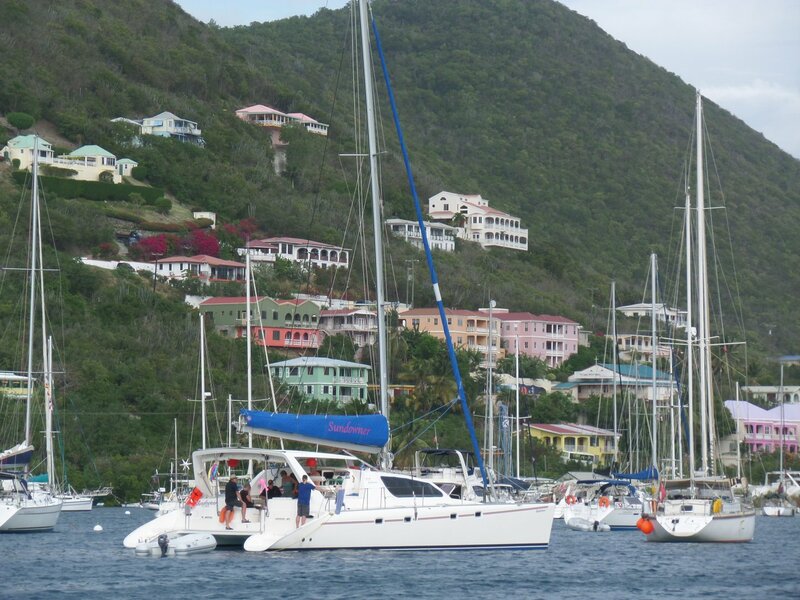 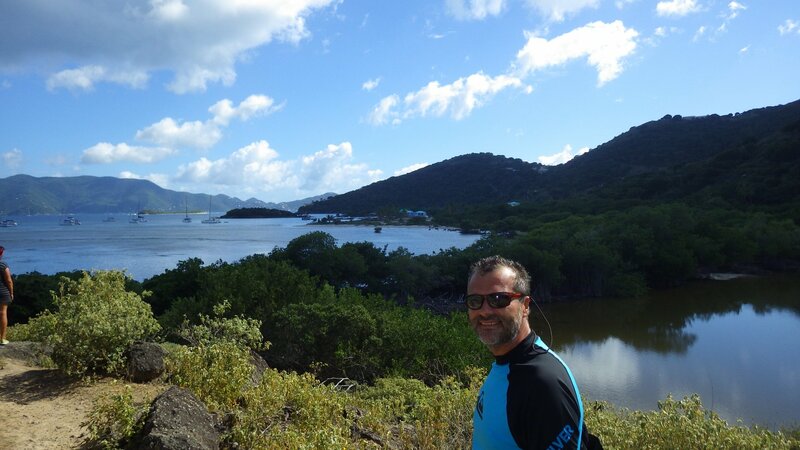 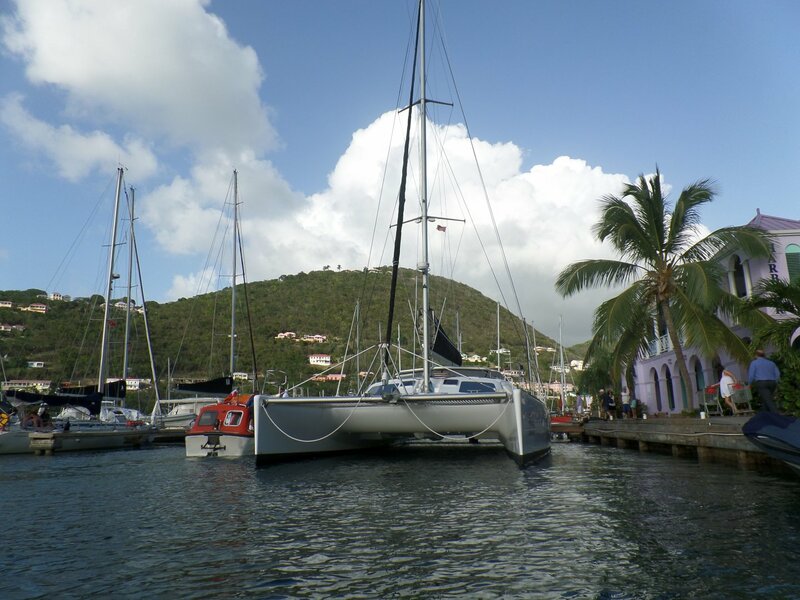 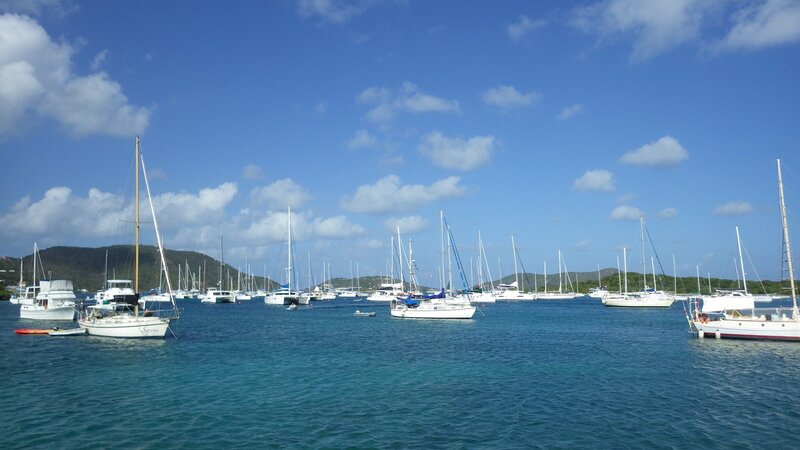 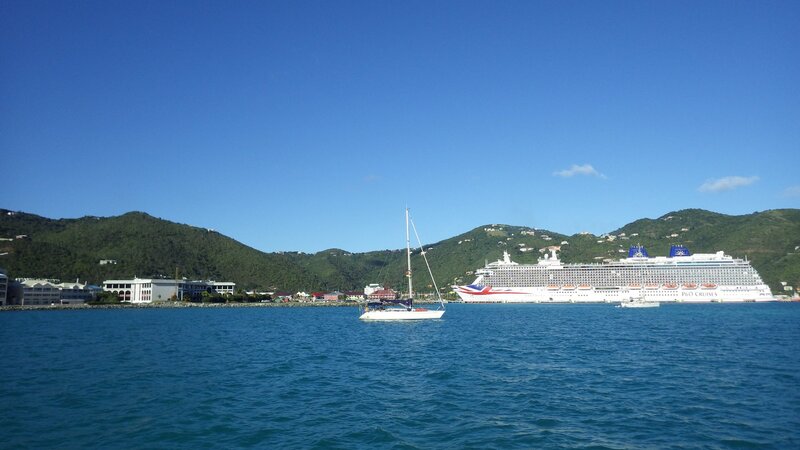 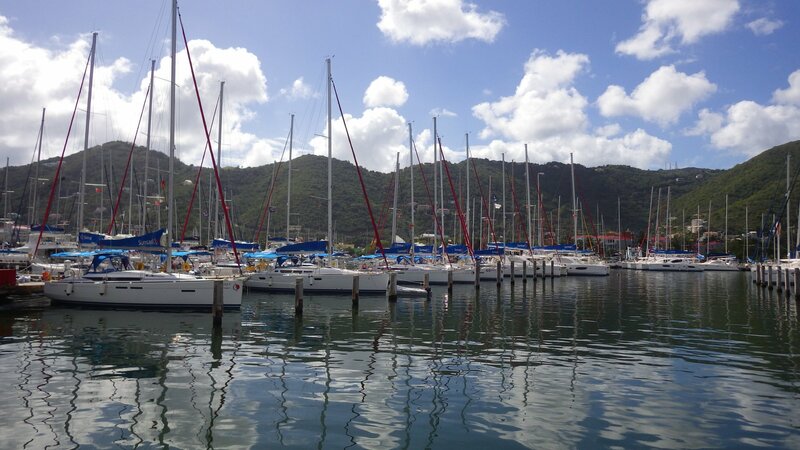 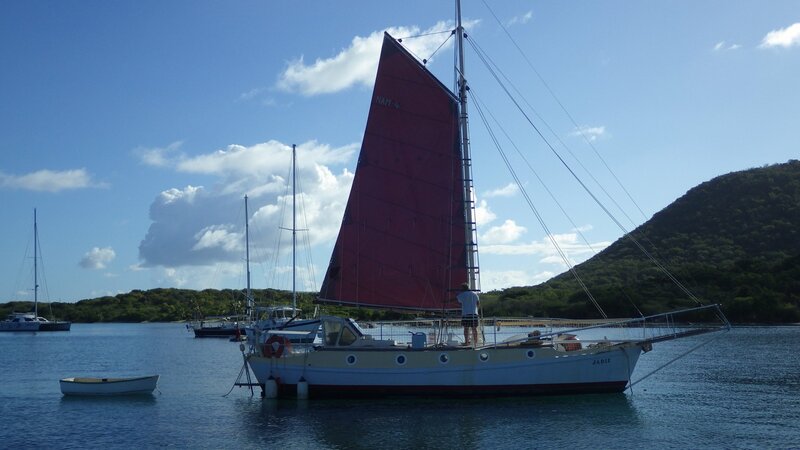 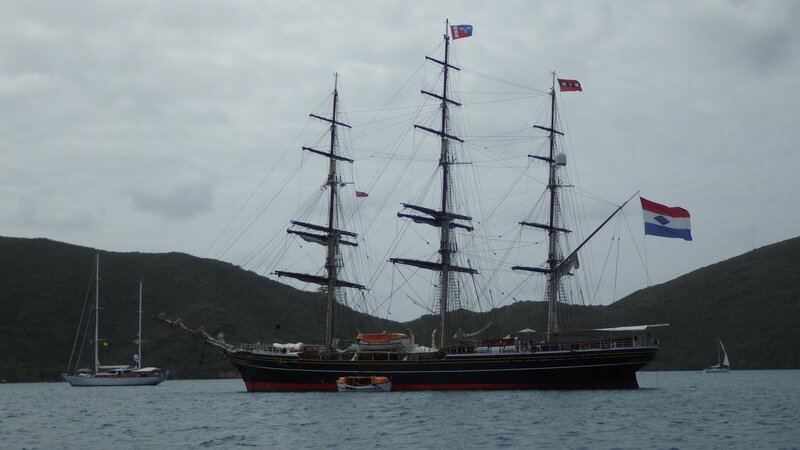 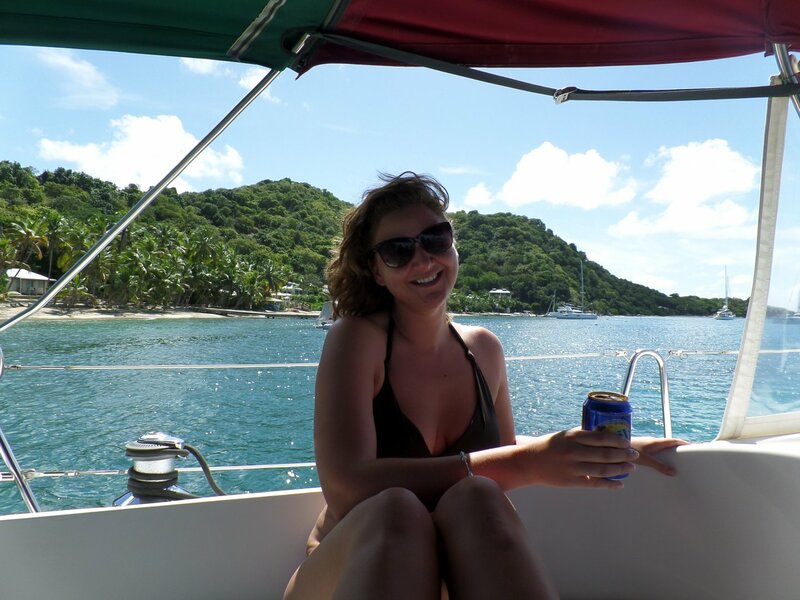 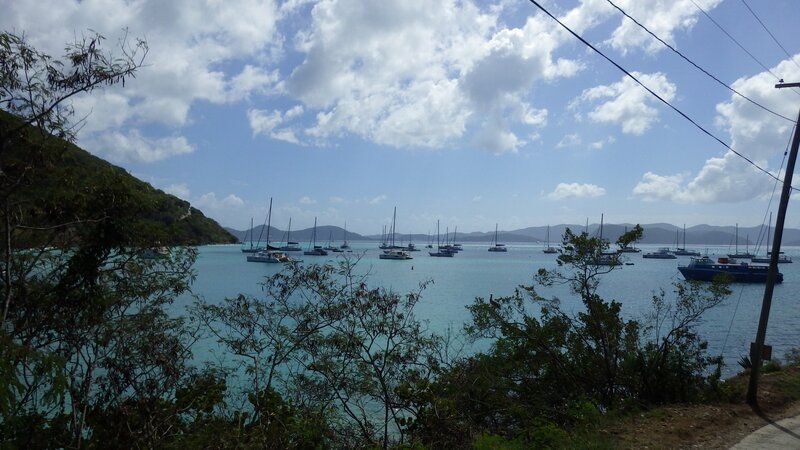 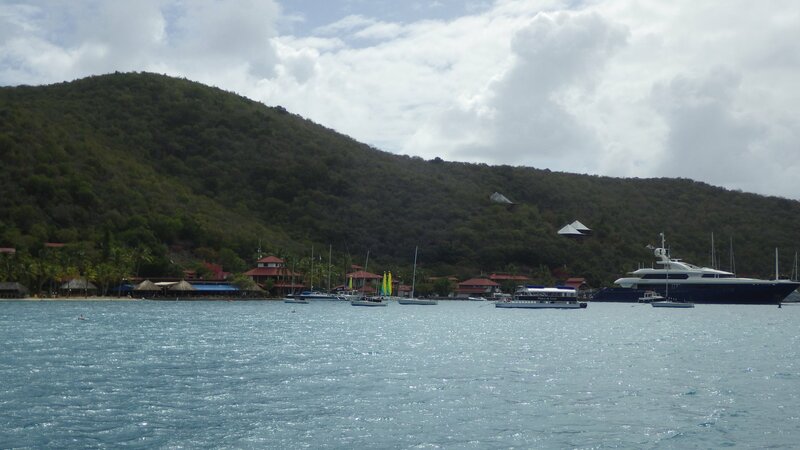 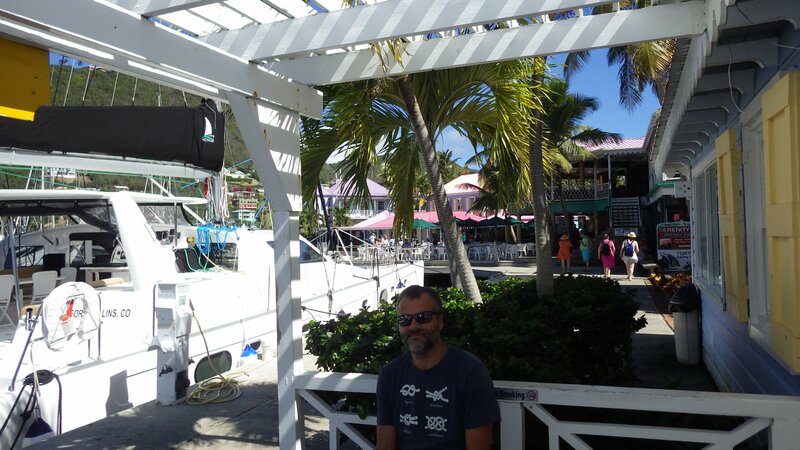 After we picked up our new mainsail at Road Town in Tortola, we tried it and sailed in the Sir Francis Drake Channel. 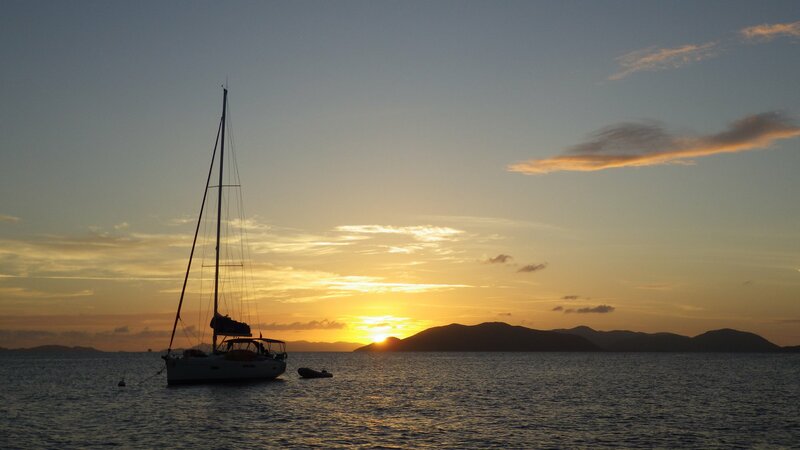 Good sail, good sailing. 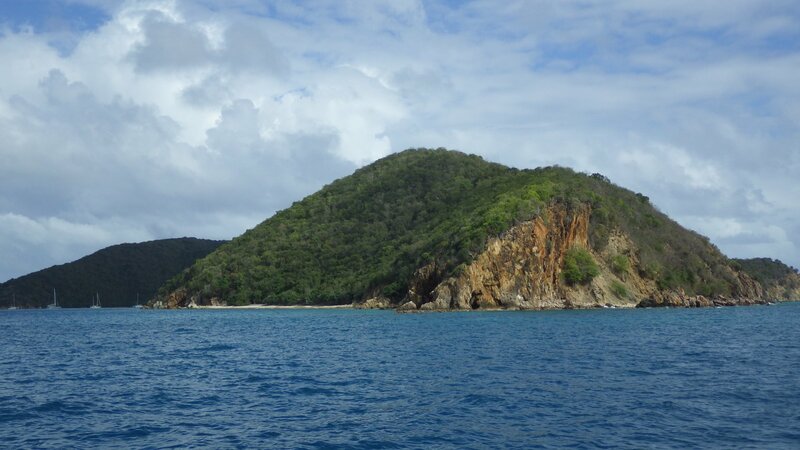 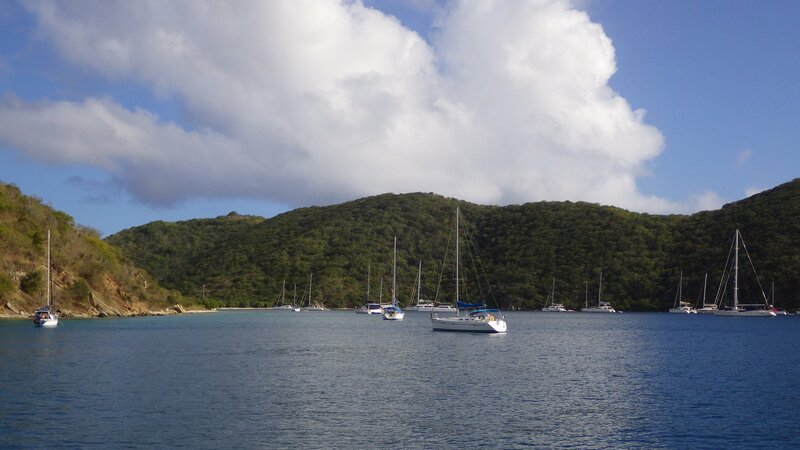 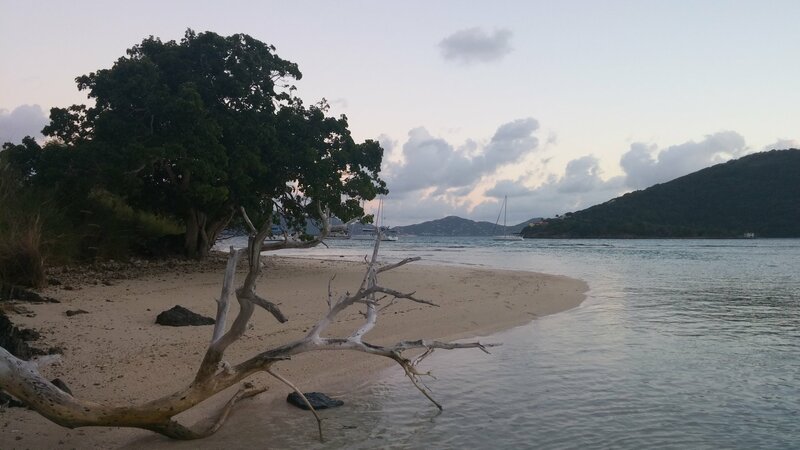 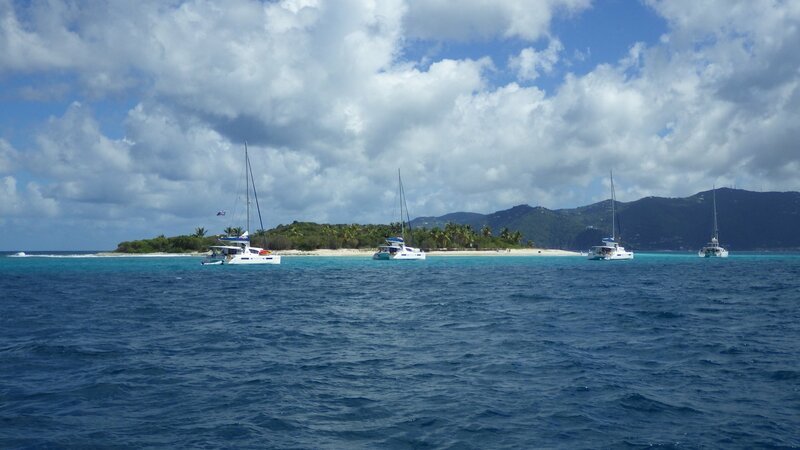 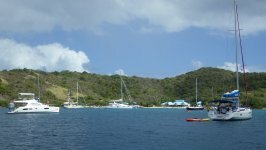 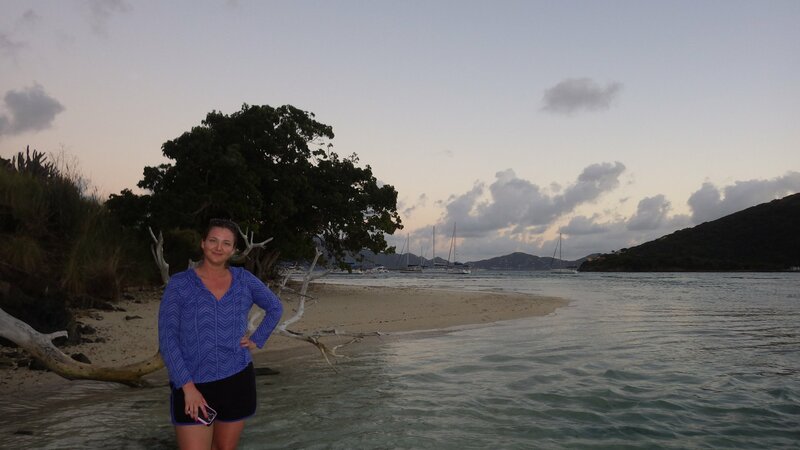 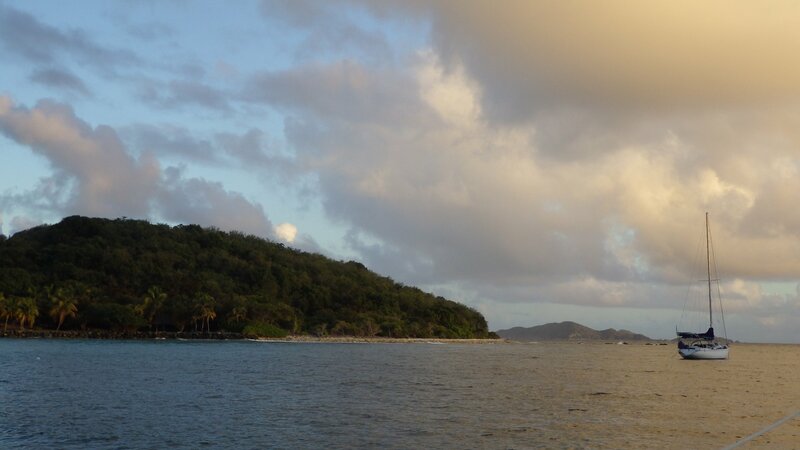 We then spent a night at Buck Island anchorage nearby, south of Tortola. 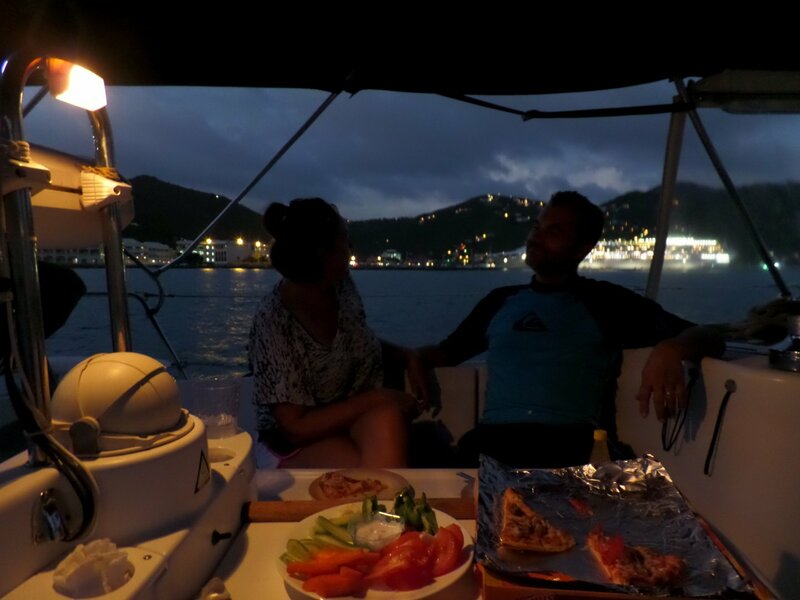 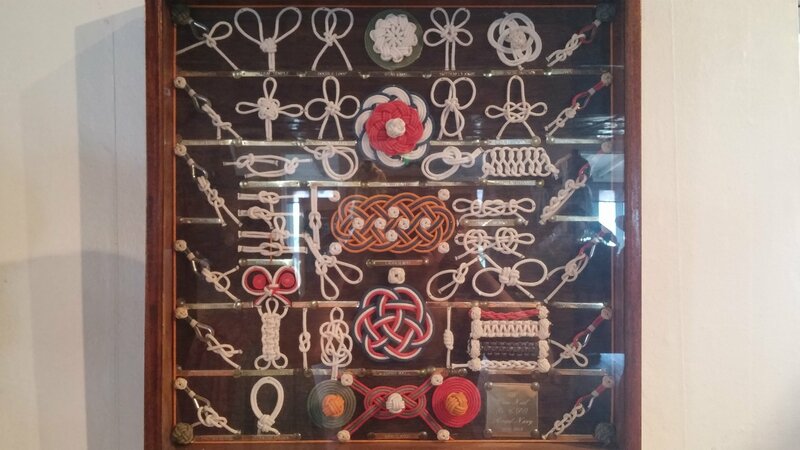 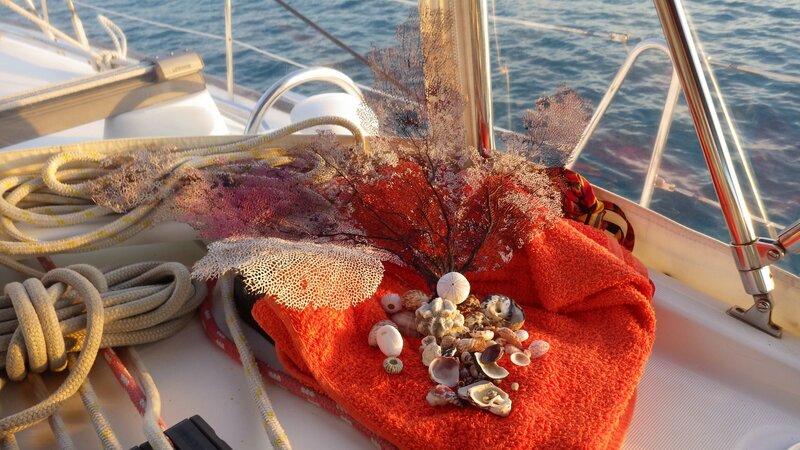 The wind and waves came to the anchorage at an angle, so I put the anchoring bridle � it proved to be a wise decision and we had a nice, not rolly night. 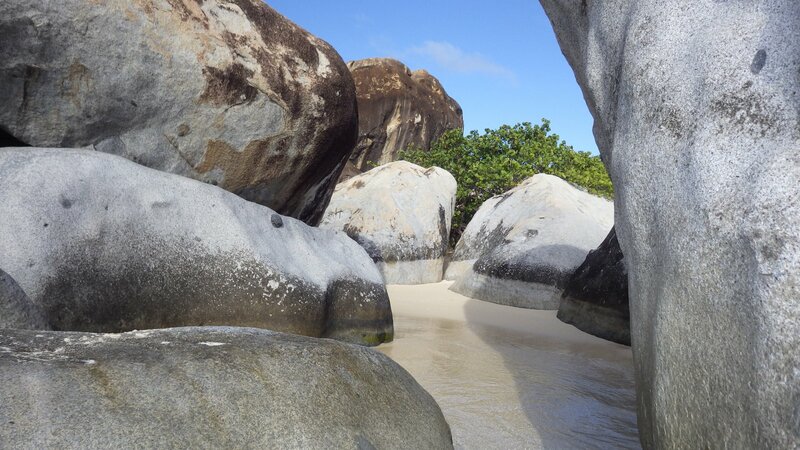 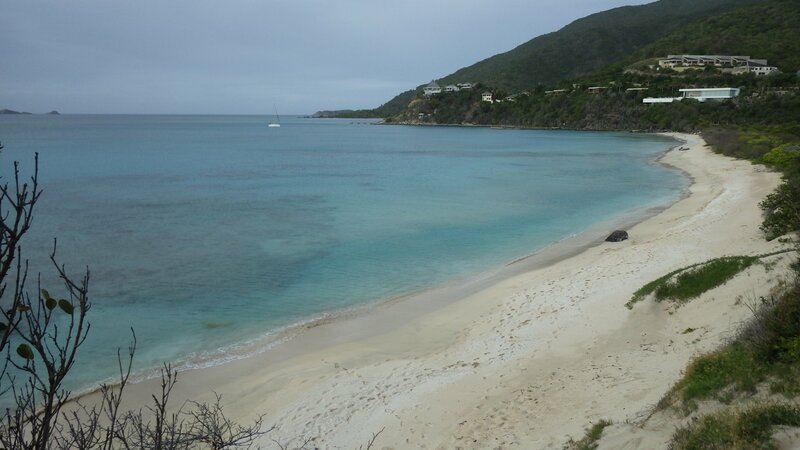 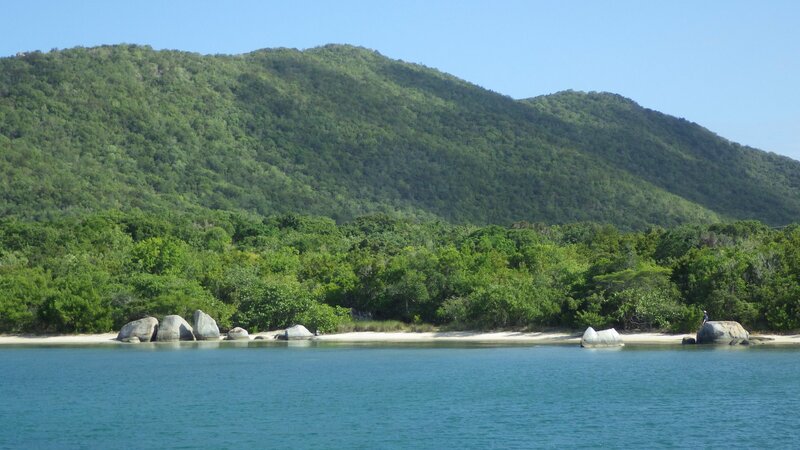 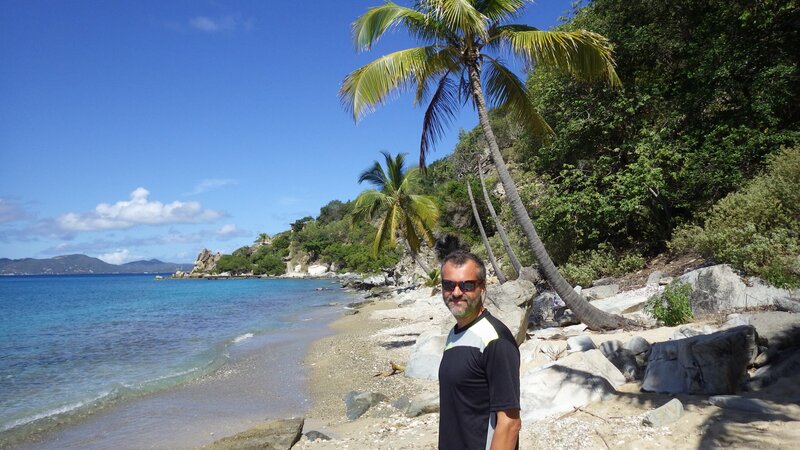 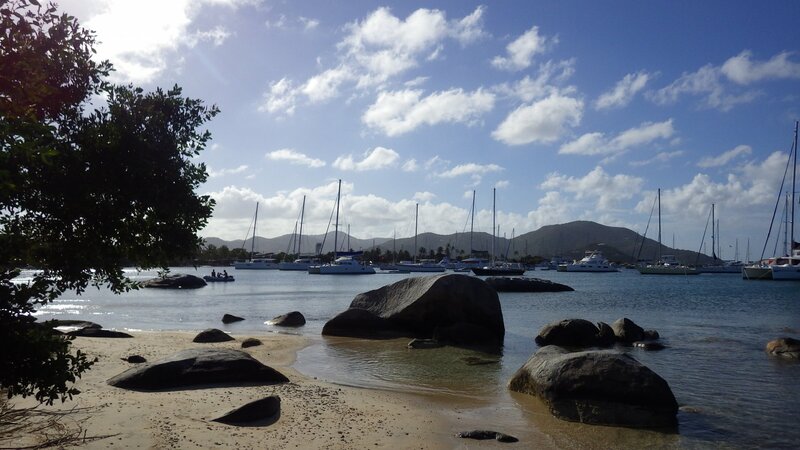 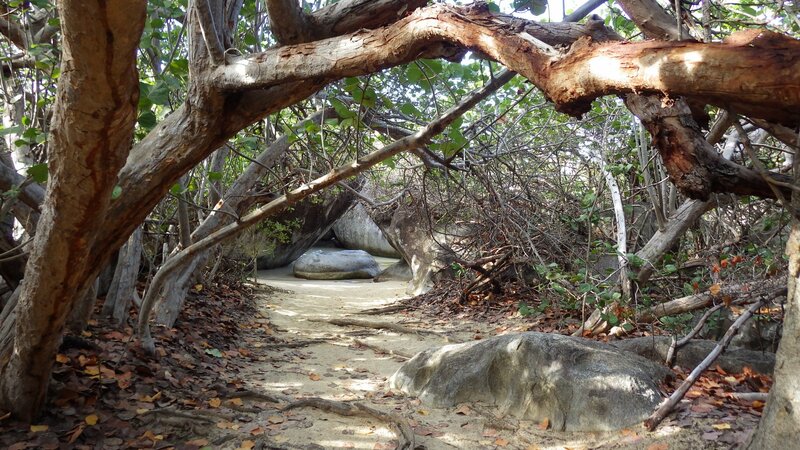 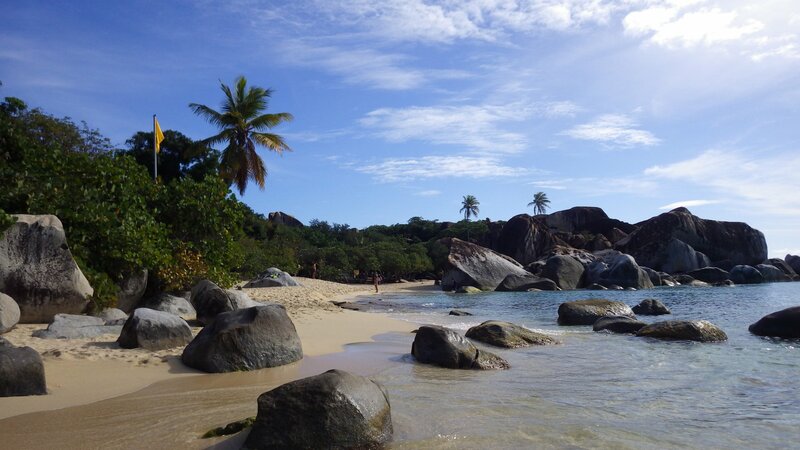 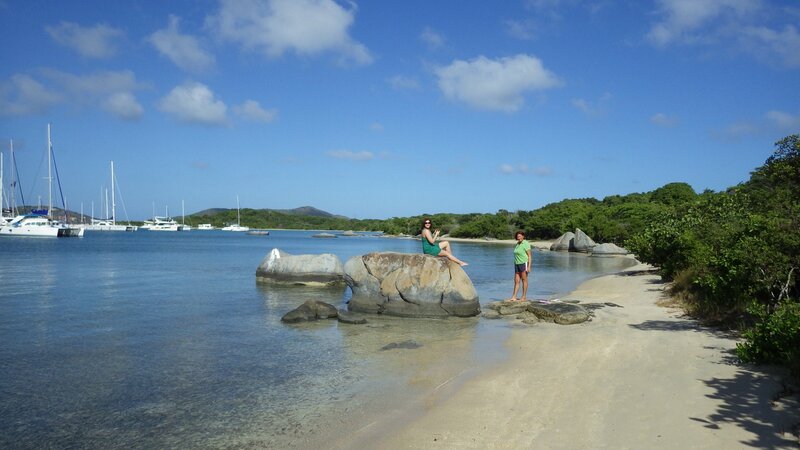 Leverick Bay is a lovely spot on Virgin Gorda Island. 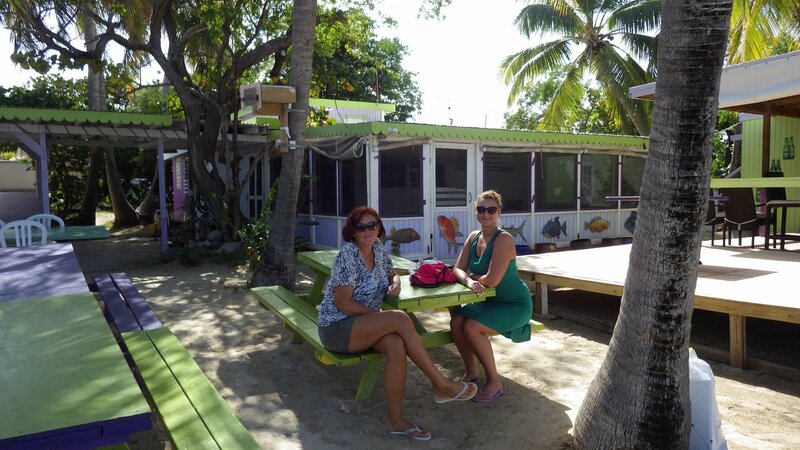 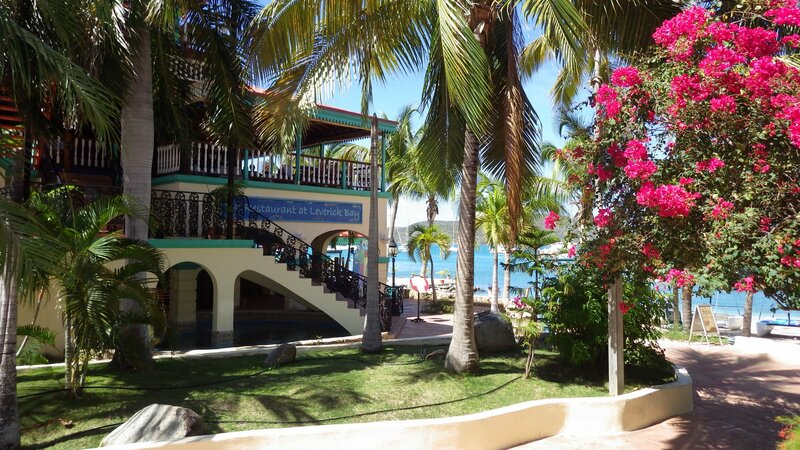 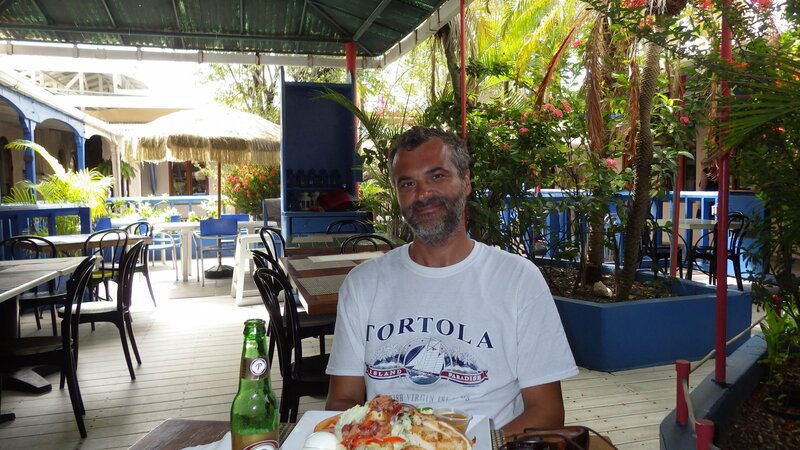 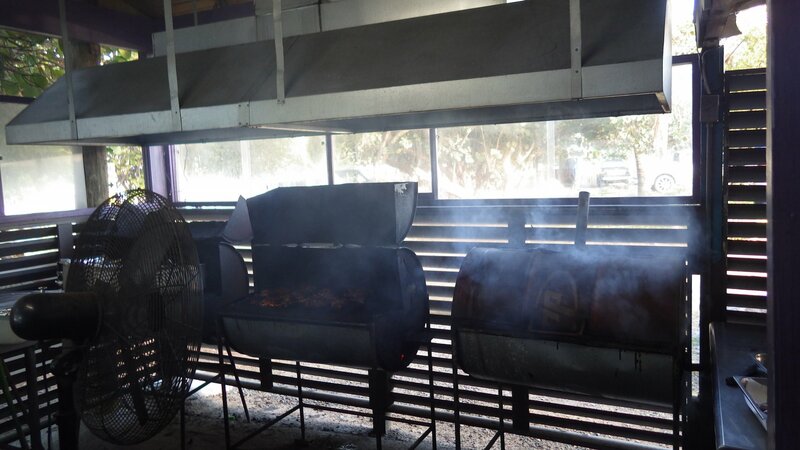 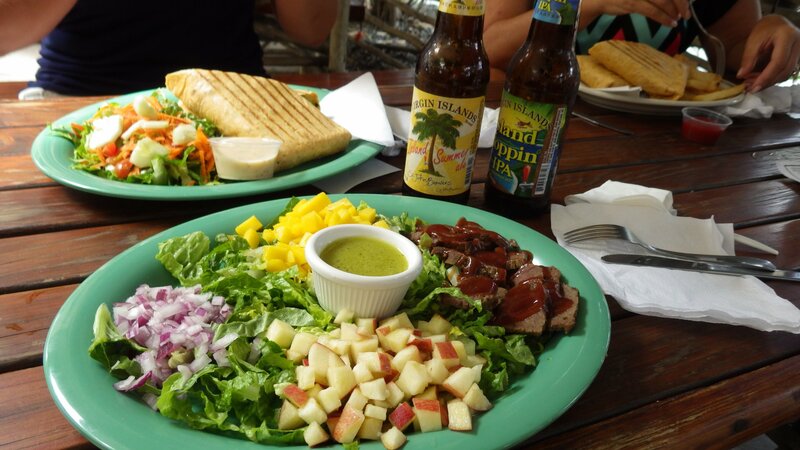 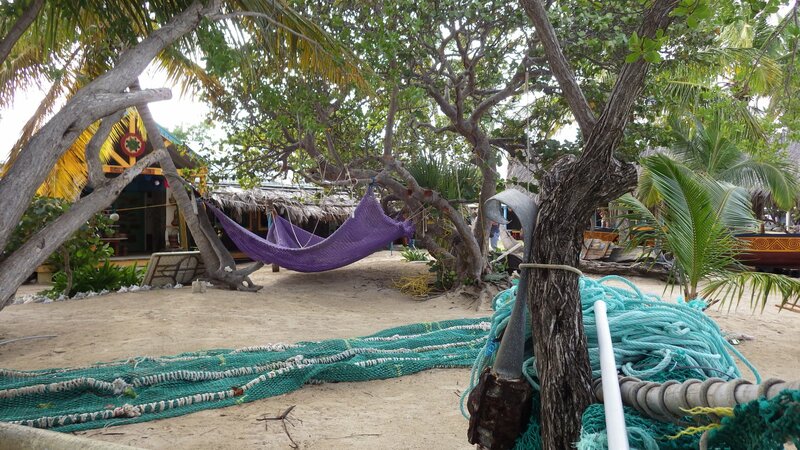 We peeked at local shops, did laundry, picked up some groceries and had a nice lunch at the beachfront restaurant. 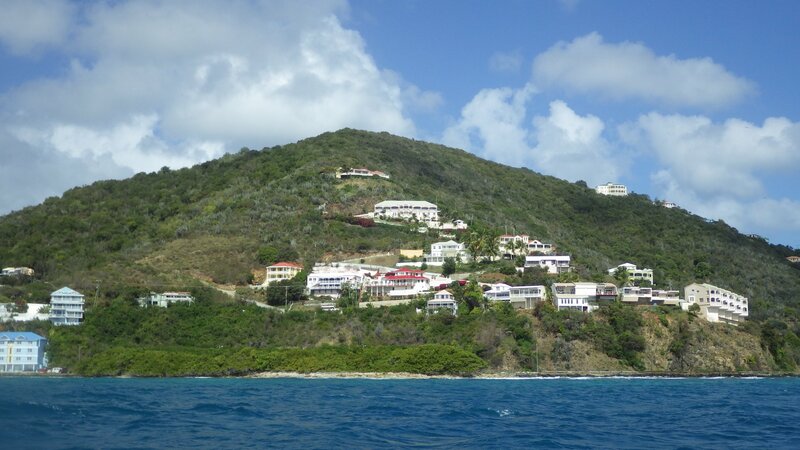 We also hiked a little up, to see some nice hilltop houses and enjoy the views. 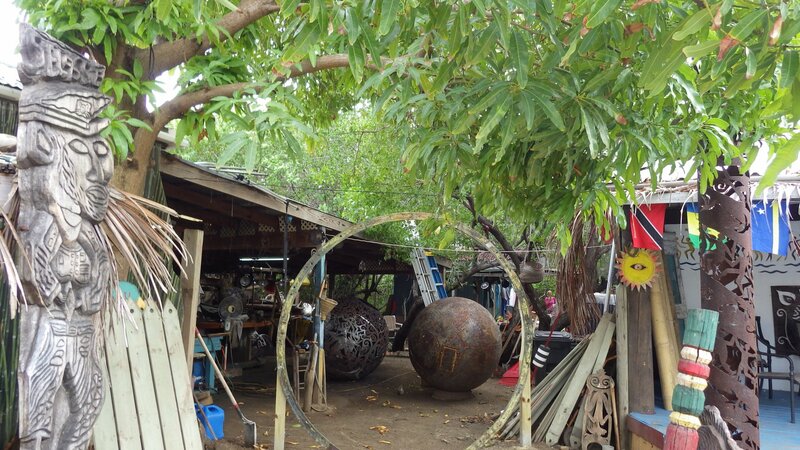 Before leaving, we filled our water tanks. 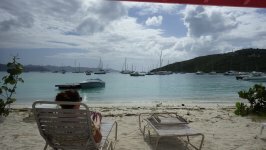 Our visa in British Virgin Islands was about to expire. 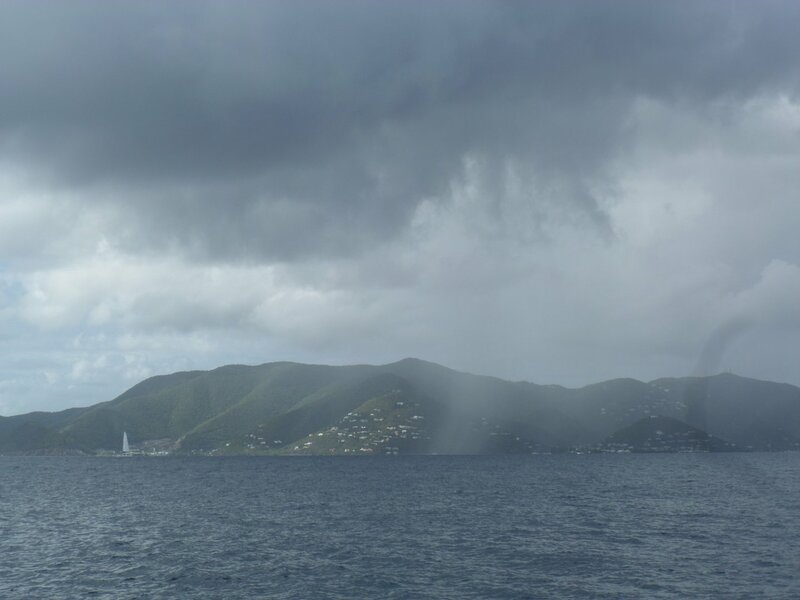 We didn't plan to extend it and were looking for a weather window to head further east and south, to the Leeward Islands. 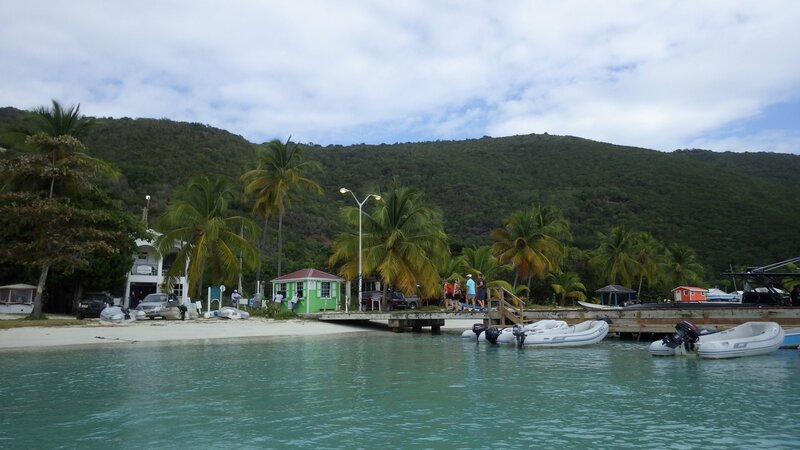 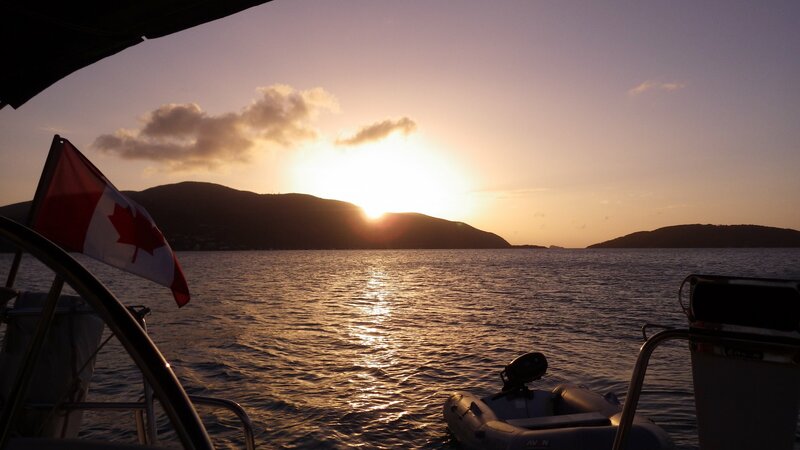 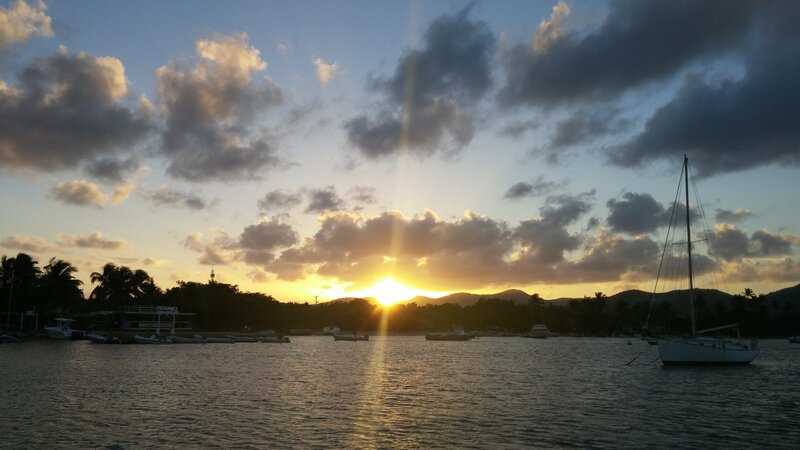 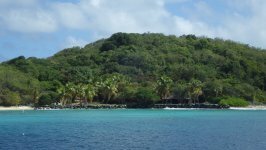 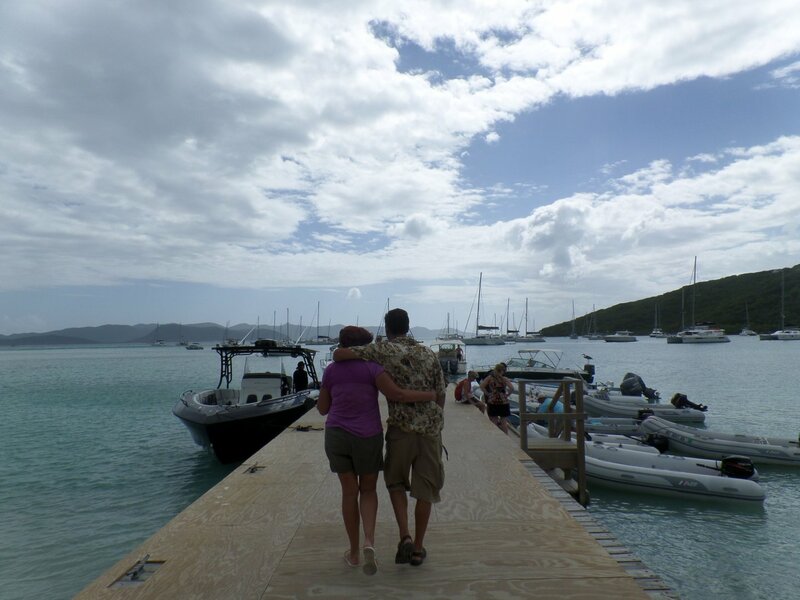 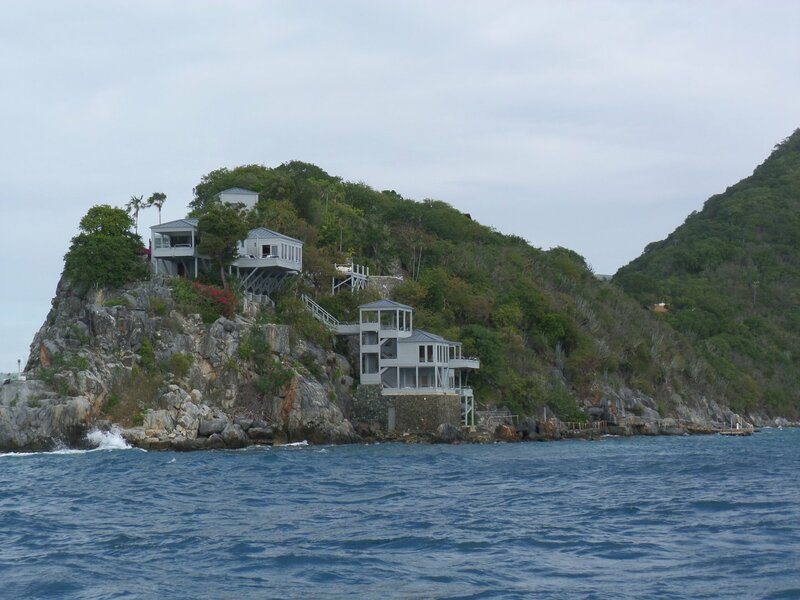 We check out BVI' customs at Gun Creek and moved to a "Cruisers Anchorage" at Prickly Pear Island, west of Saba Rock, staging our next day's departure to St. Maarten.